Matsuyama castle (松山城) is located on Shiroyama mountain of about 100 meter height from hillside at the center of Matsuyama city. 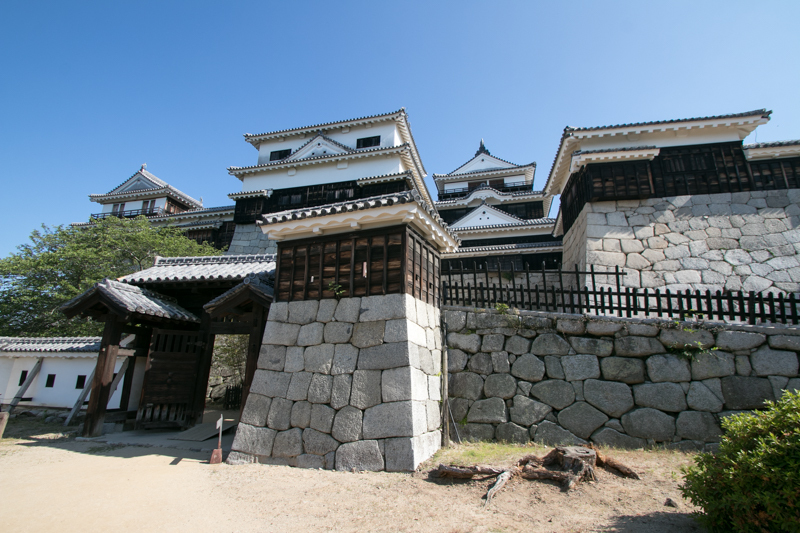 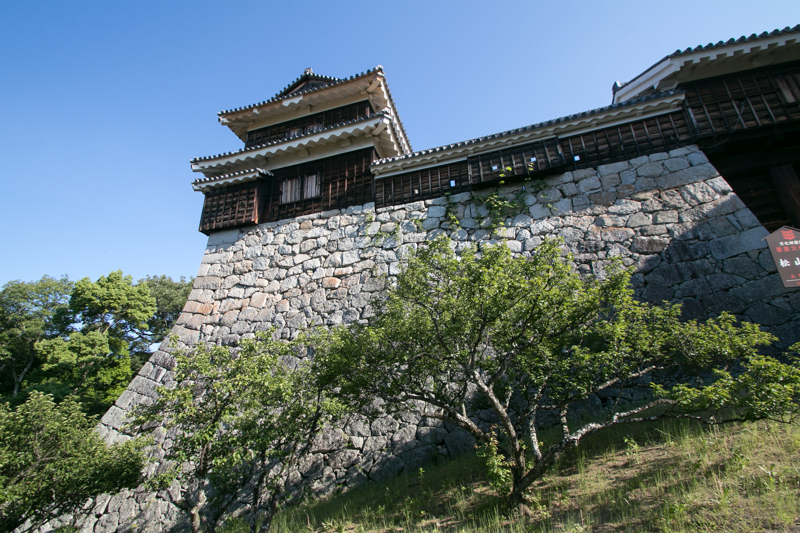 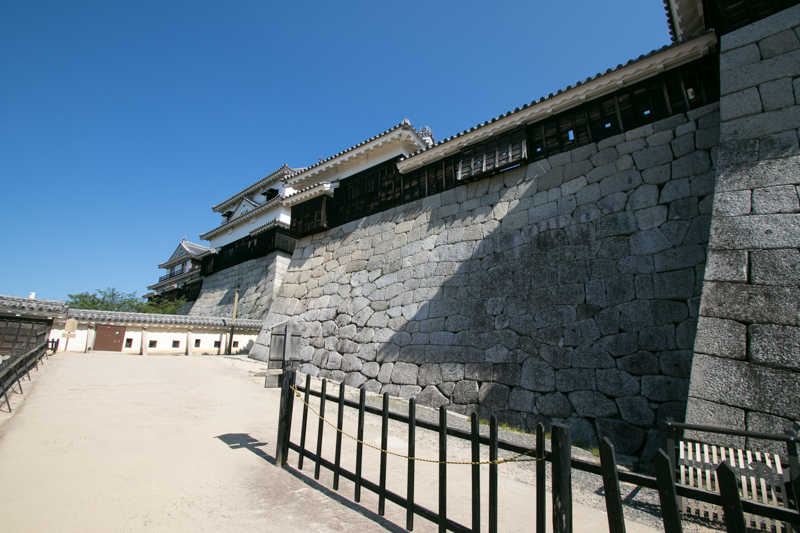 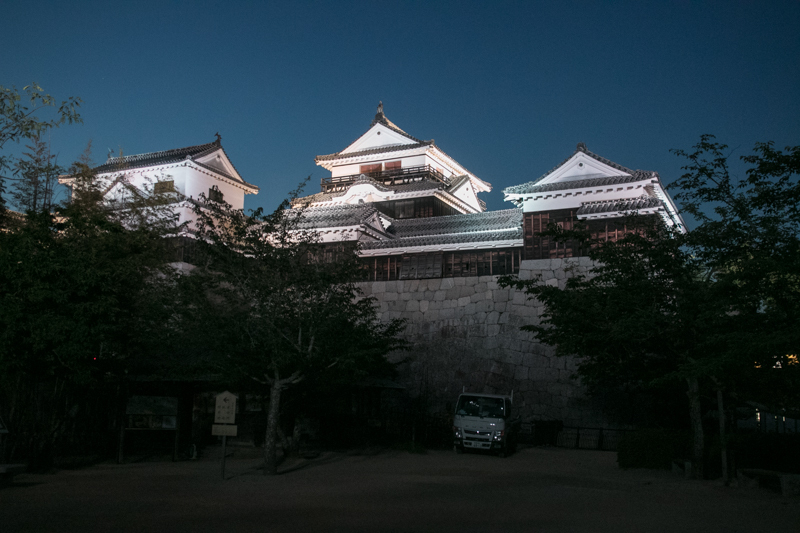 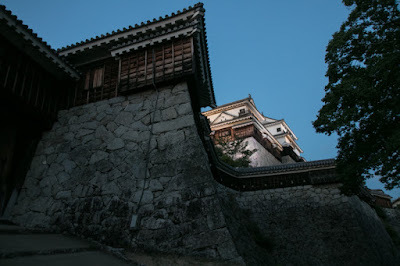 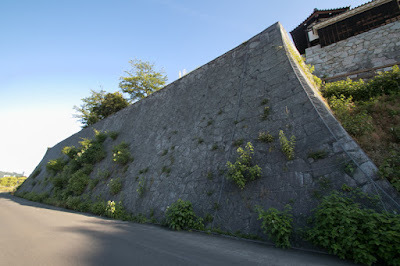 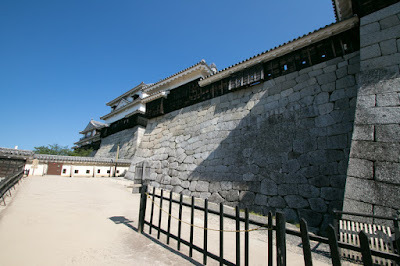 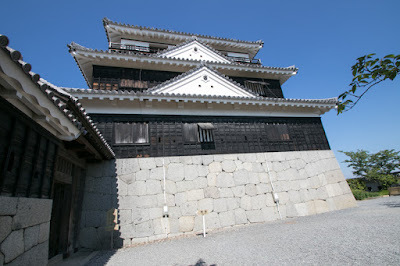 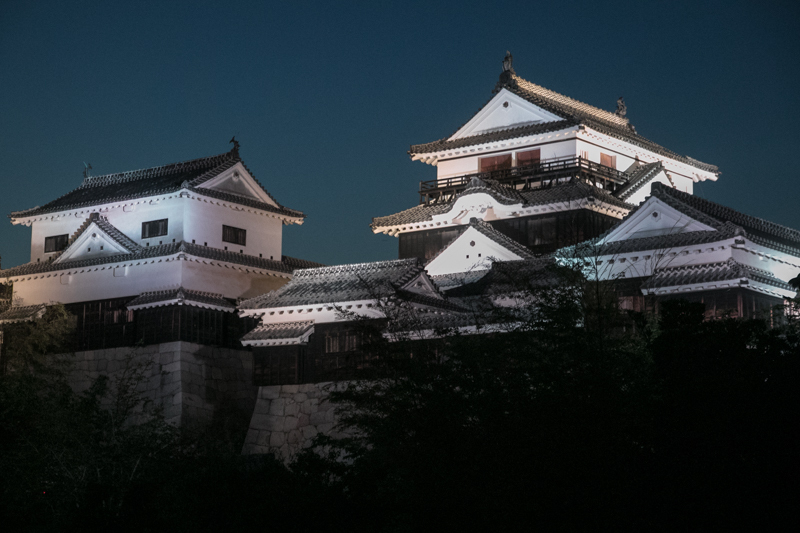 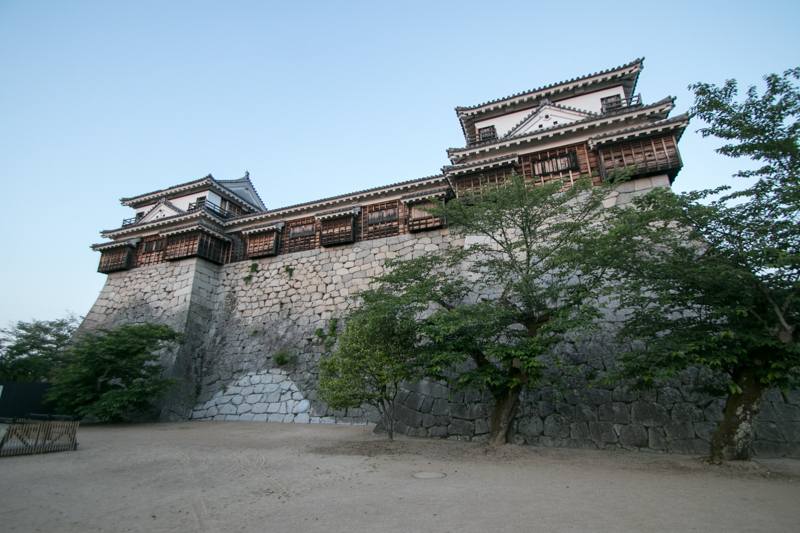 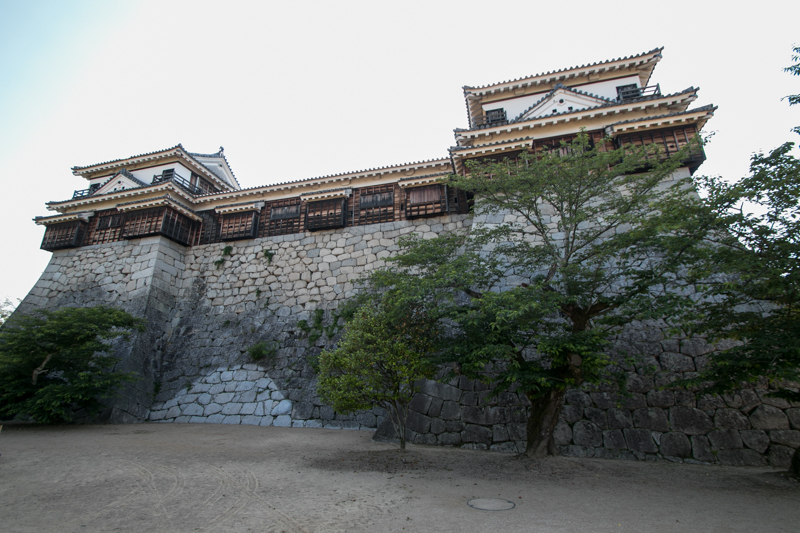 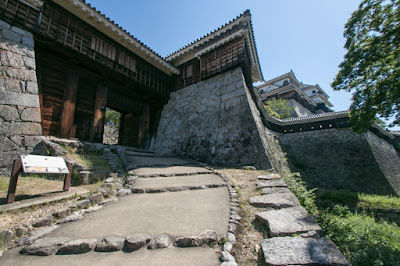 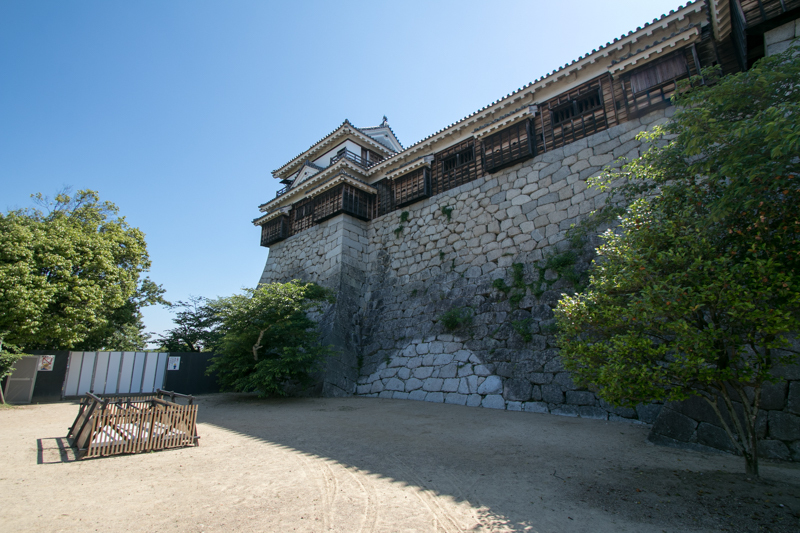 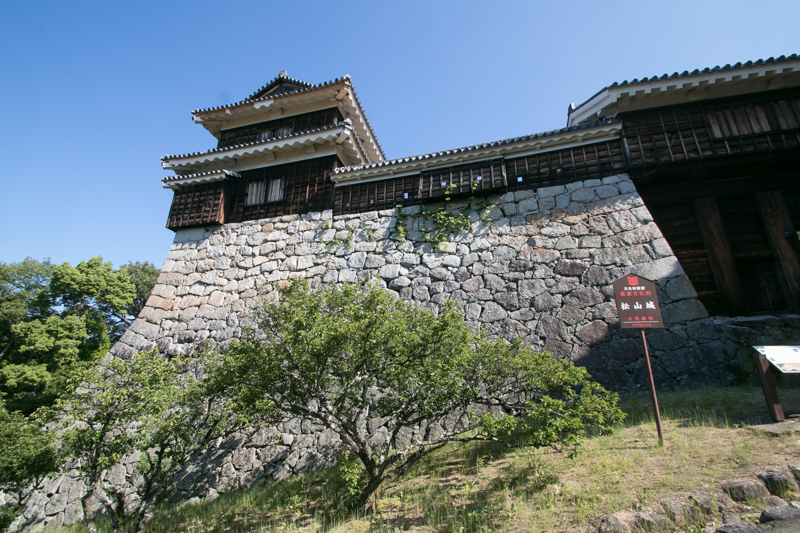 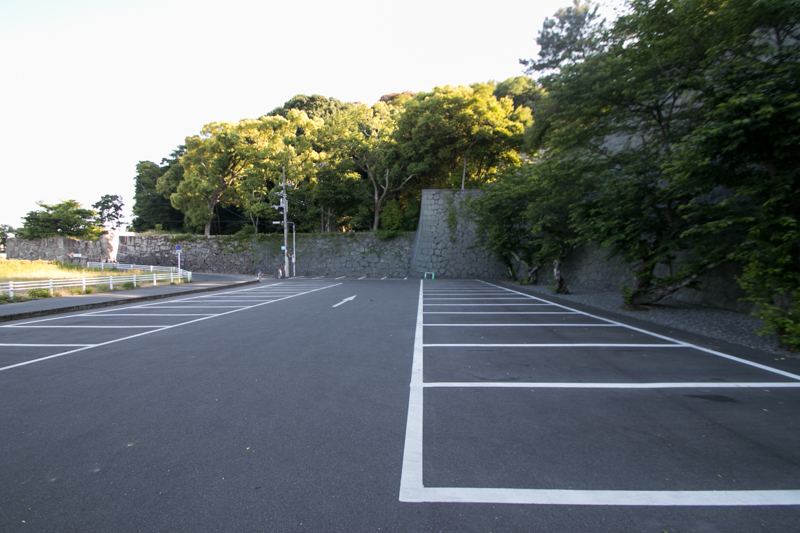 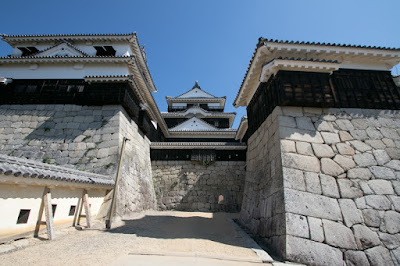 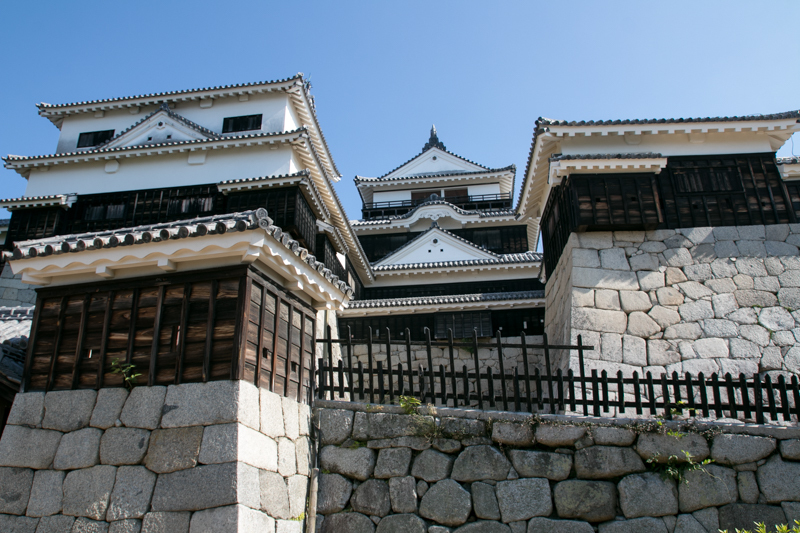 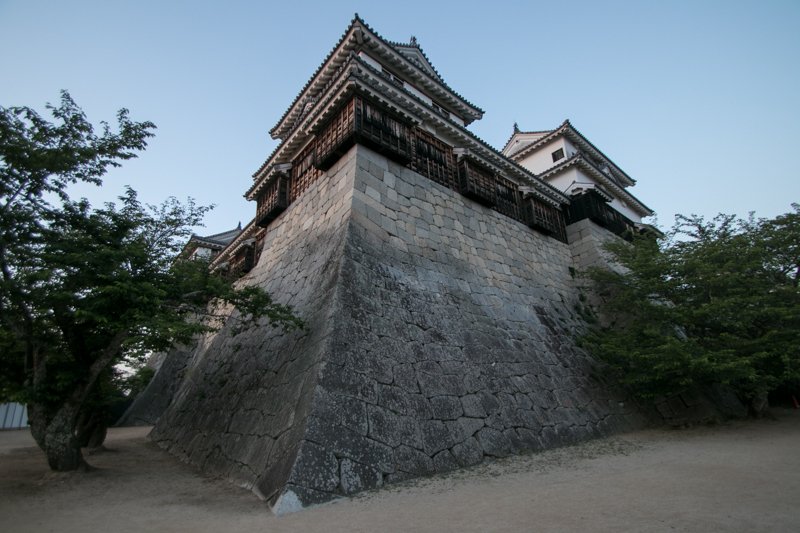 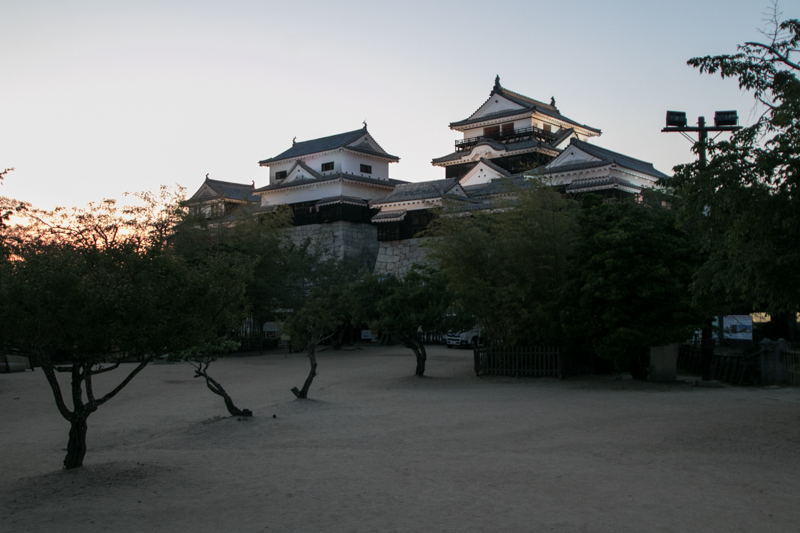 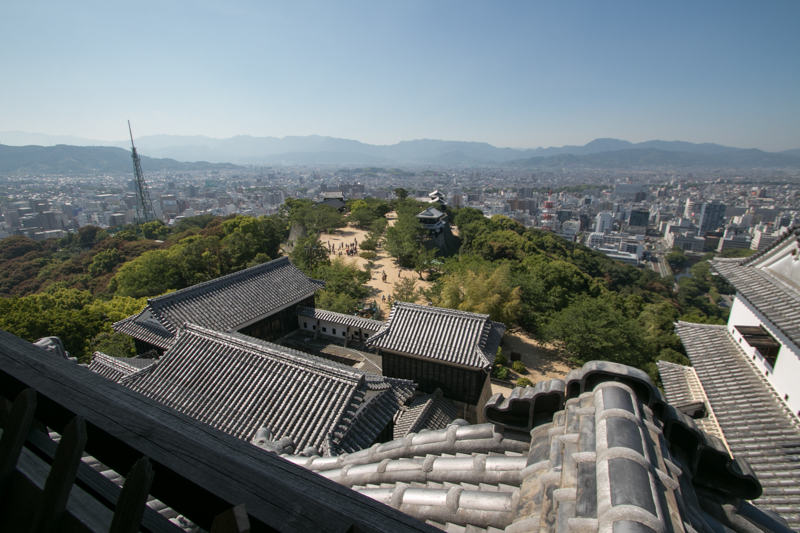 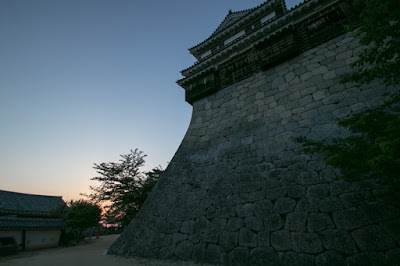 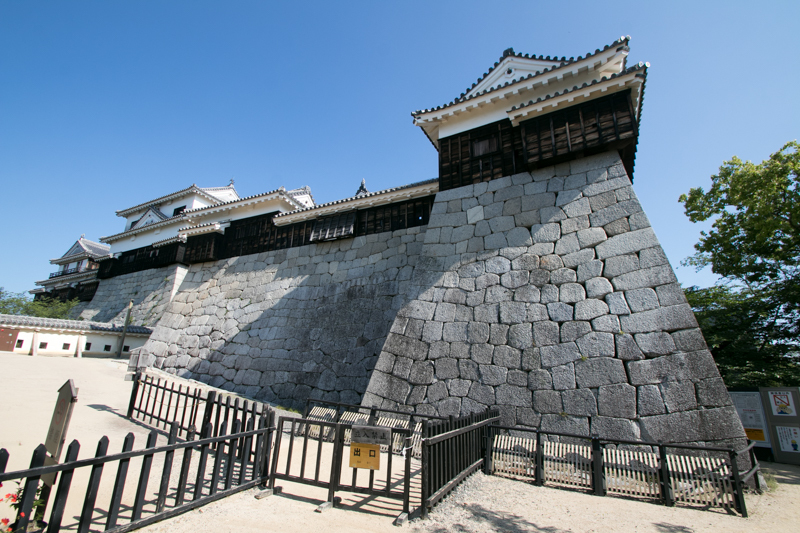 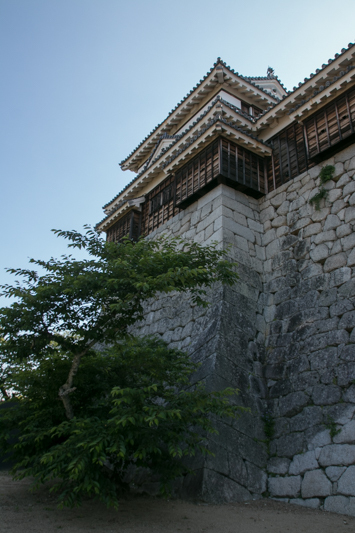 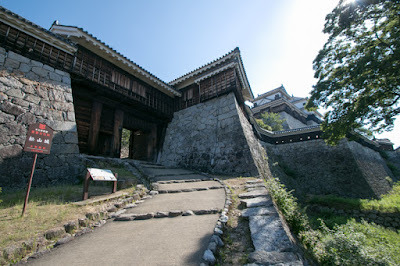 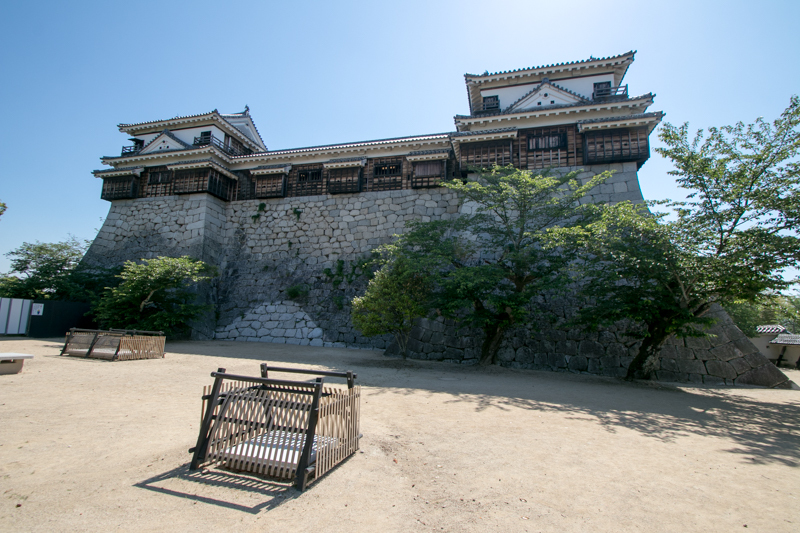 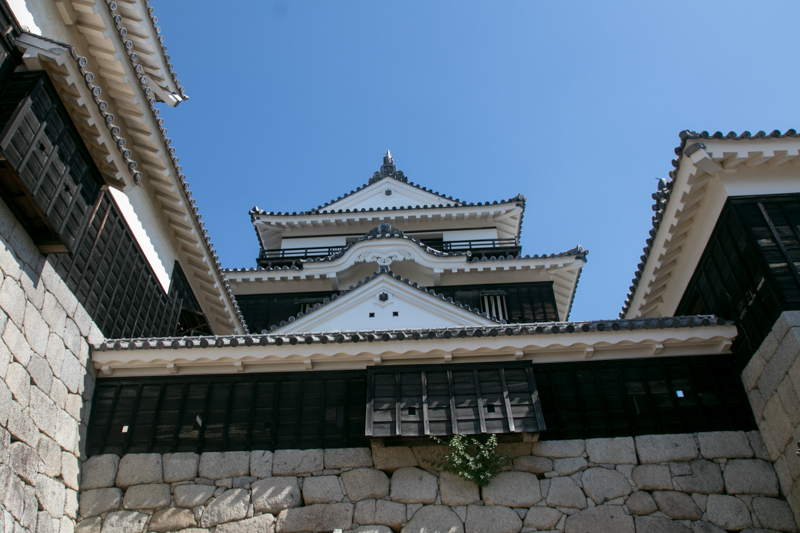 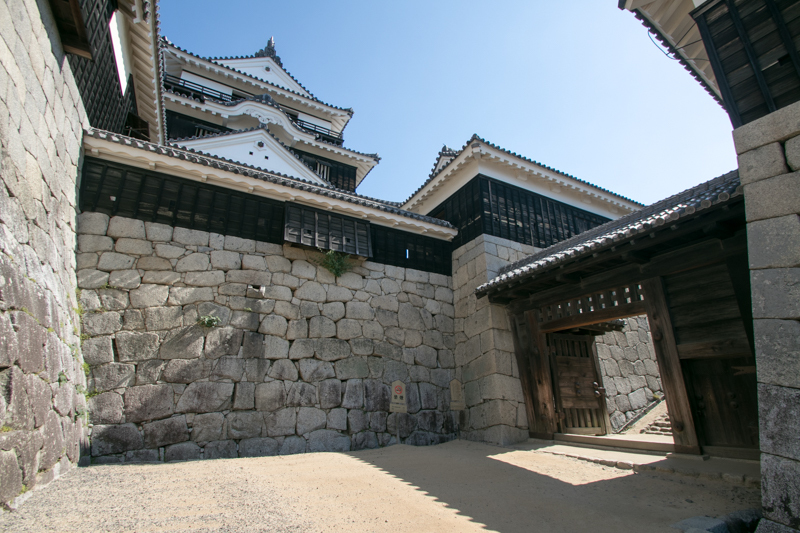 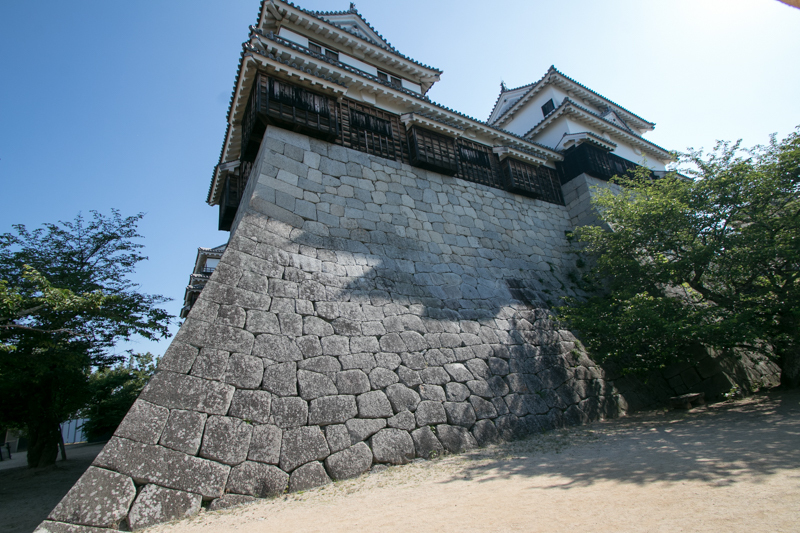 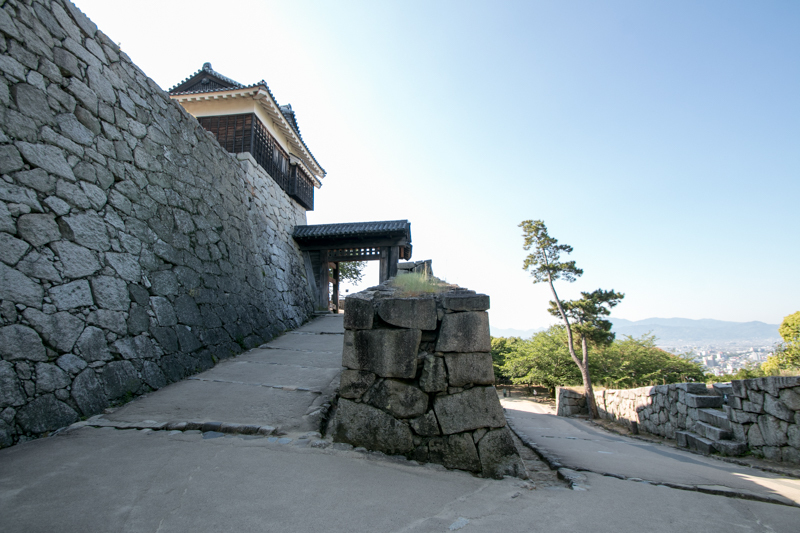 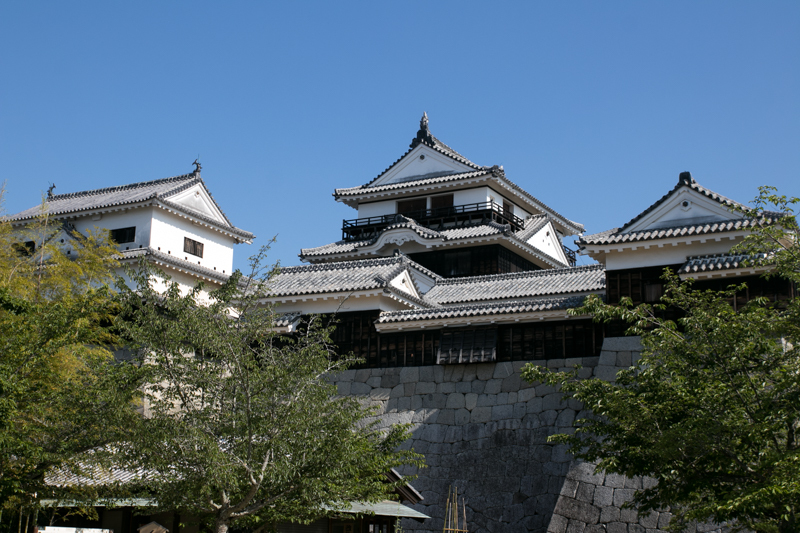 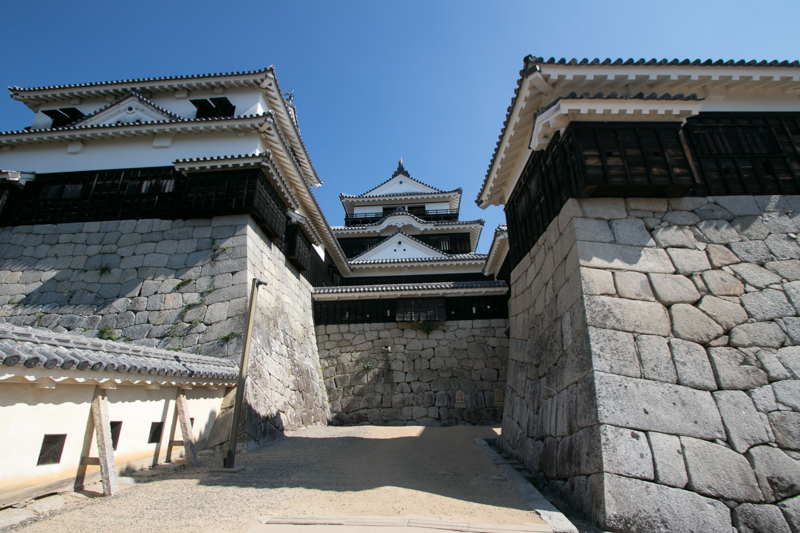 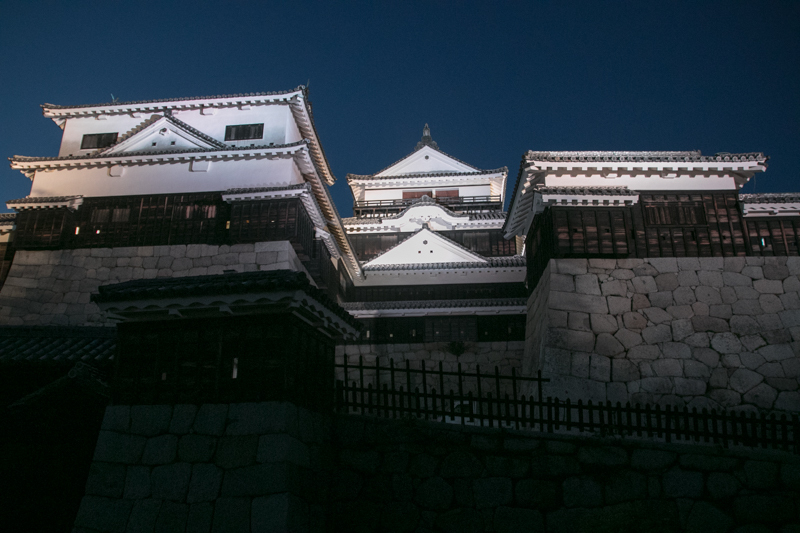 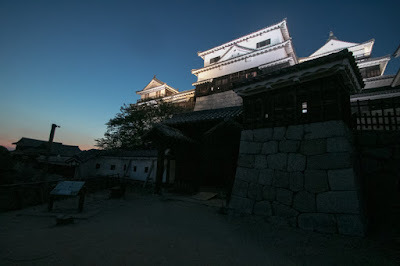 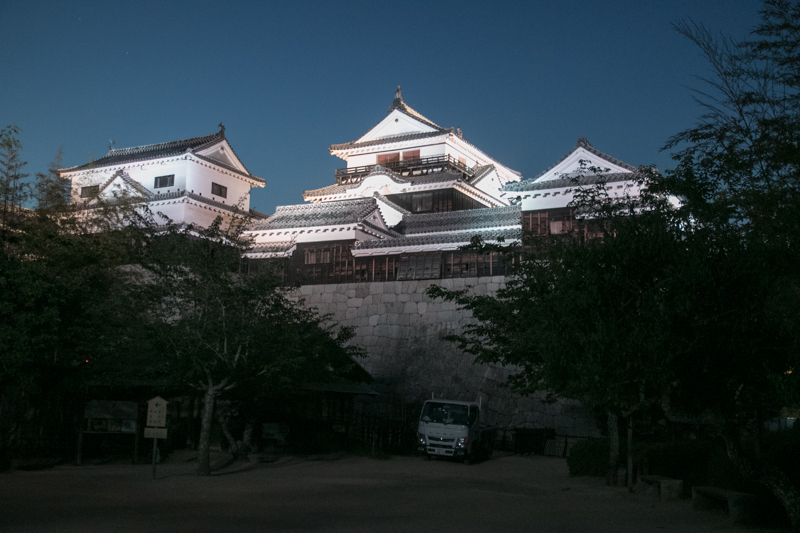 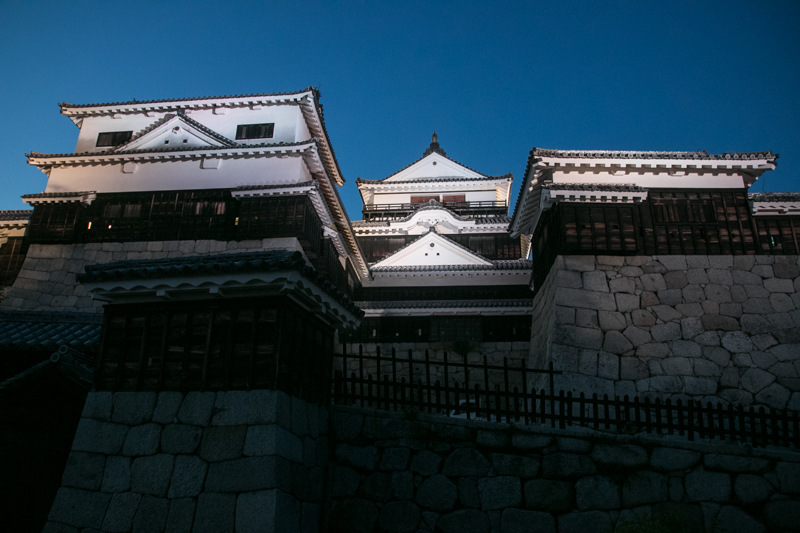 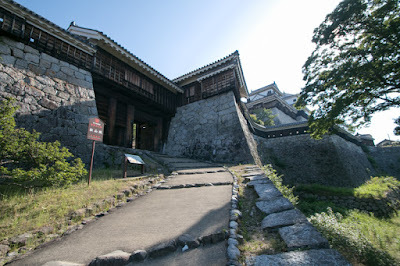 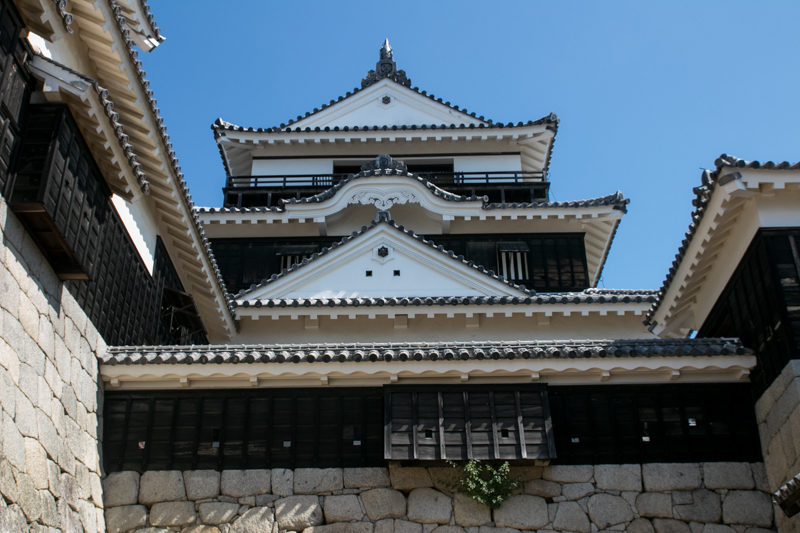 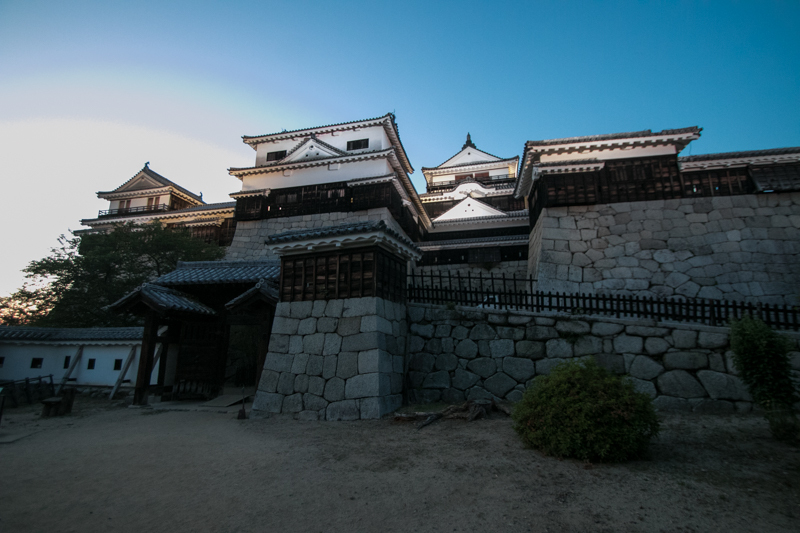 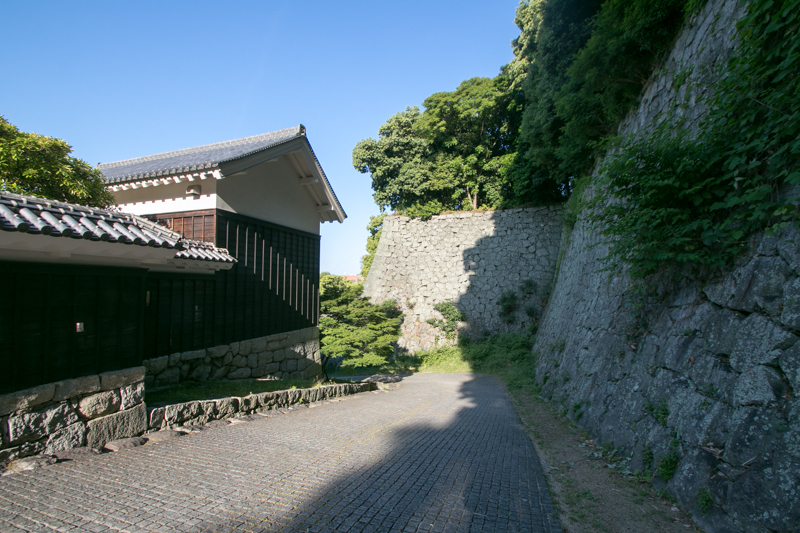 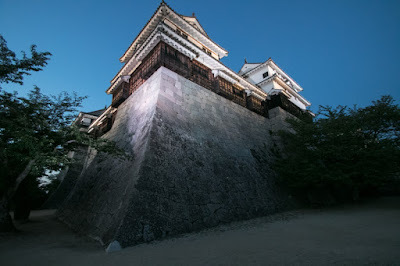 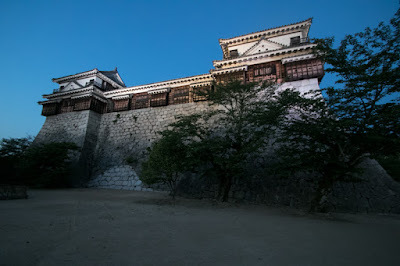 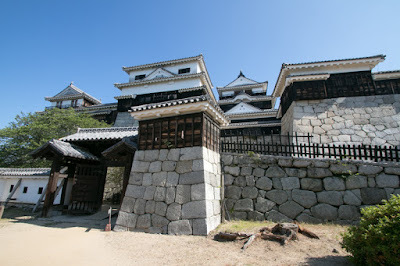 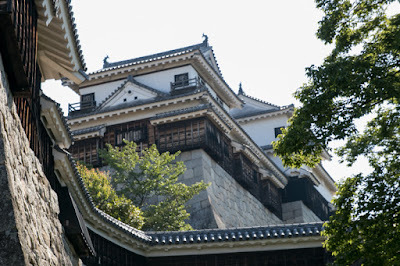 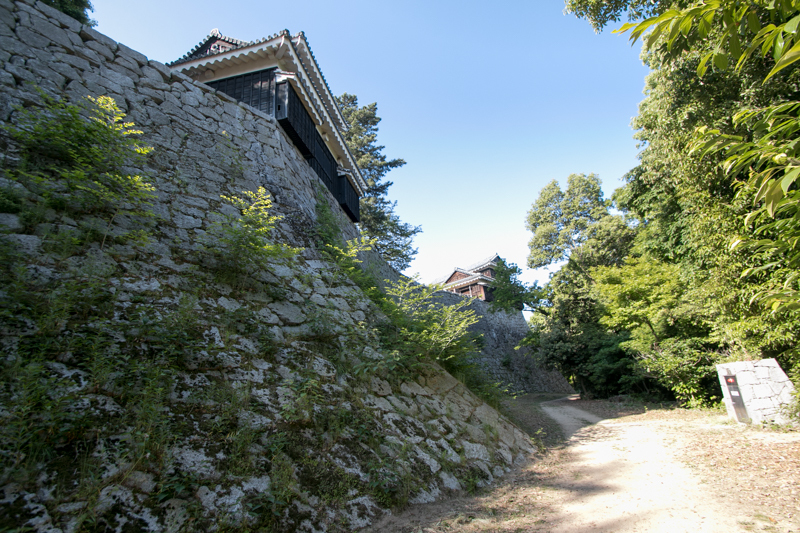 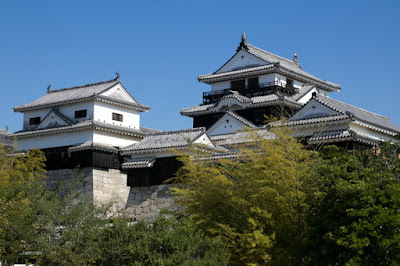 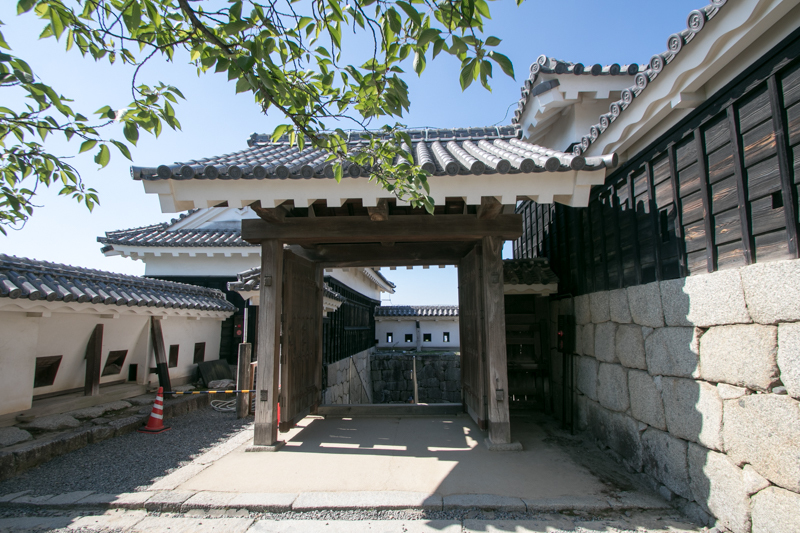 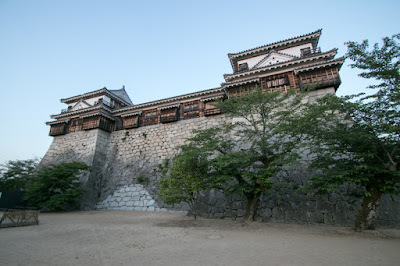 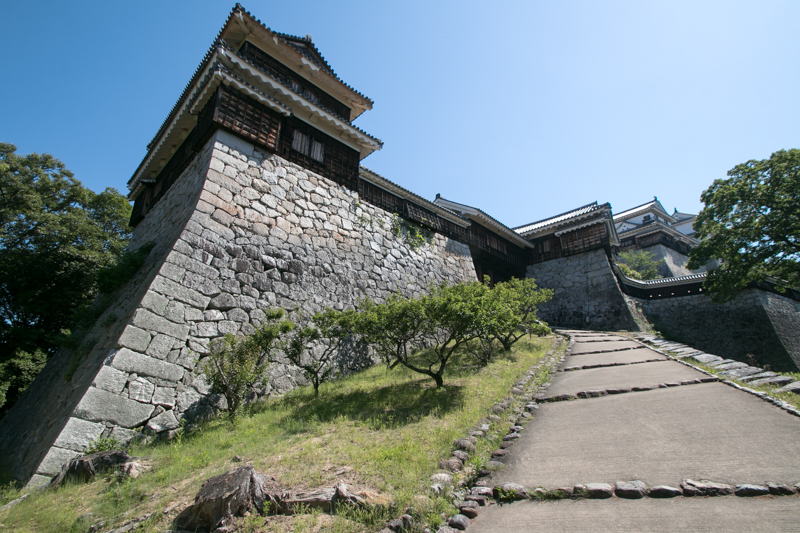 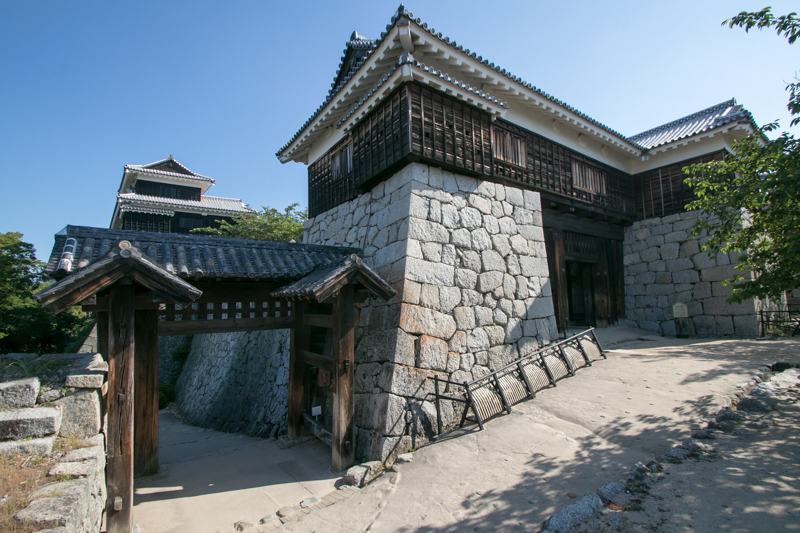 Matsuyama castle is one of 12 castles having original main tower, and line of black walls used for turrets and fences is only compared with the line of white walls at Himeji castle (Okayama prefecture). 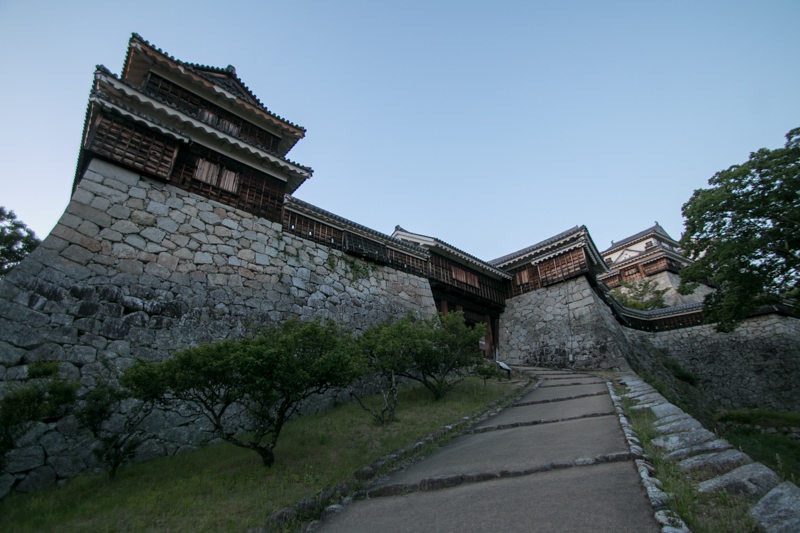 A complex of low story buildings on the winding stone walls reminds us medieval castles of Western countries. 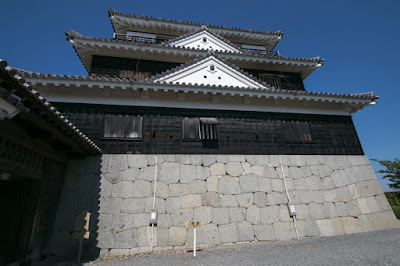 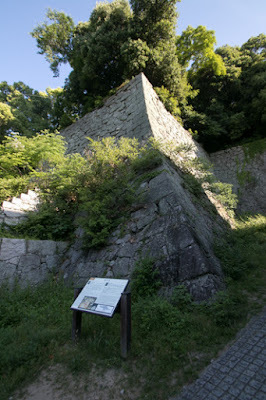 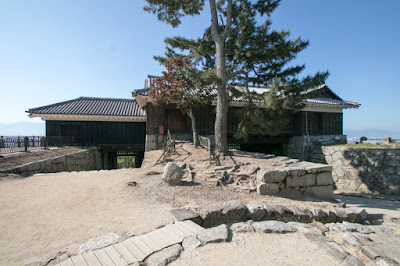 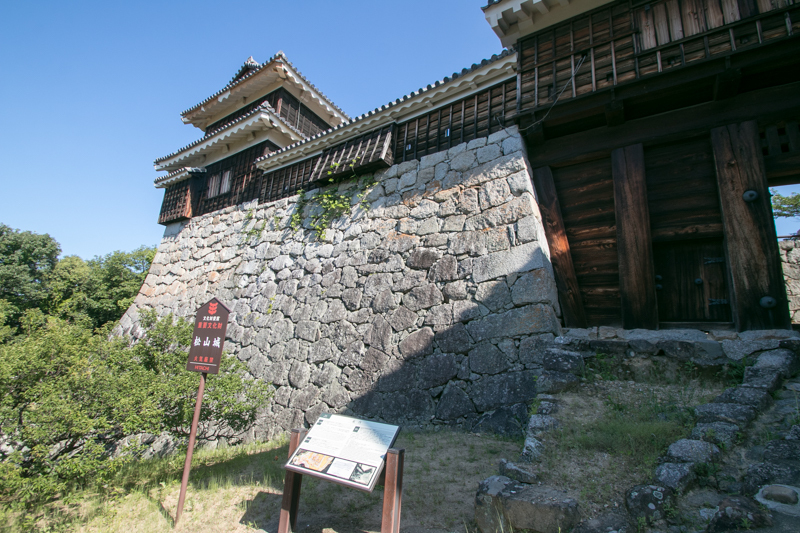 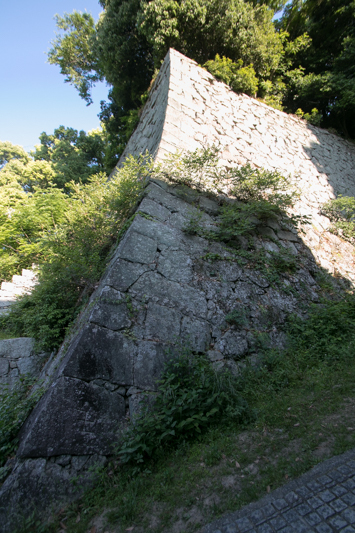 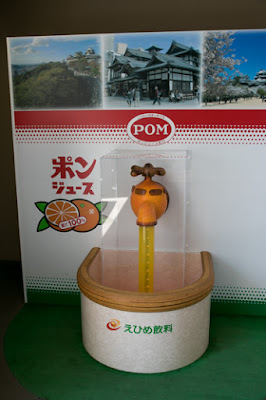 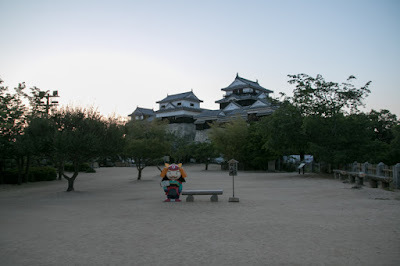 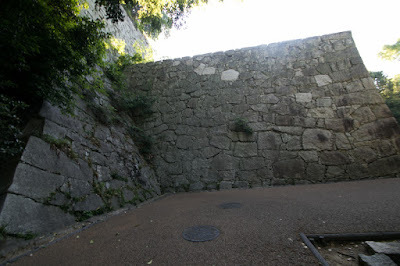 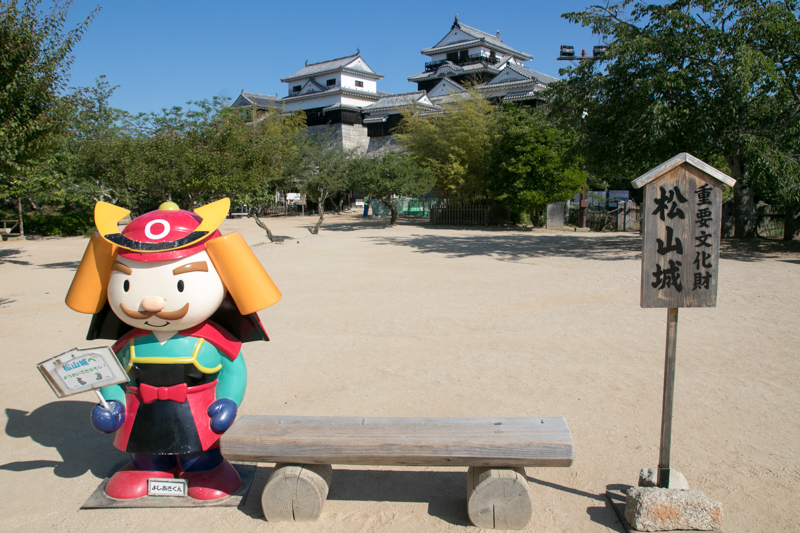 It is confusing that there is another Matsuyama castle also has original main tower exists in Okayama prefecture. 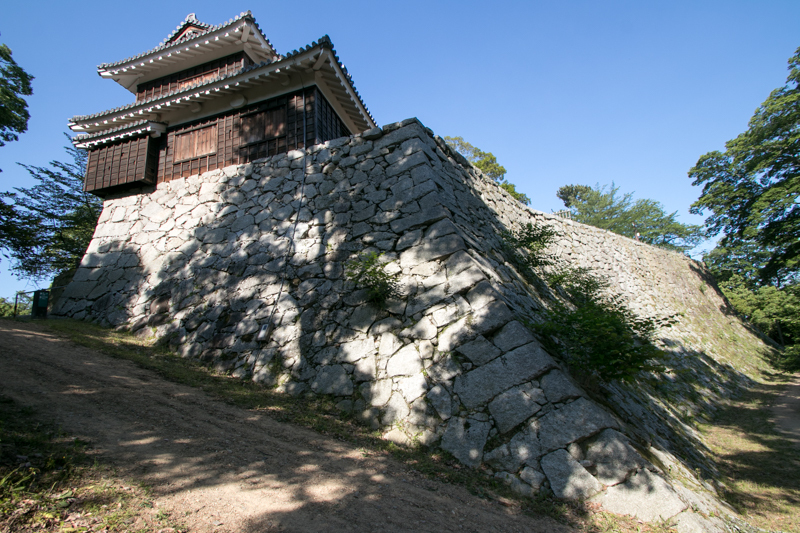 To distinguish them, this castle is sometimes called as Iyo Matsuyama castle, and the other is called as Bicchu Matsuyama castle. 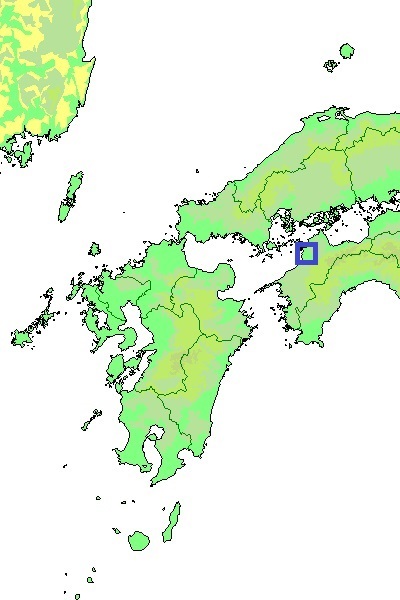 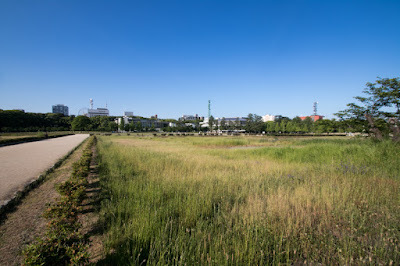 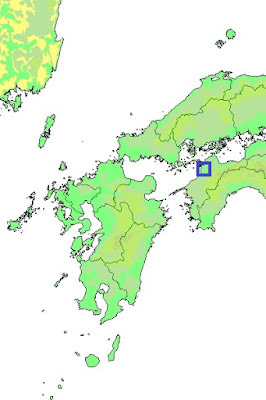 Historically the center of Iyo province (Ehime prefecture) was Imabari area facing Setonaikai sea, but Matsuyama area is a good agricultural area in vast plain and prospered. 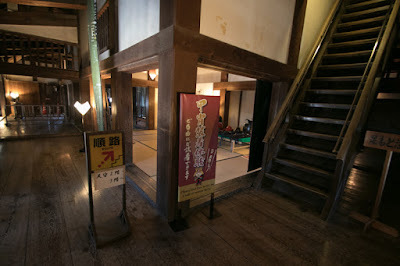 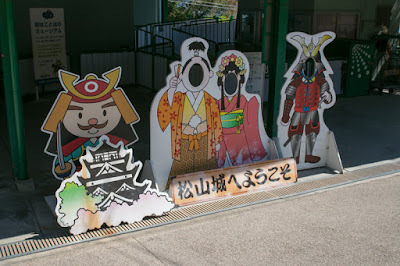 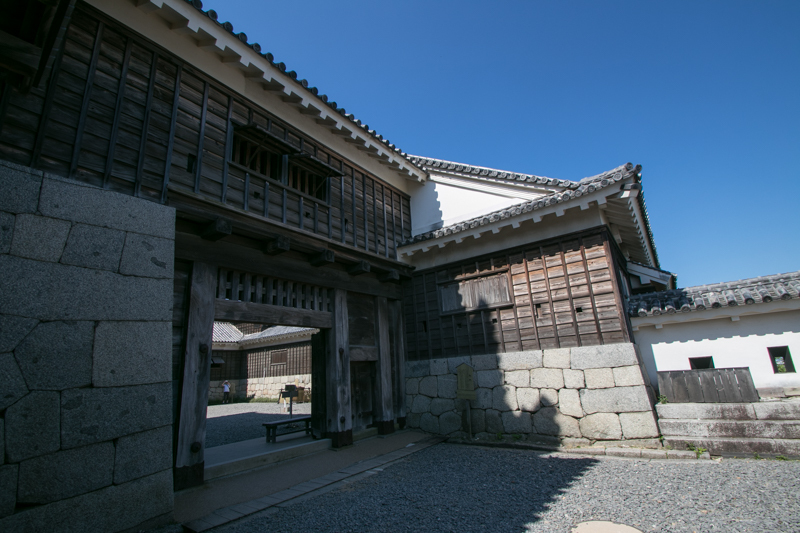 In medieval era Matsuyama era was governed by Kono clan resided Yuzuki castle (Ehime prefecture) at current Dogo-Onsen spa area. But since the middle of 16th century Kono clan significantly lost their power by internal conflict and only survived following to neighbor strong warlords such as Mouri clan or Chosokabe clan. After the Shikoku expedition of central ruler Hideyoshi Toyotomi (1537-1598) Kobayakawa clan which was the chancellor of Mouri clan once held Iyo province, but after Kyushu expedition in 1587, Masanori Fukushima (1561-1624), the distant relative of Hideyoshi and who was known as a brave general, became the lord of north half Iyo province. 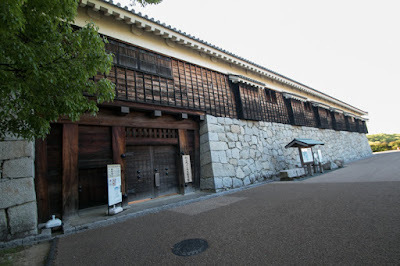 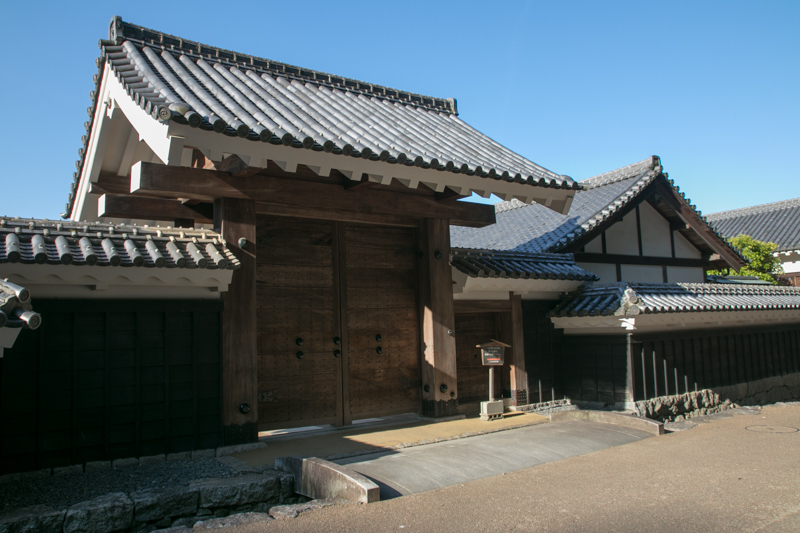 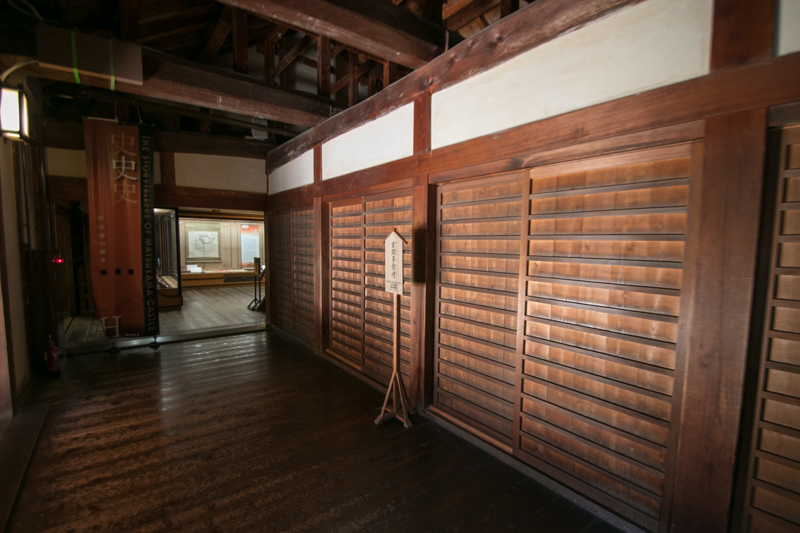 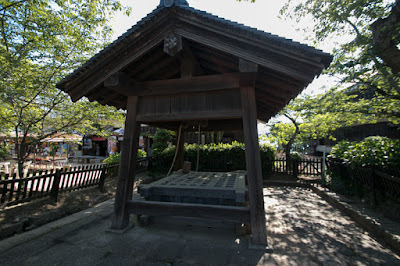 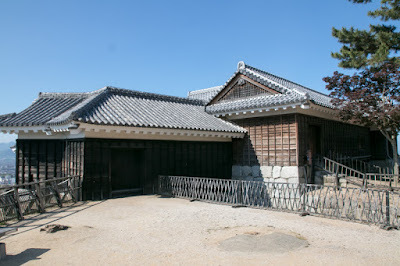 In 1595, Masanori Fukushima was moved to the lord of Kiyosu castle at Owari province (western half of Aichi prefecture), and his colleague Yoshiakira Kato (1563-1631) was appointed as a governor of Matsuyama area. 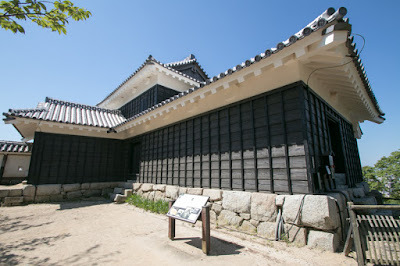 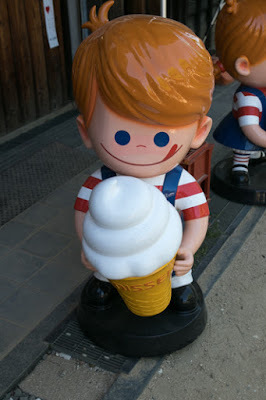 Yoshiakira served Hideyoshi from his youth and activated the battle of Shizugatake in 1583 along with Masanori Fukushima, thus they were regarded as seven braves at Shizugatake. 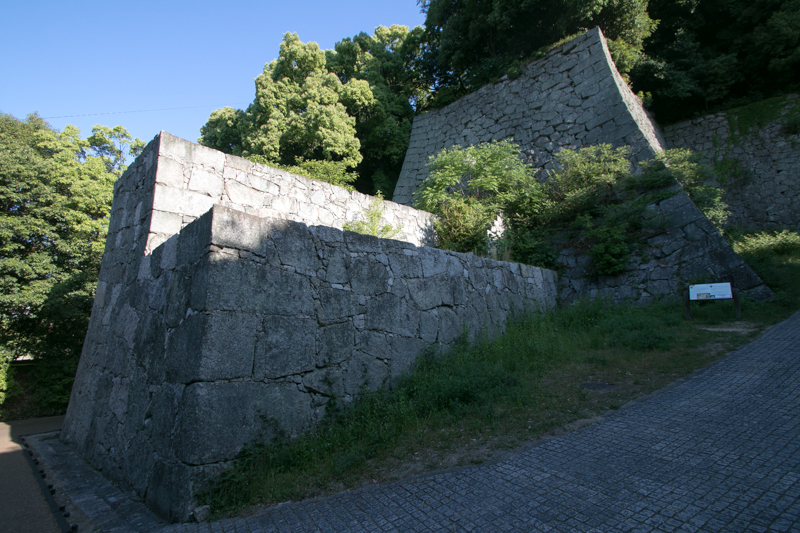 Later Yoshiakira lead naval forces and participated in many battles, and promoted to large lord. 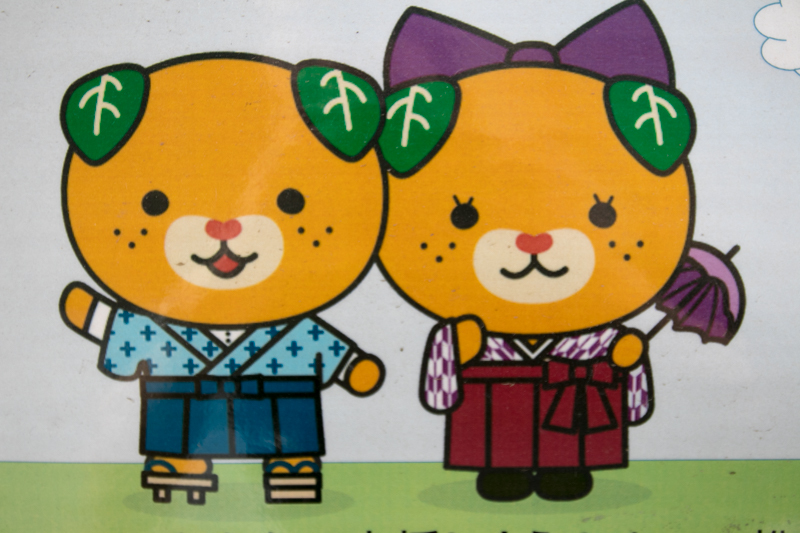 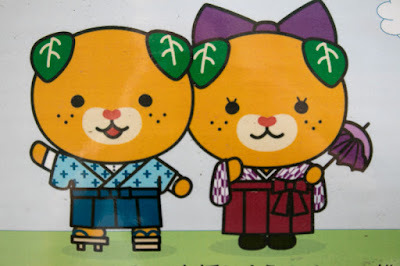 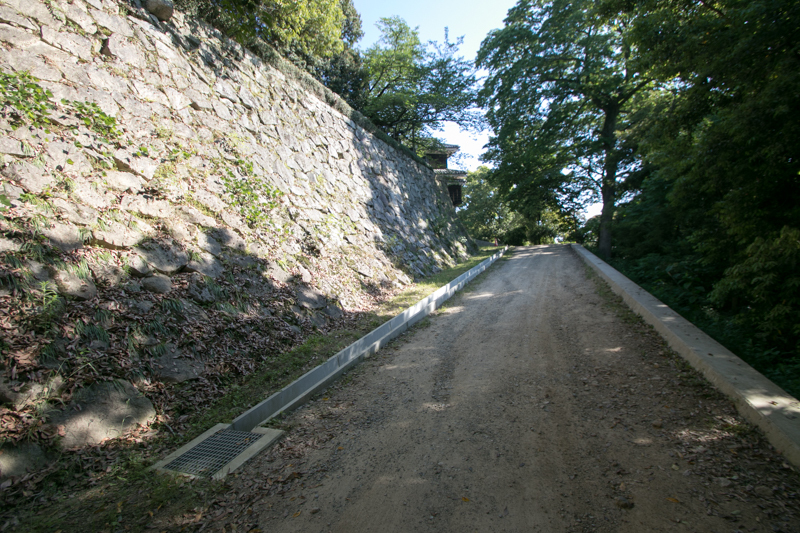 After the death of Hideyoshi in 1598, the battle of Sekigahara occurred between Ieyasu Tokugawa (1543-1616), the largest lord under Toyotomi government, and Mitsuhari Ishida (1560-1600), the chief magistrate of the government. 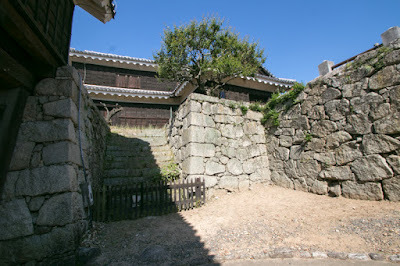 As forefront generals including Yoshiakira Kato had antipathy against Mitsunari who exercised power under Hideyoshi, Kato clan belonged to Ieyasu and activated at the main battle. At the same time, Mouri clan which was the large lord and belonged to Mitsuhari, assaulted Matsuyama area and attacked Masaki castle, the main base of Kato clan. But remaining Kato force had only small number of soldiers but broke Mouri army by plot and night attack. After the battle, Ieyasu who won the battle gave larger territory to Yoshiakira. 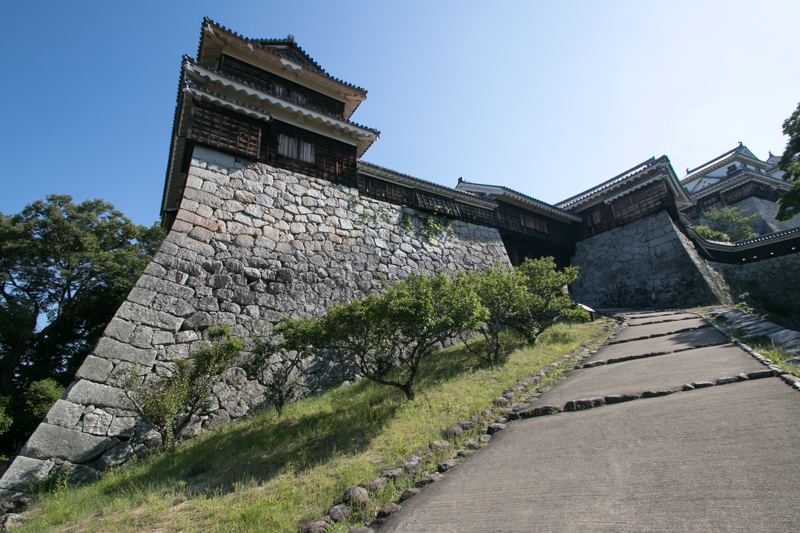 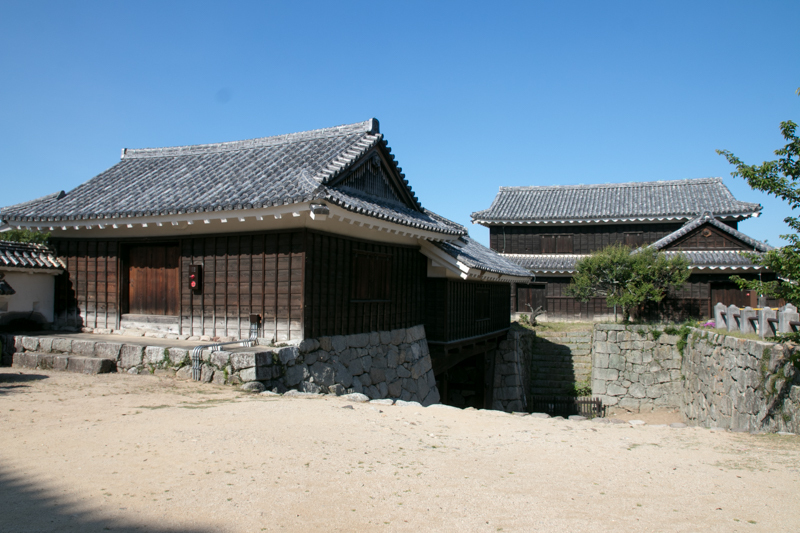 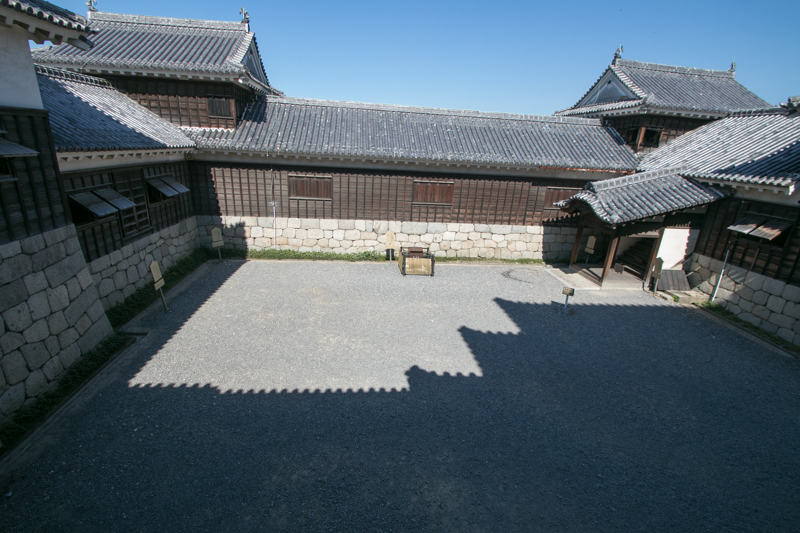 In 1601, Yoshiakira was given permission to build a new castle by Edo shogunate, and started construction. 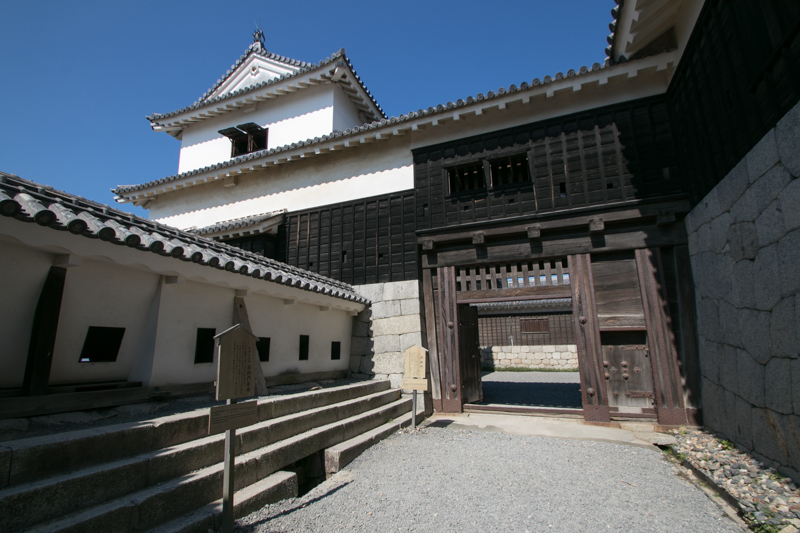 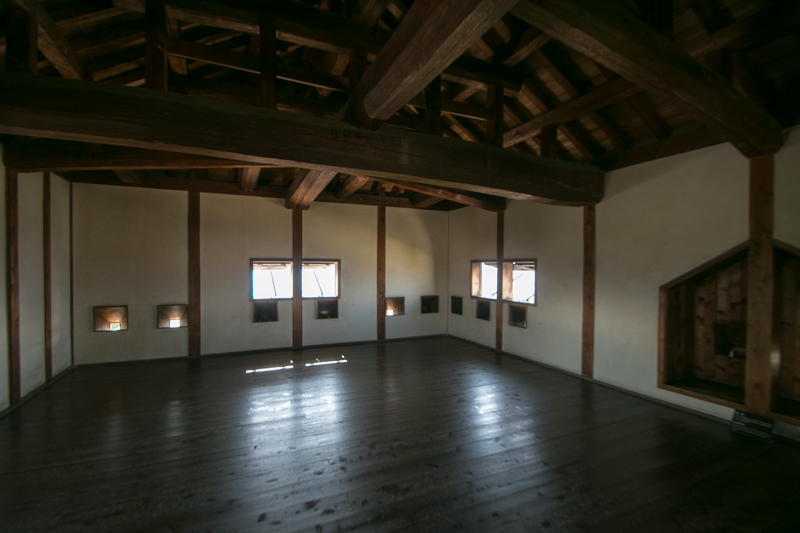 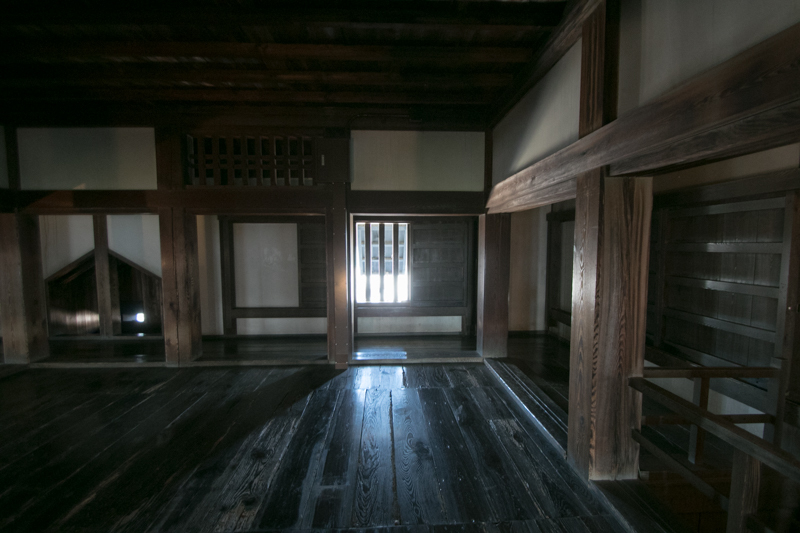 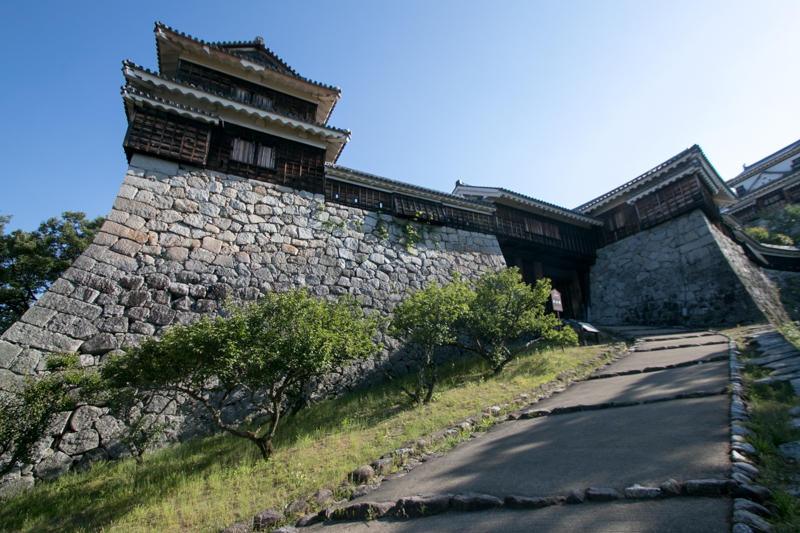 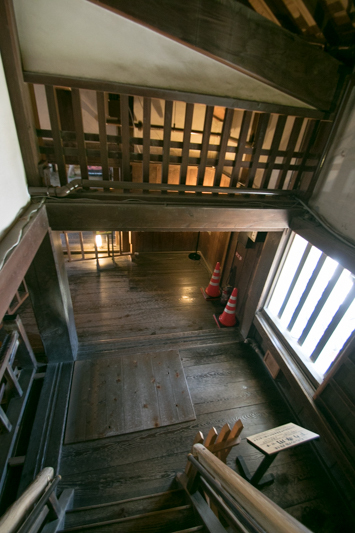 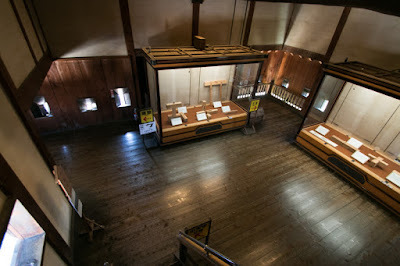 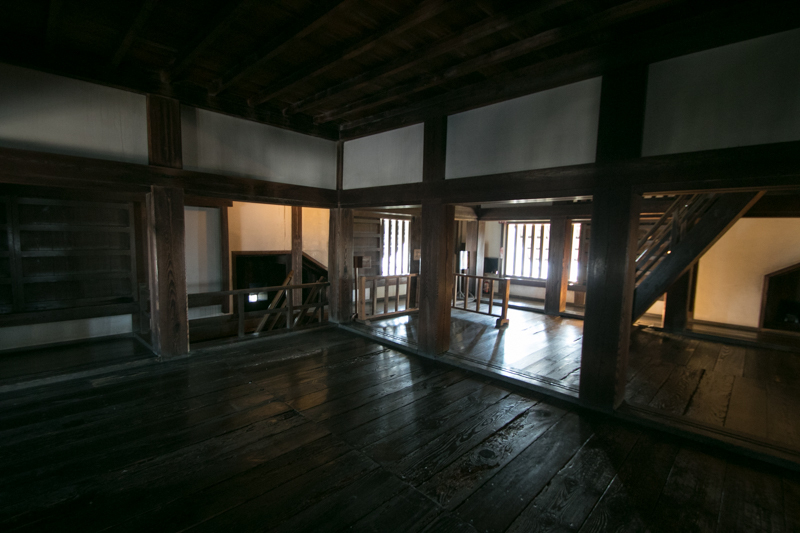 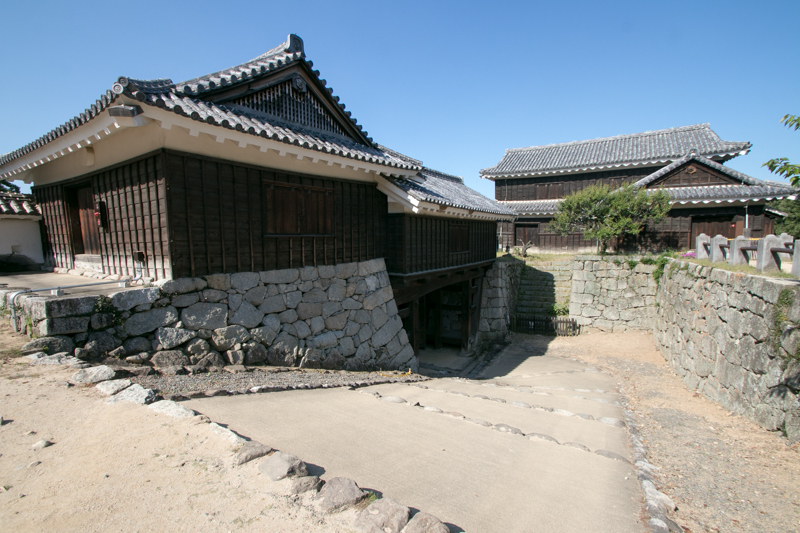 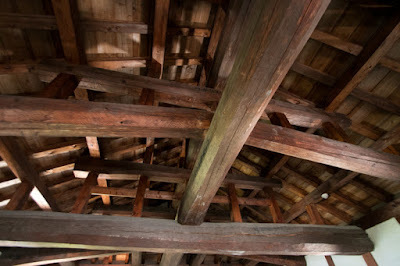 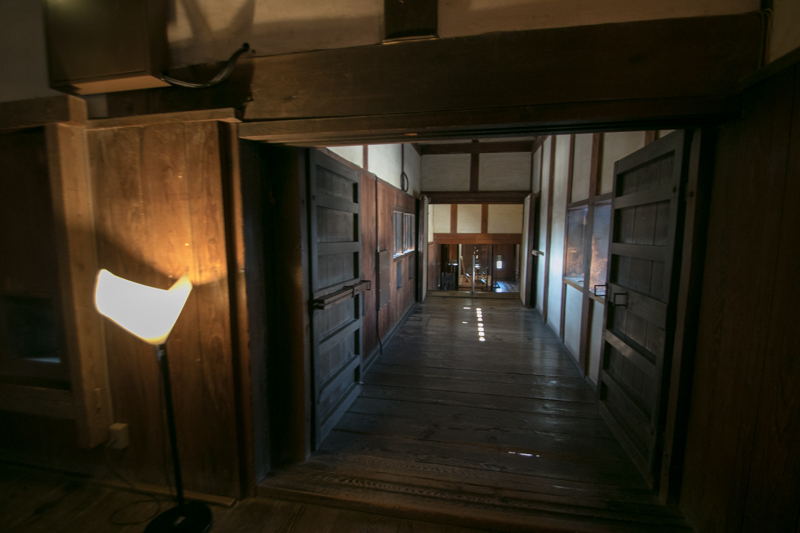 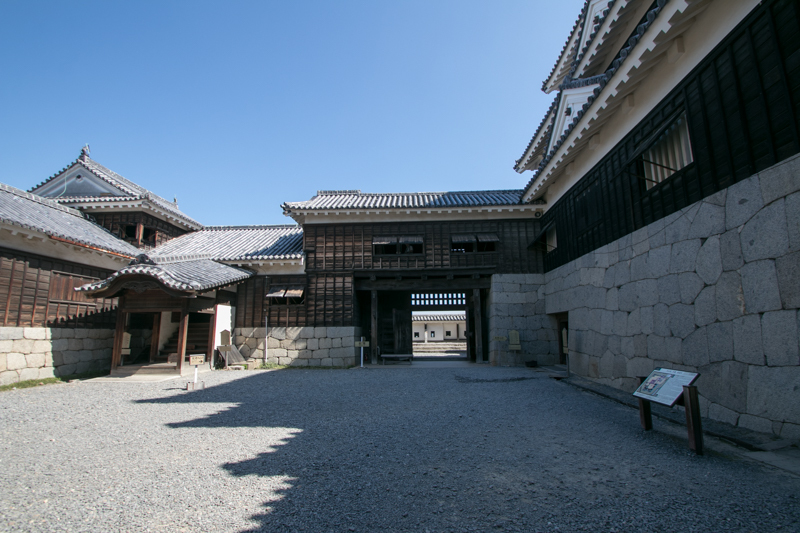 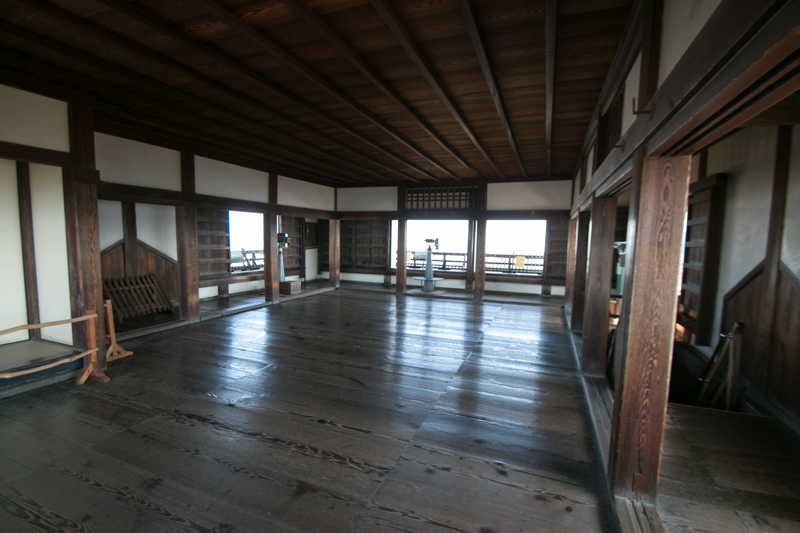 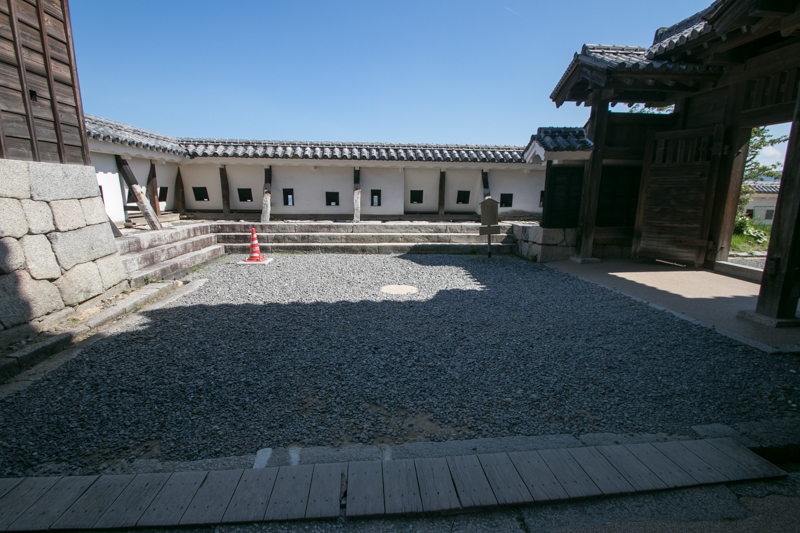 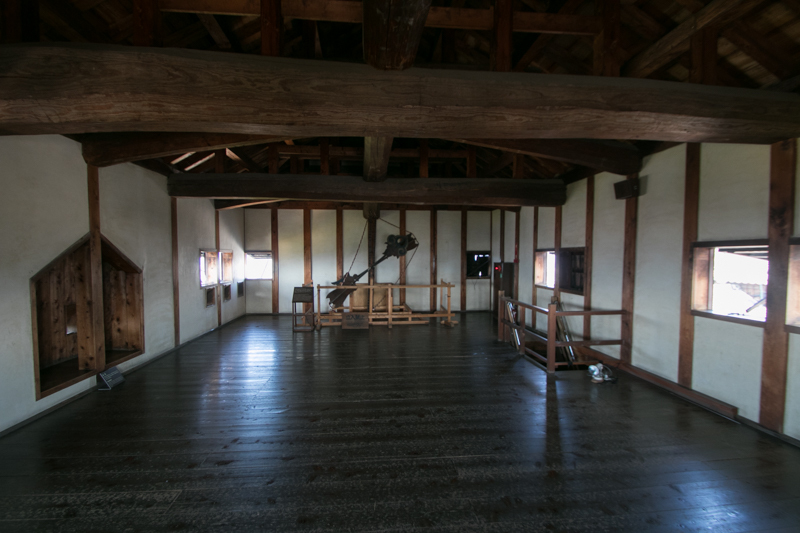 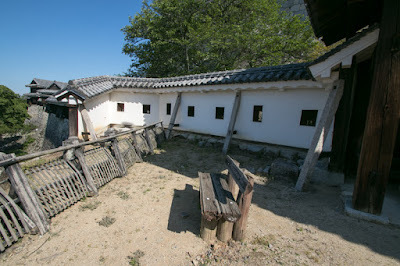 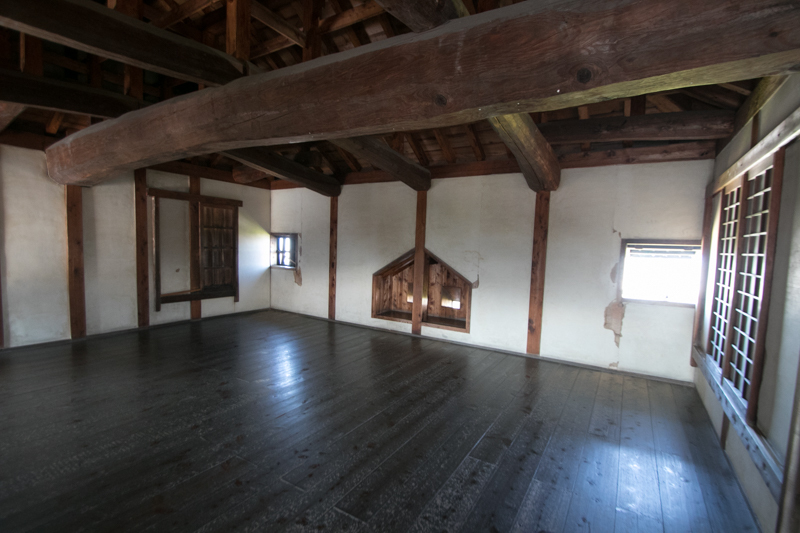 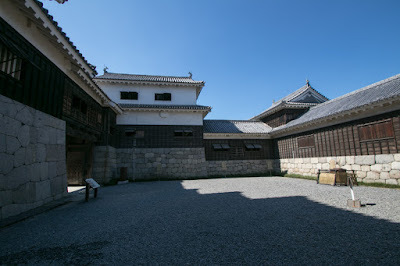 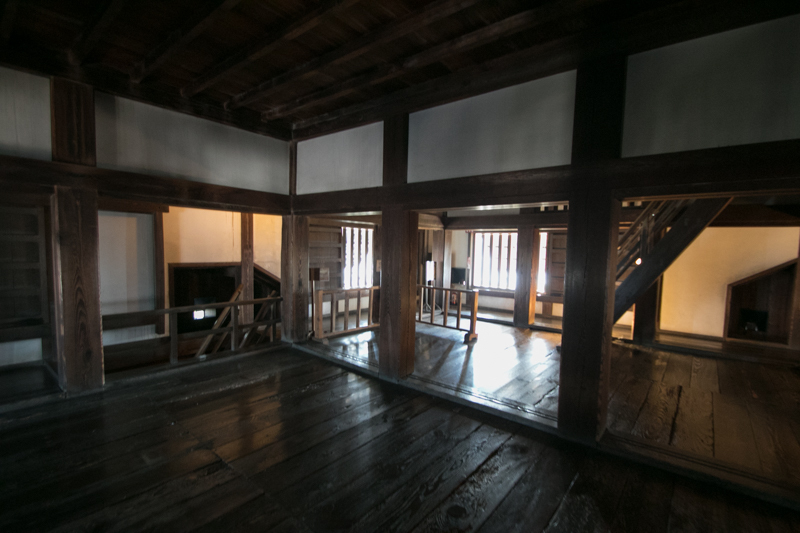 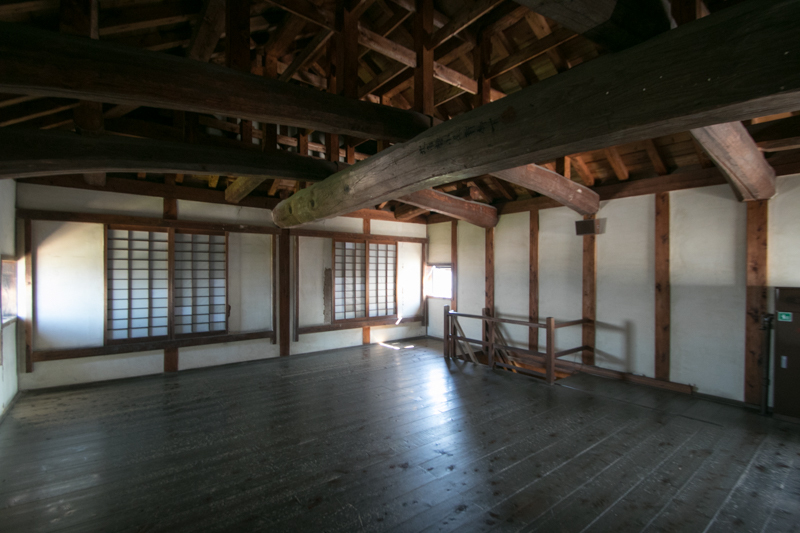 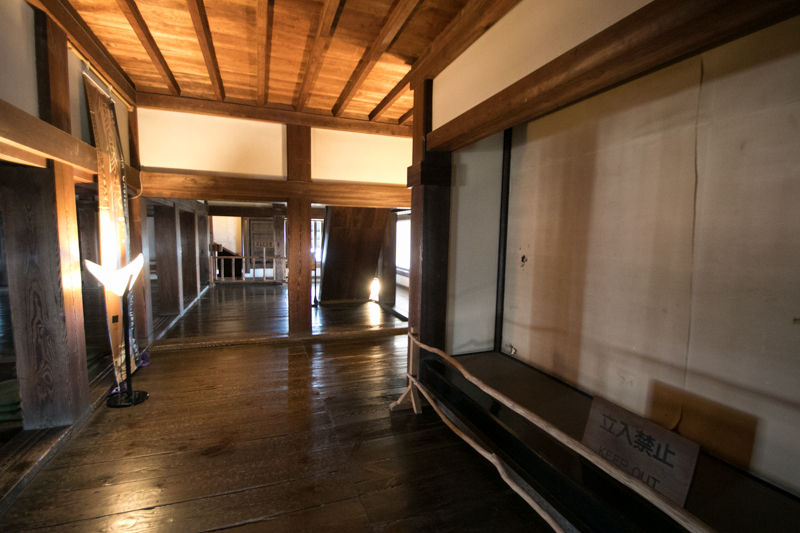 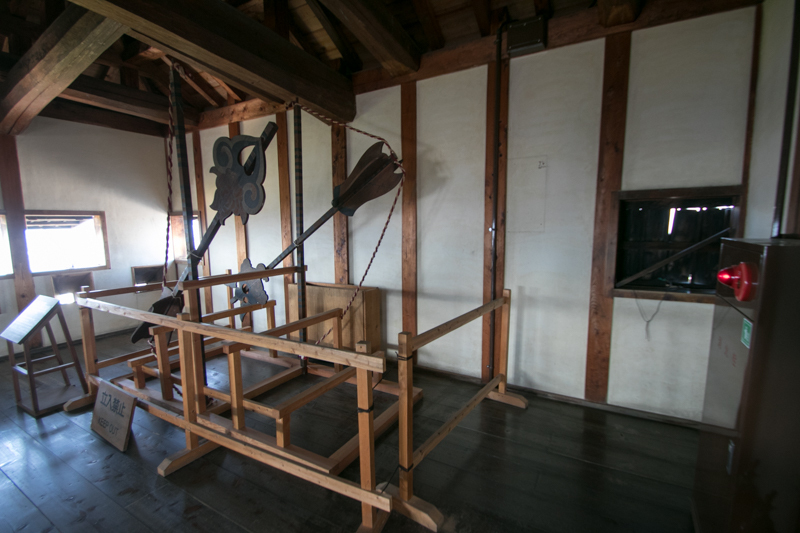 It took long years for construction, but in 1627, just before completion Yoshiakira was transferred to Aizu Wakamatsu castle (Fukushima prefecture). Gamo clan became the lord of Matsuyama castle in turnover with Kato clan, completed Matsuyama castle by 1630 but was extinguished by no successor in 1634. 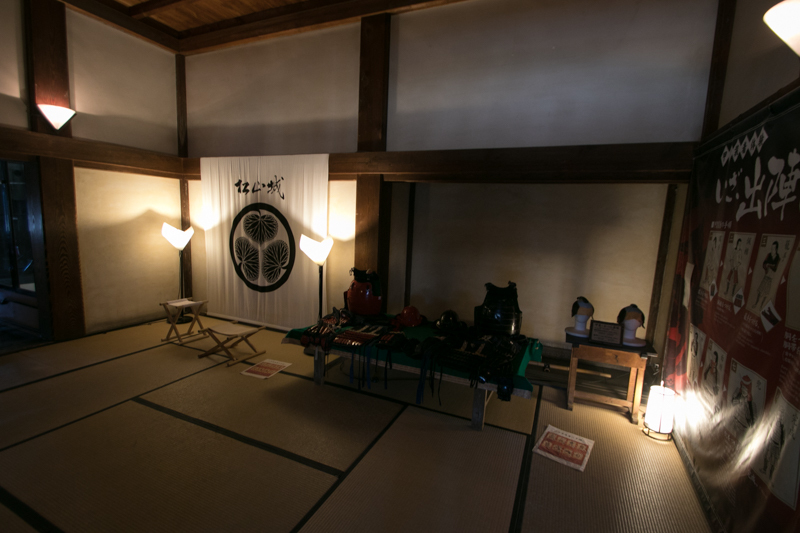 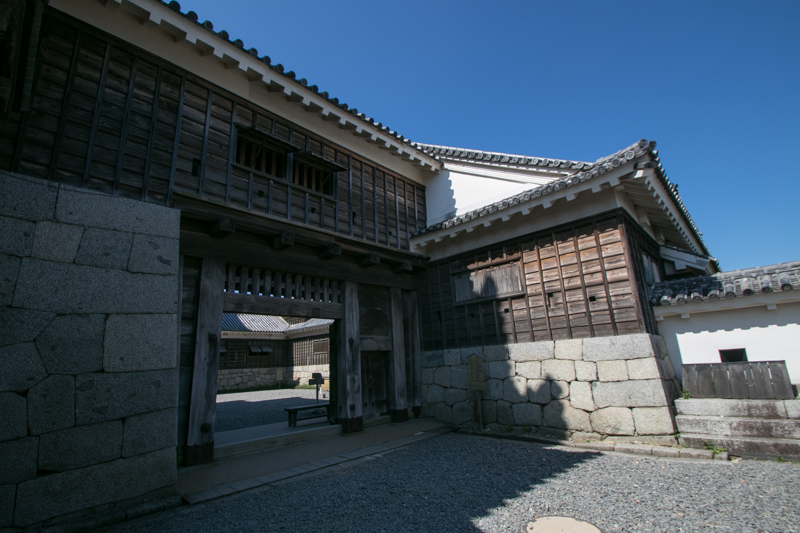 Next year Matsudaira clan which was the relative of Tokugwa clan became the lord of Matsuyama domain and held this castle by the end of Edo era. In 1784 main tower and other buildings of central area were lost due to lightning, then Matsudaira clan rebuilt them in 1854 after 30 years construction. 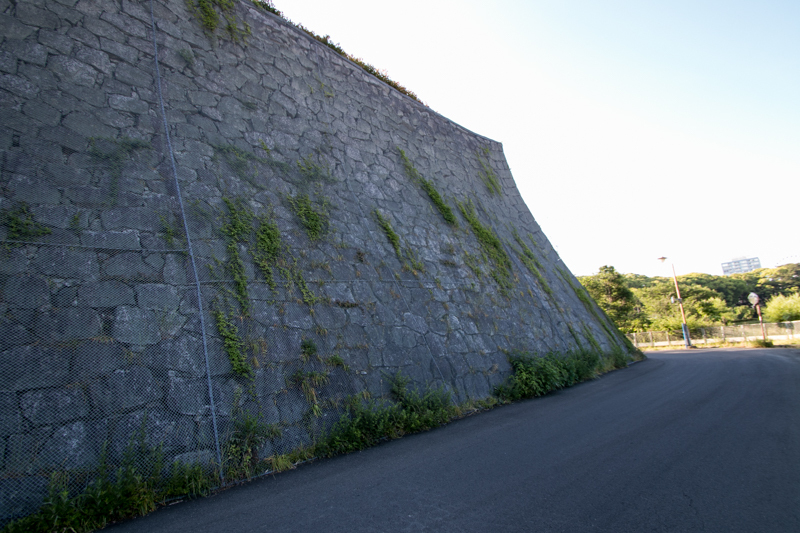 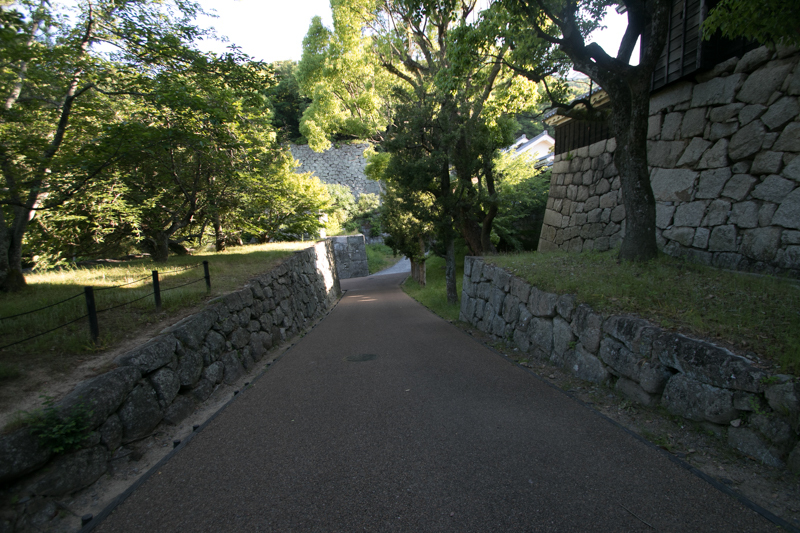 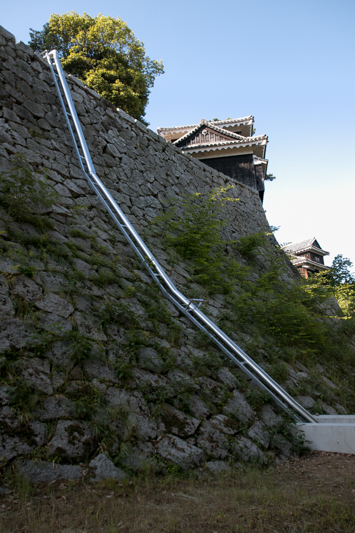 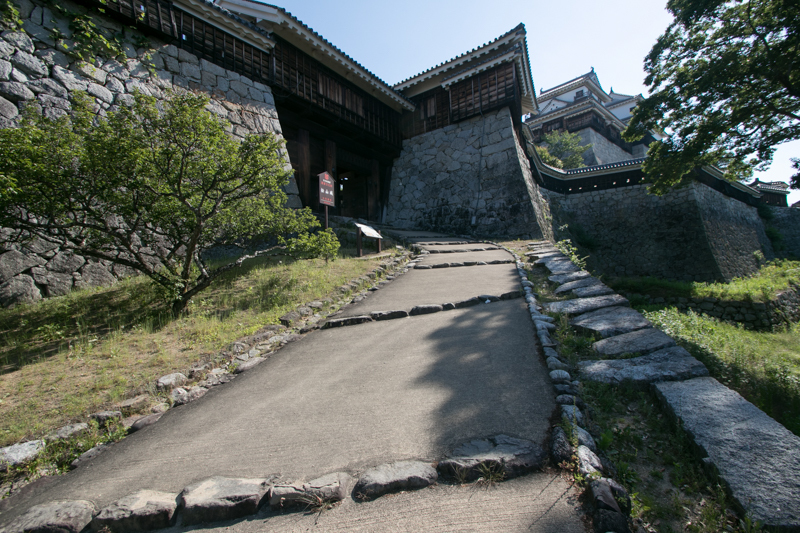 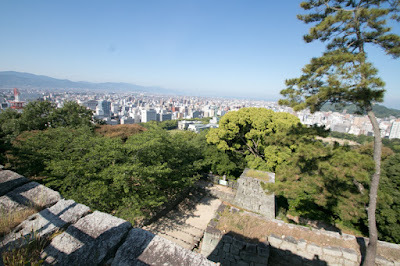 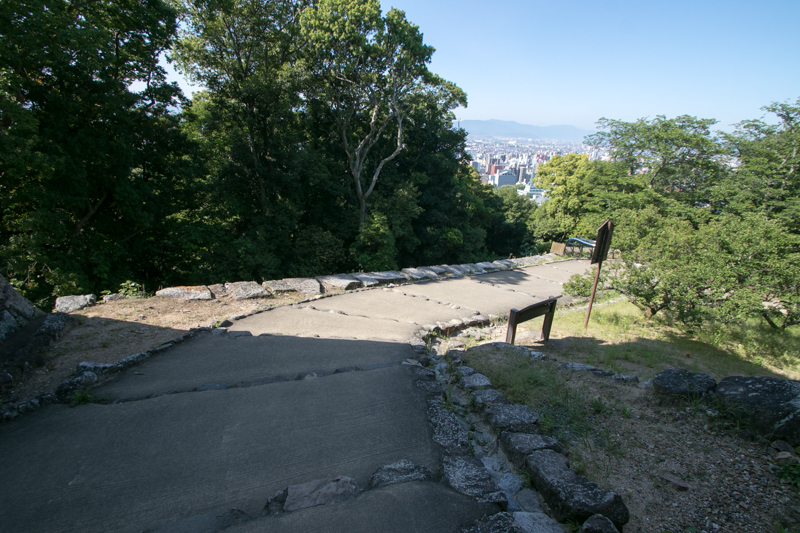 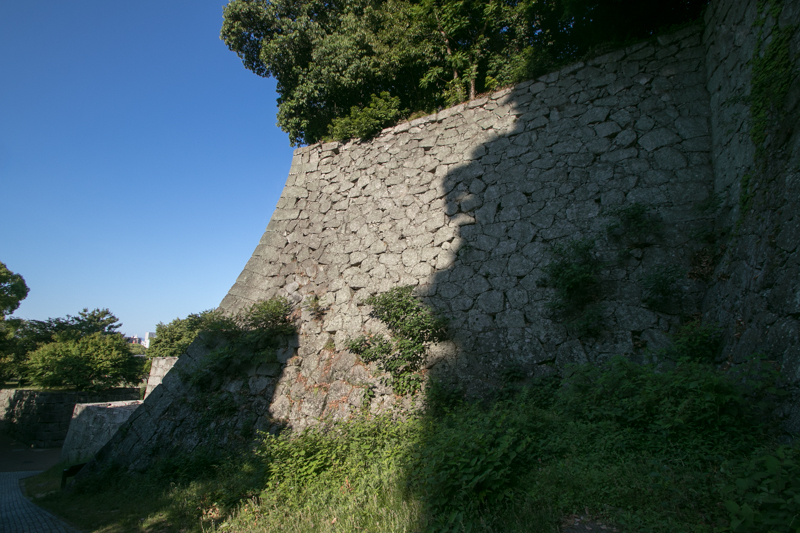 Matsuyama castle roughly consist of hilltop area and hillside area. 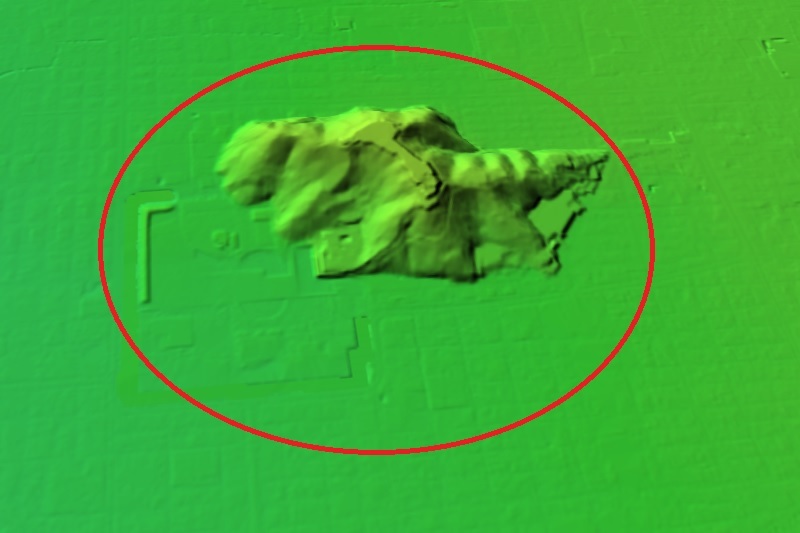 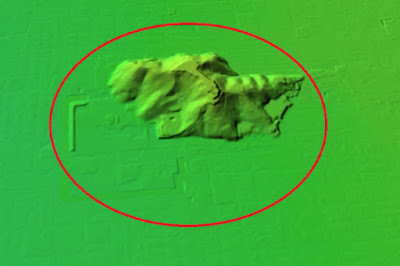 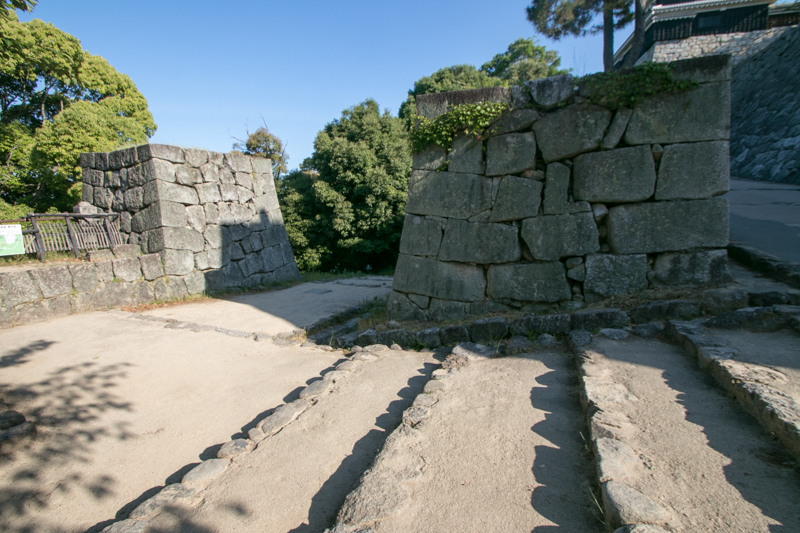 Hilltop area spreads over flat area has a shape of hammer with hammer head and slightly curved grip. As the mountain has flat top, hilltop area becomes a large one flat area of about 400 meter long and 100 meter wide. 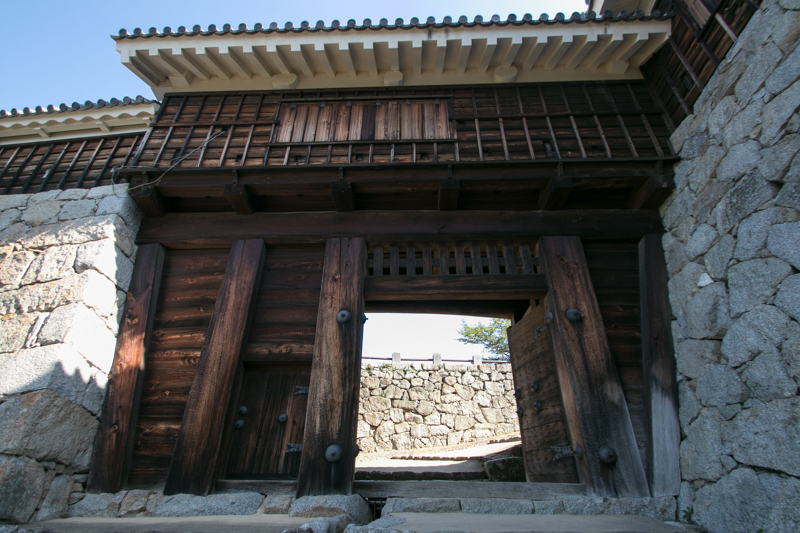 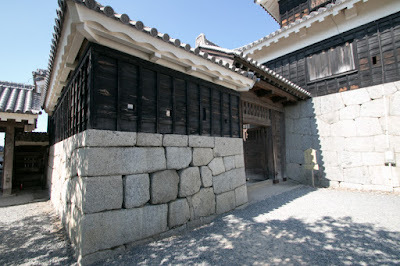 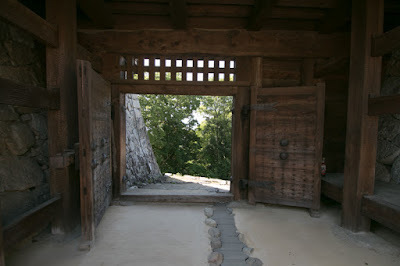 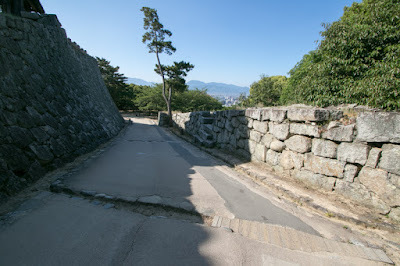 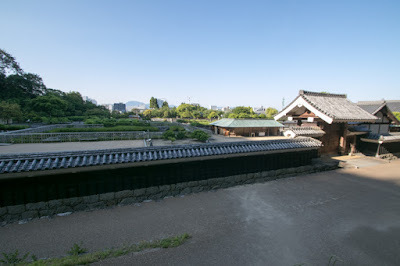 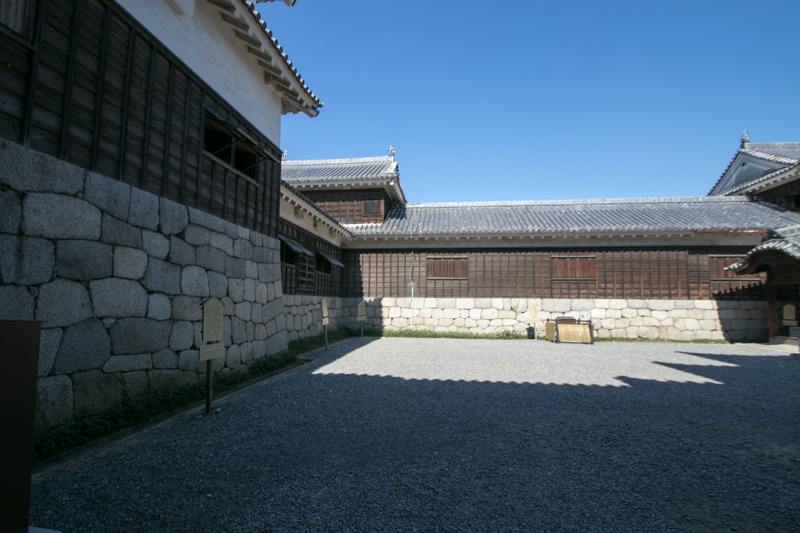 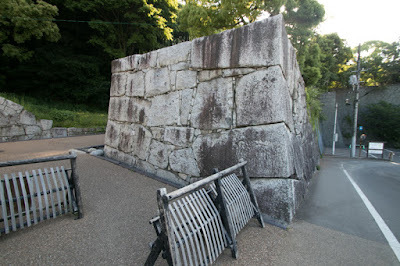 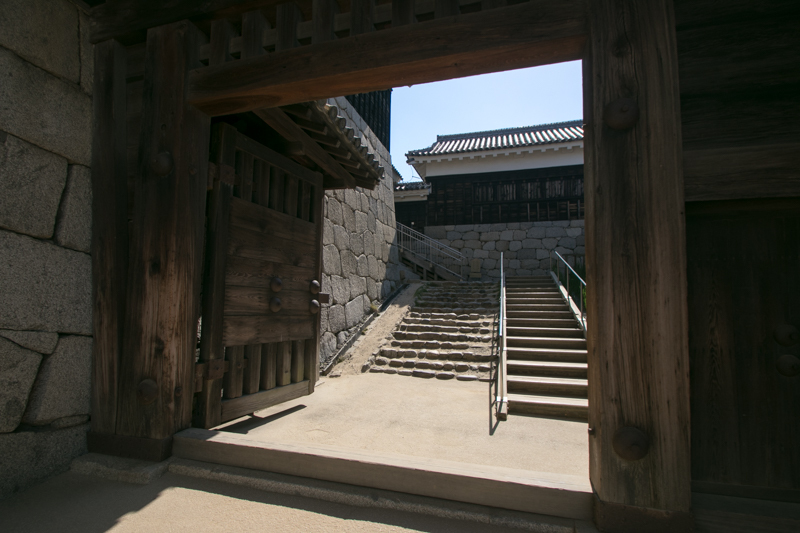 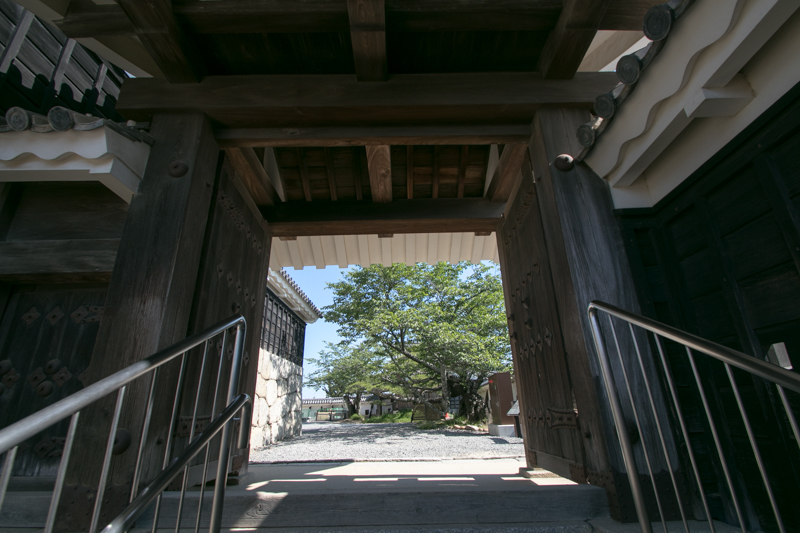 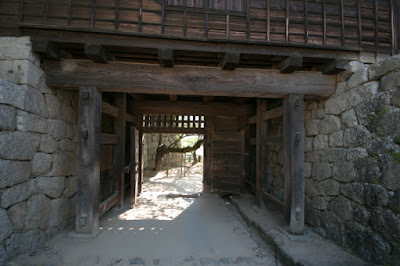 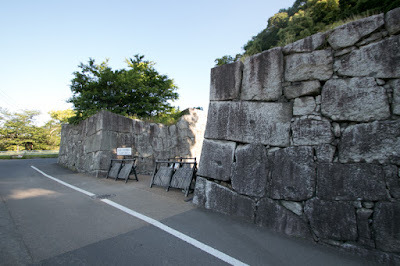 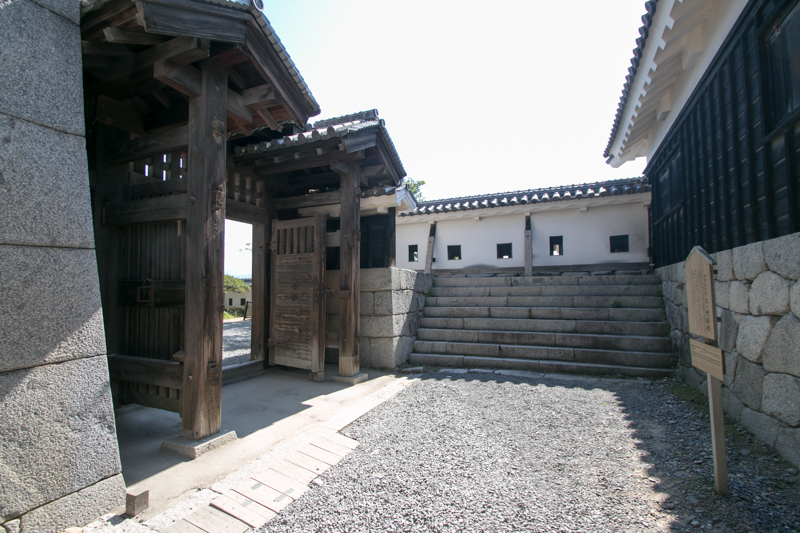 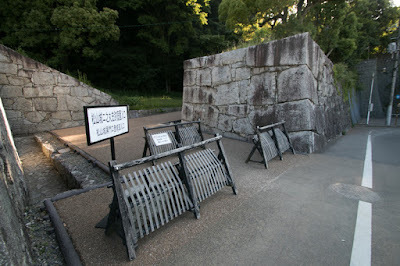 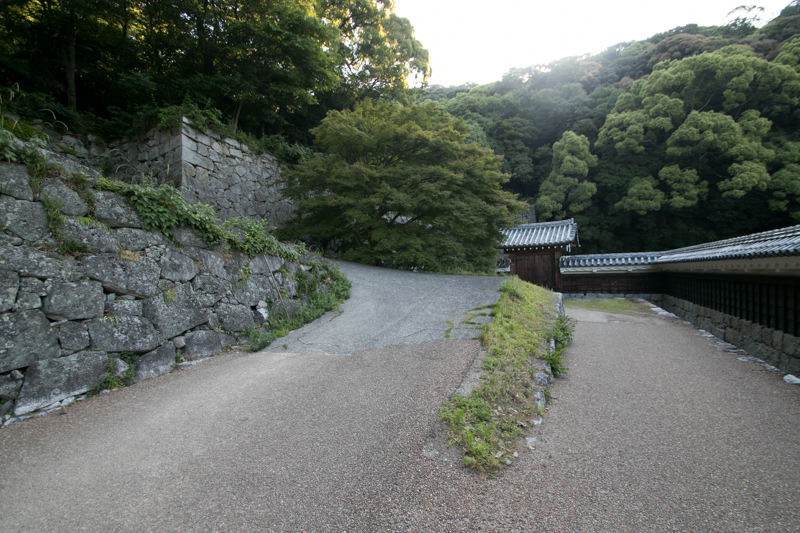 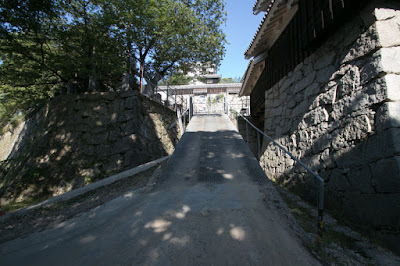 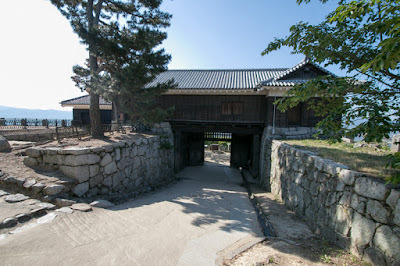 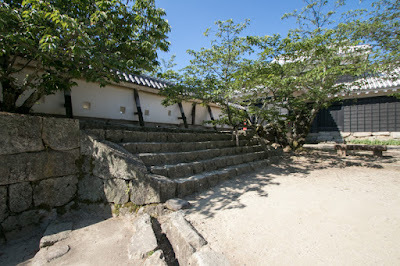 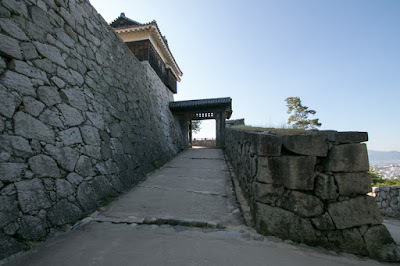 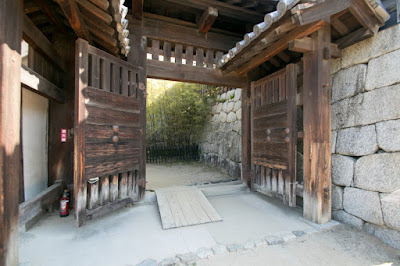 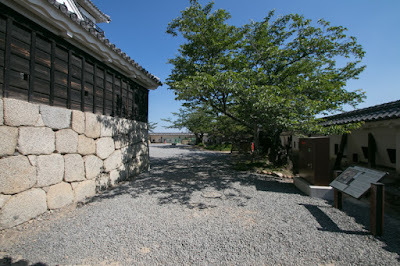 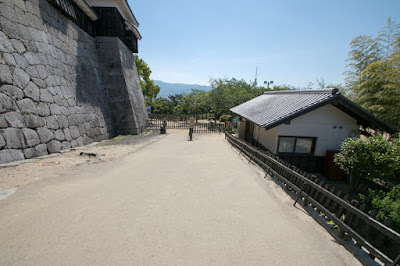 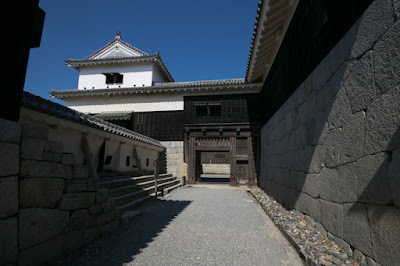 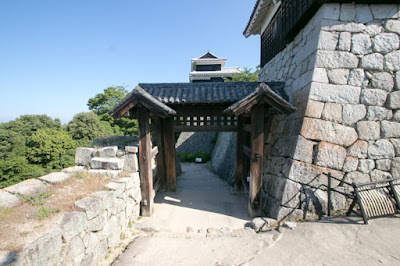 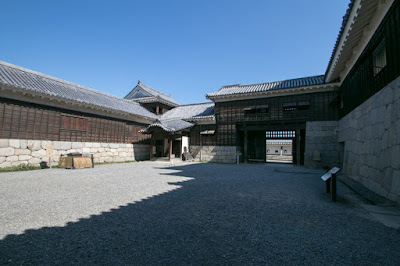 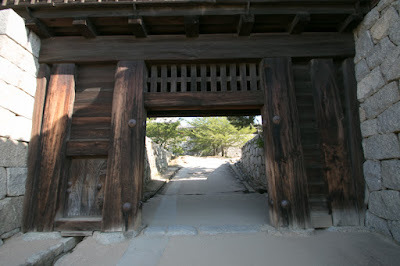 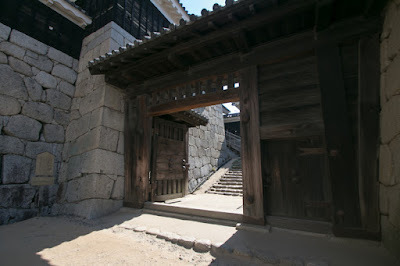 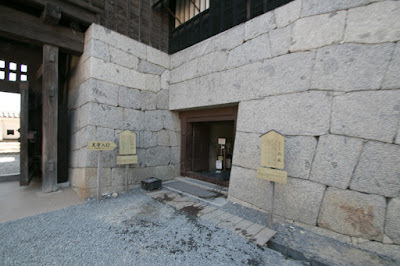 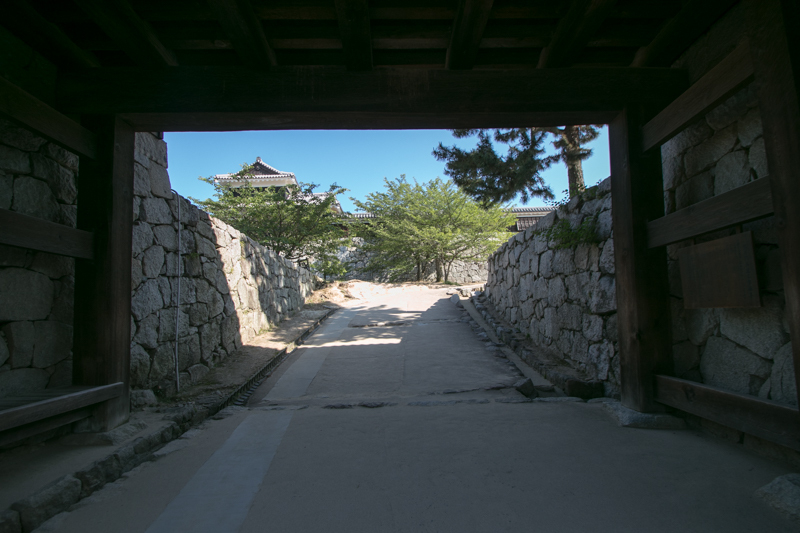 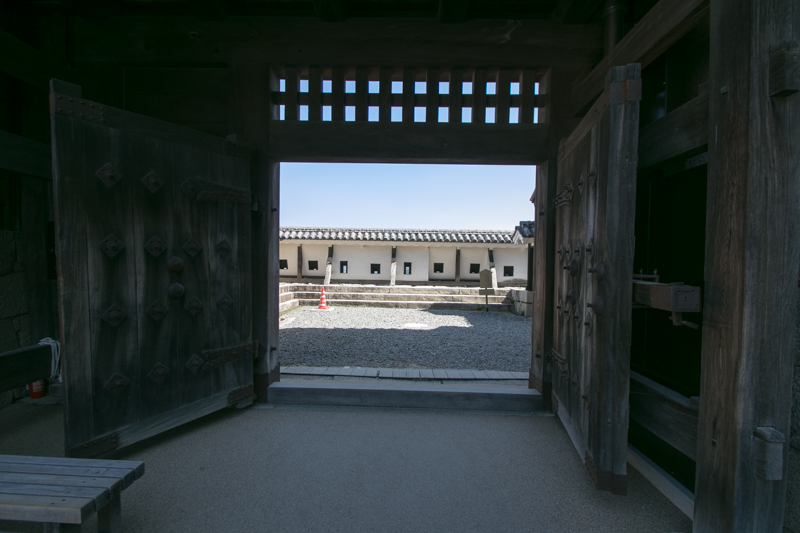 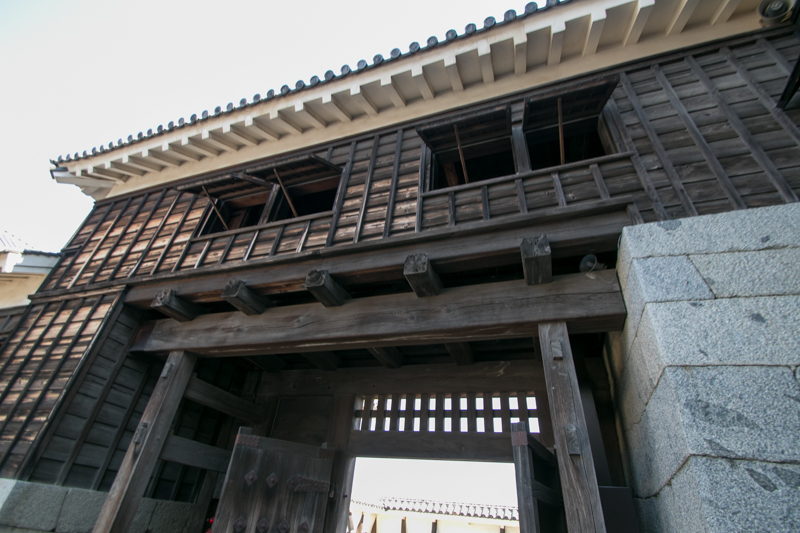 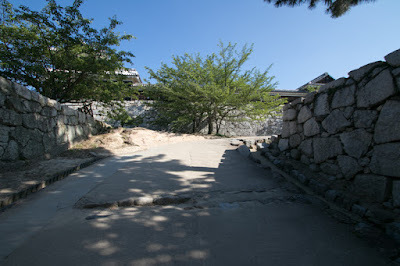 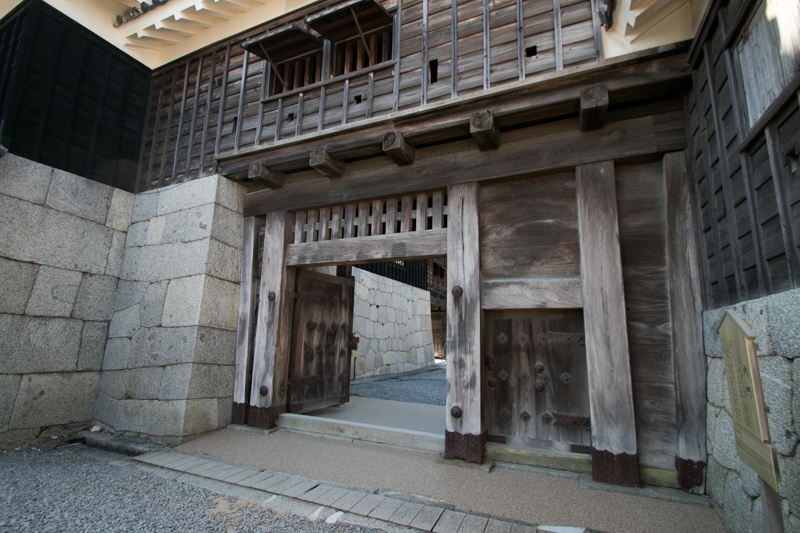 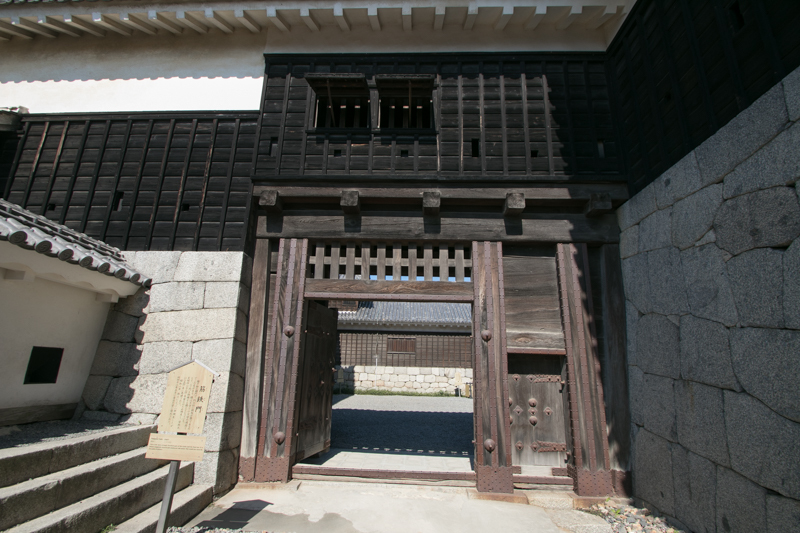 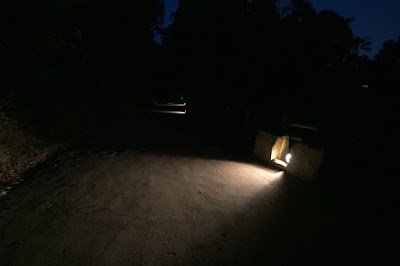 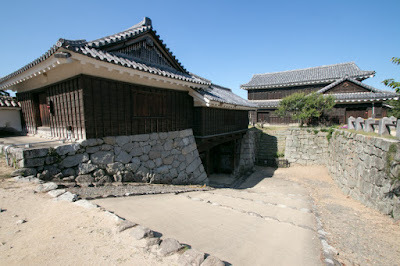 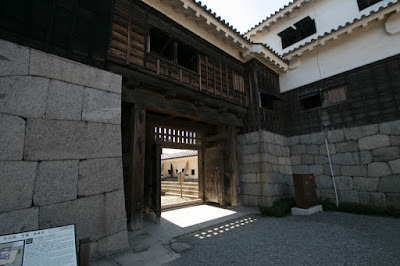 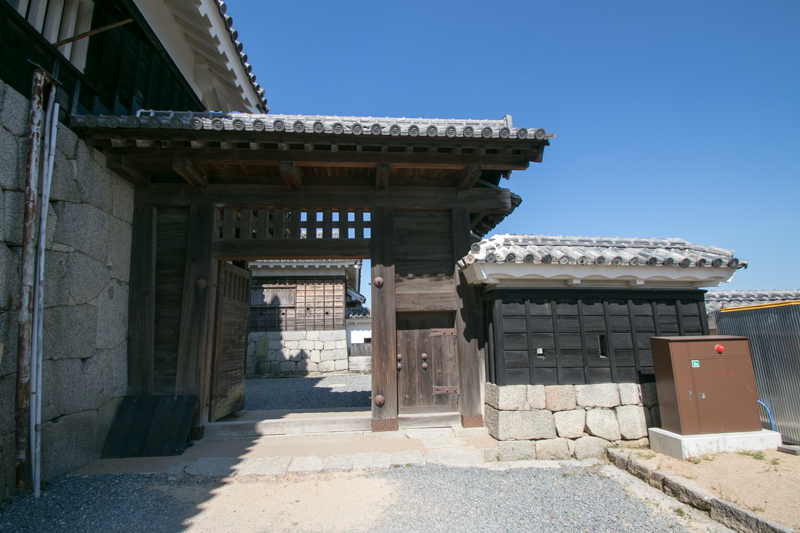 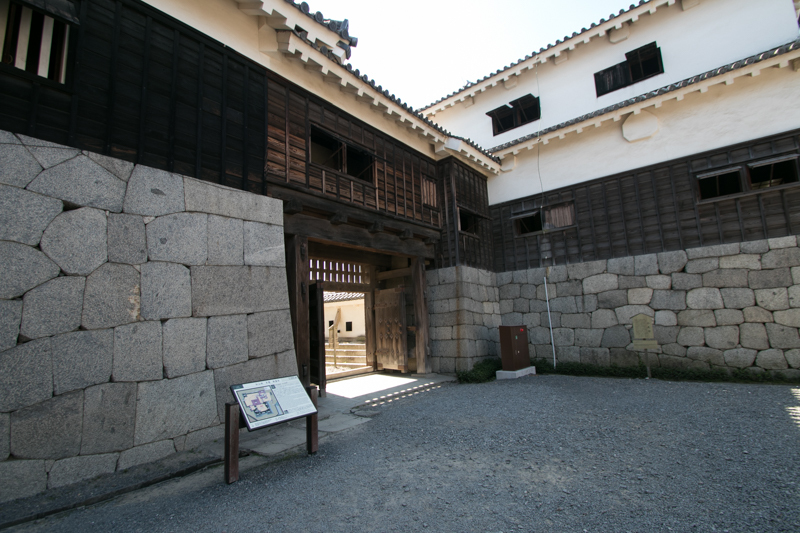 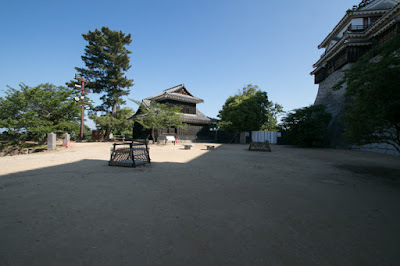 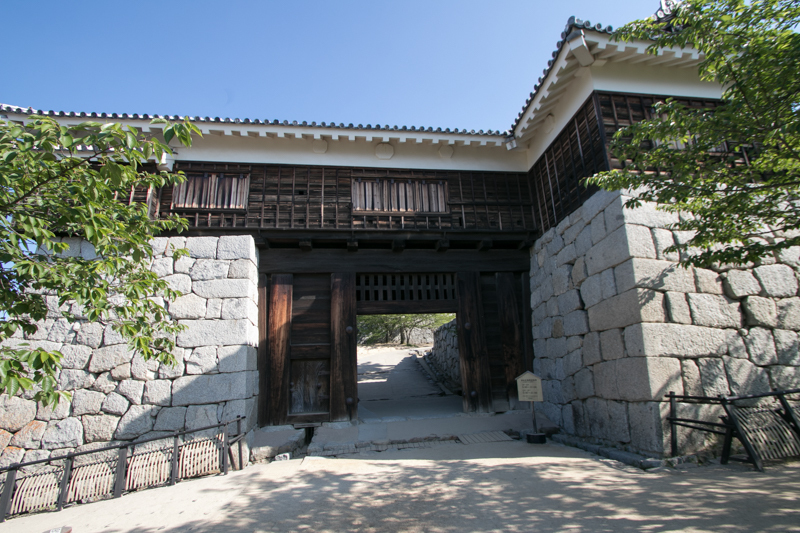 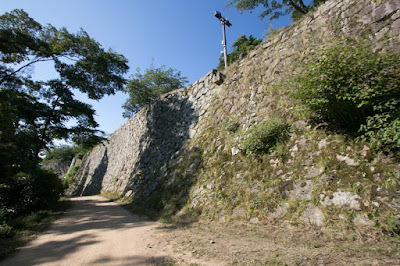 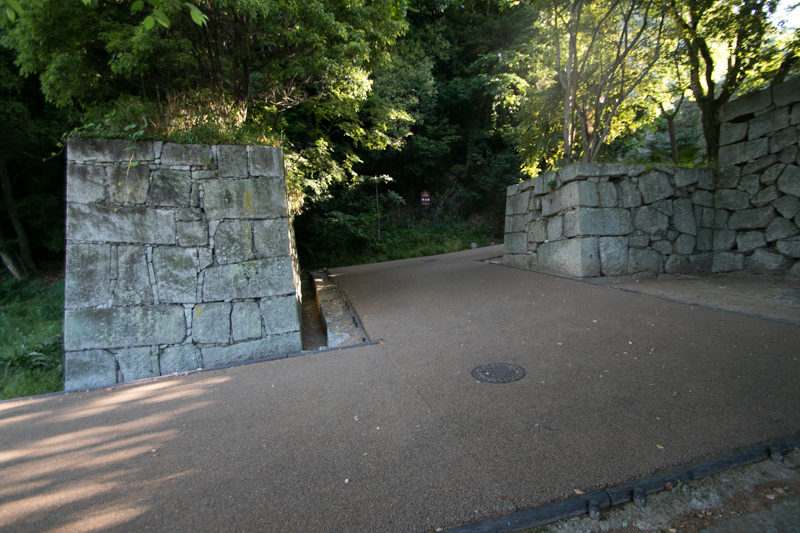 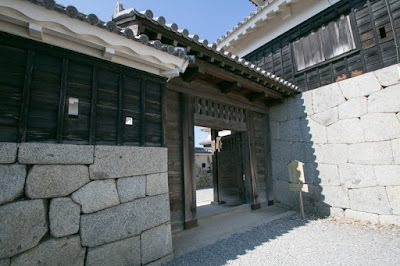 This area has three gates at south, northwest and northeast, and these gates are secure Masugata style gates with folded path and combination of outer and inner gate. At the north of central area, there is a secure main tower area. This area consist of inner square which has central area and three corner turrets at each corner connected by barrack gates, and outer area to enter the inner part. 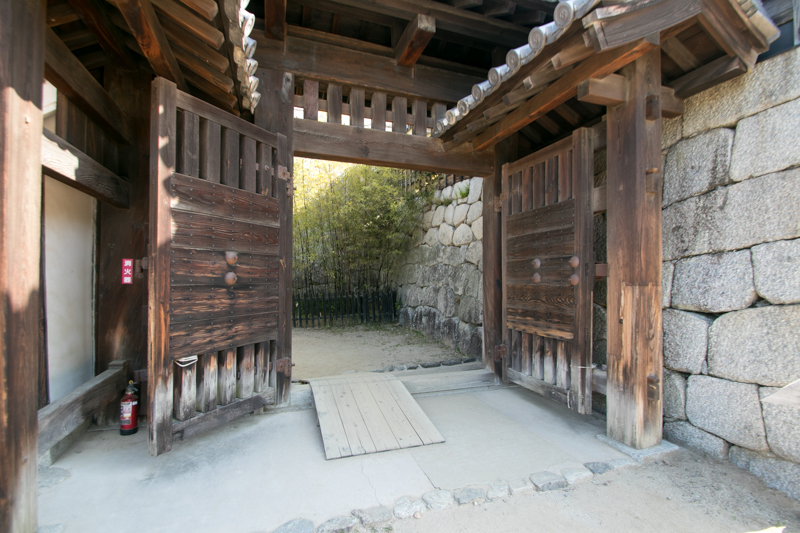 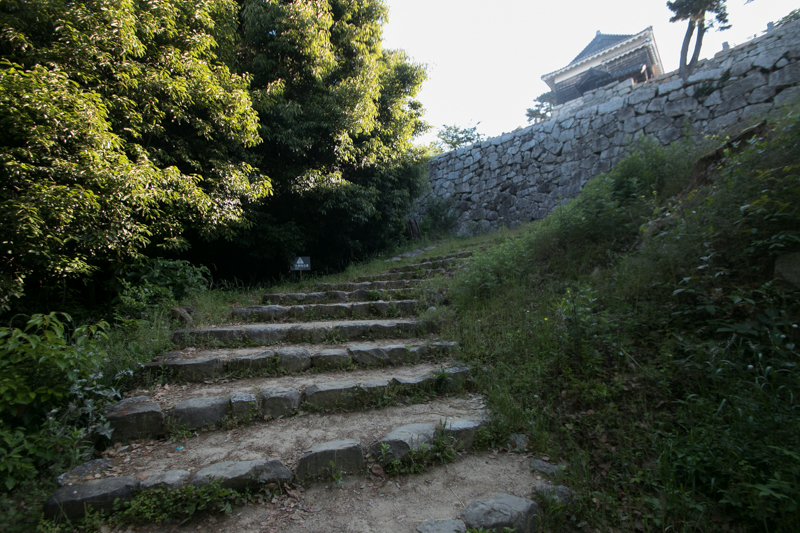 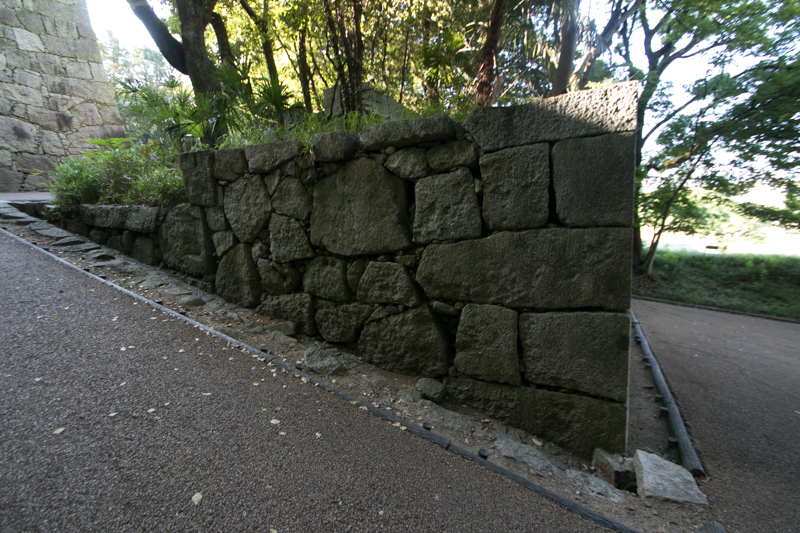 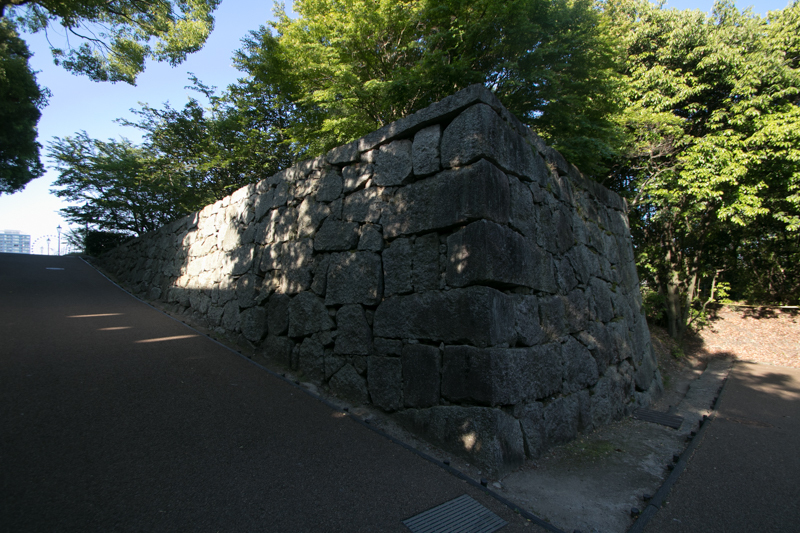 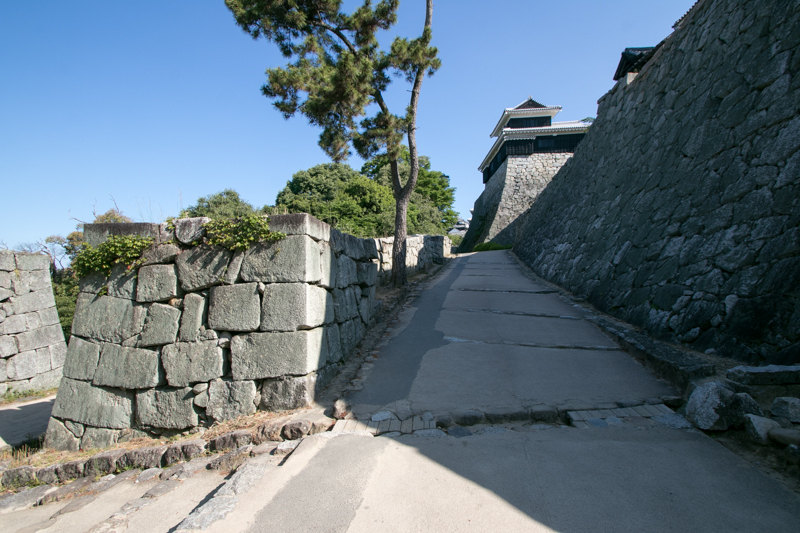 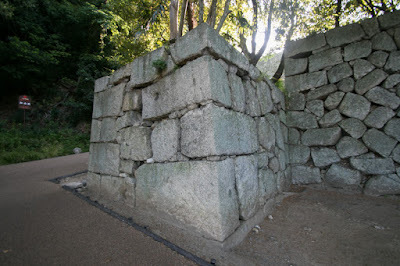 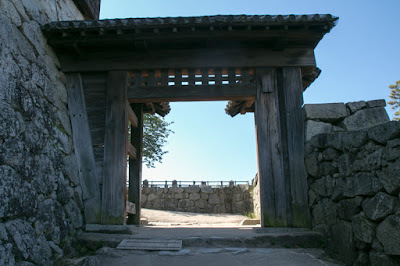 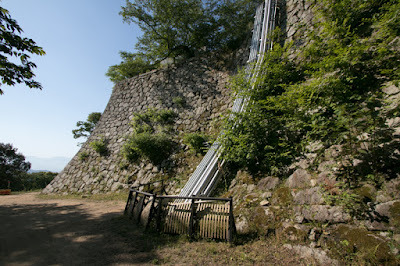 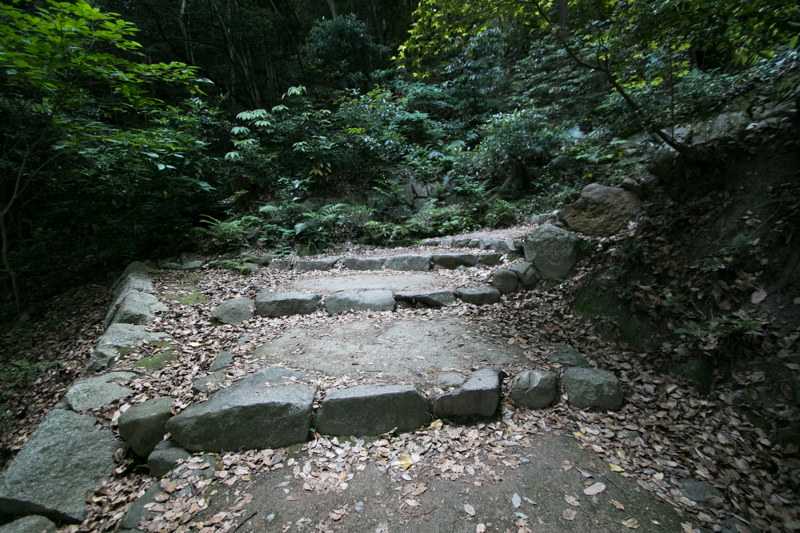 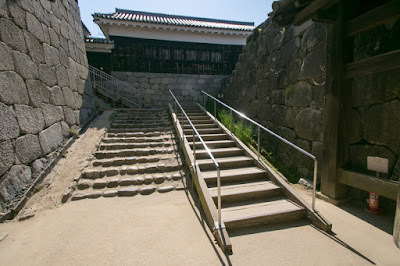 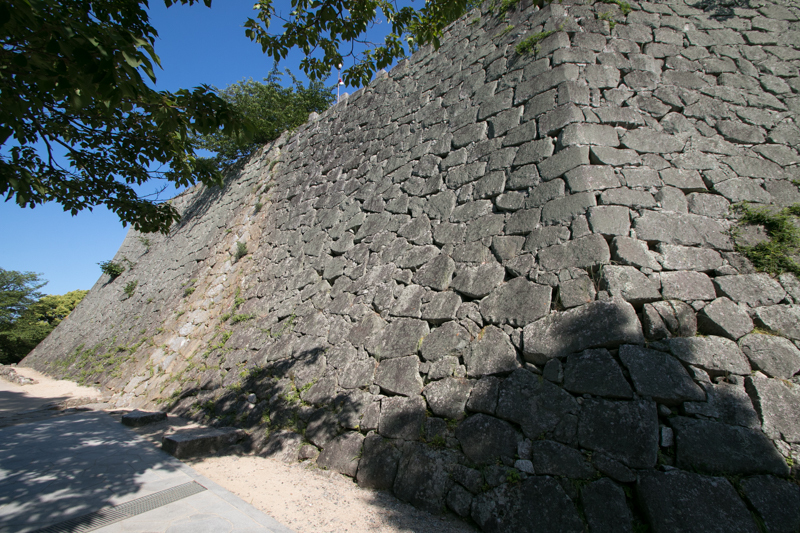 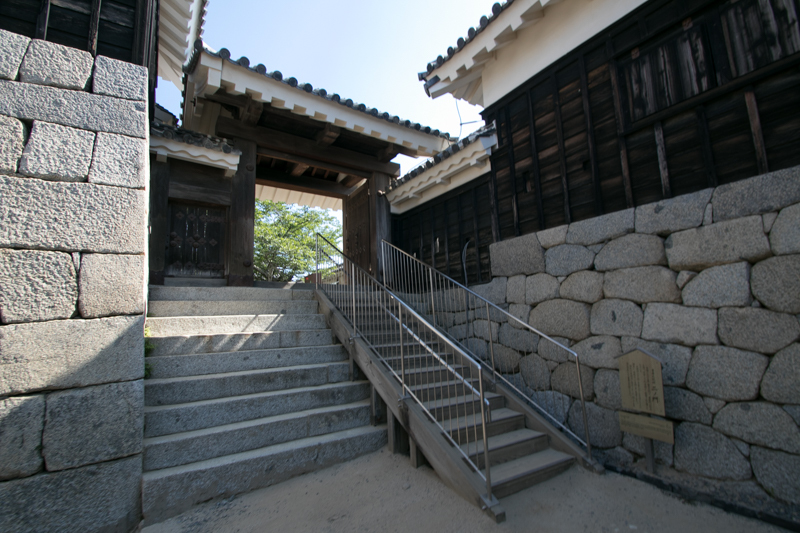 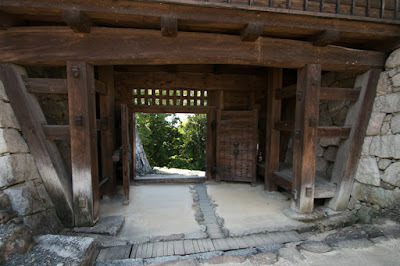 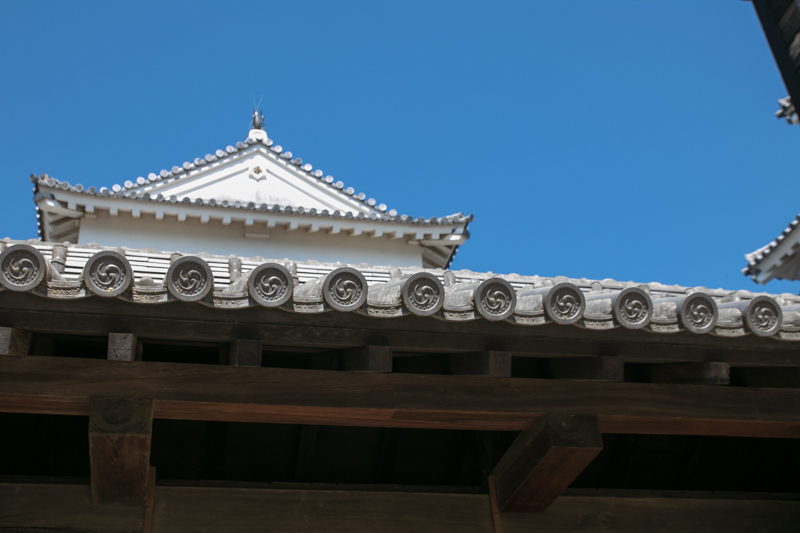 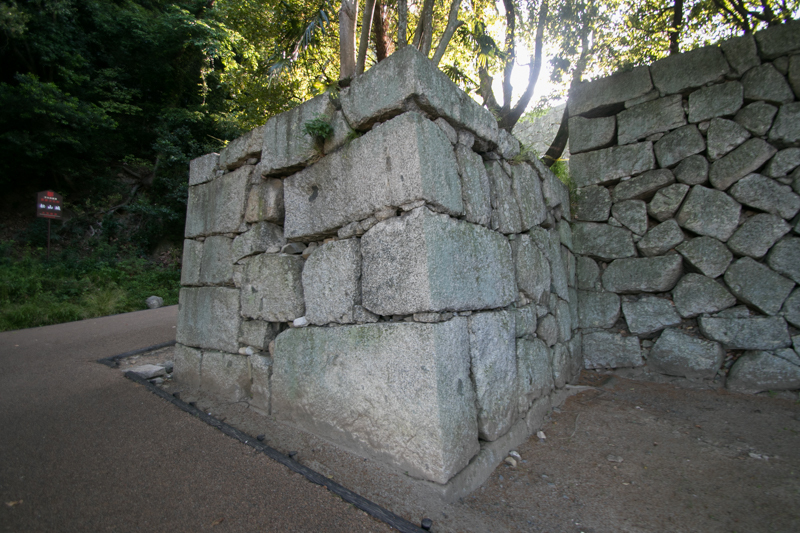 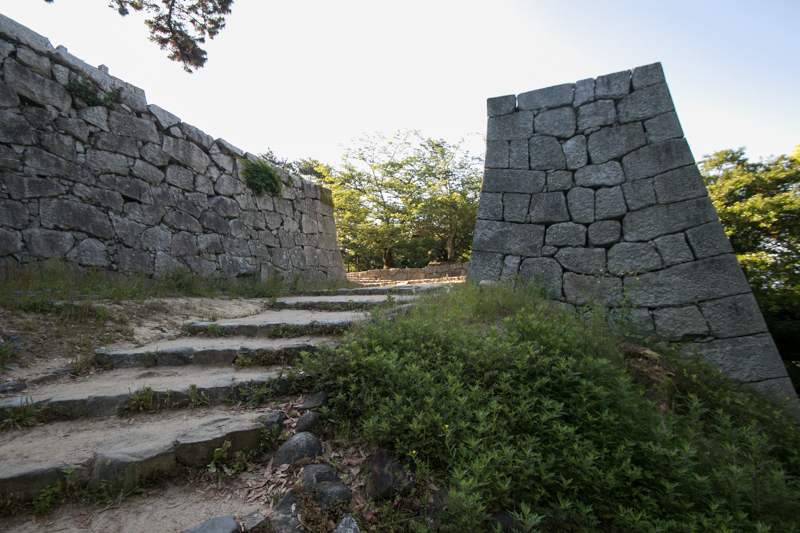 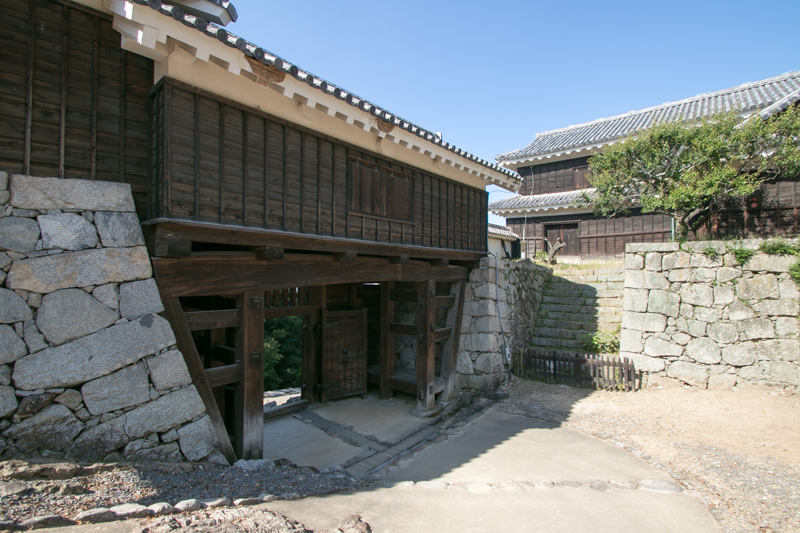 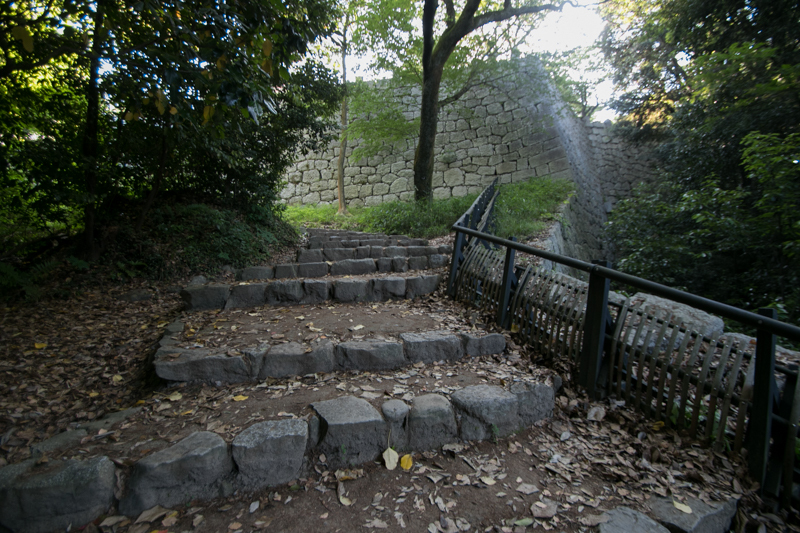 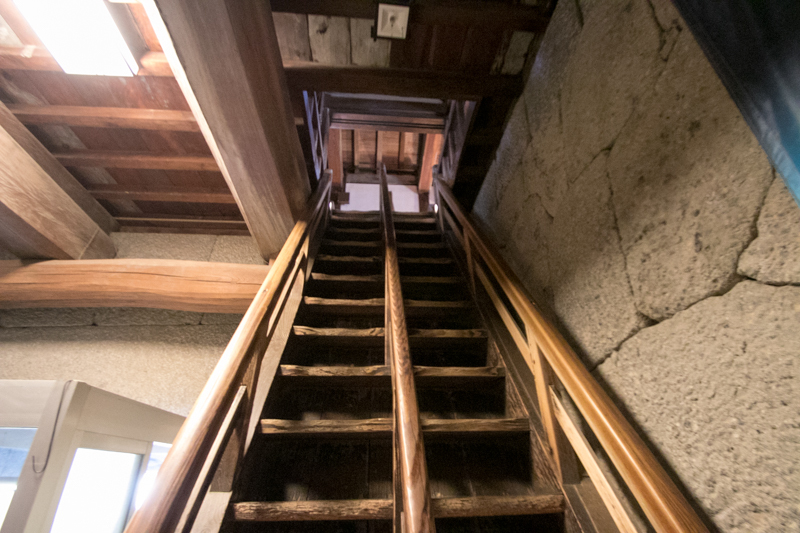 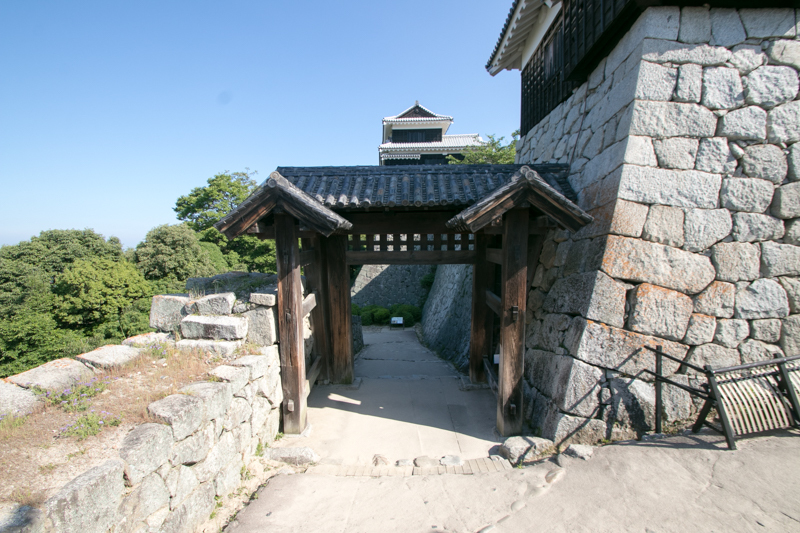 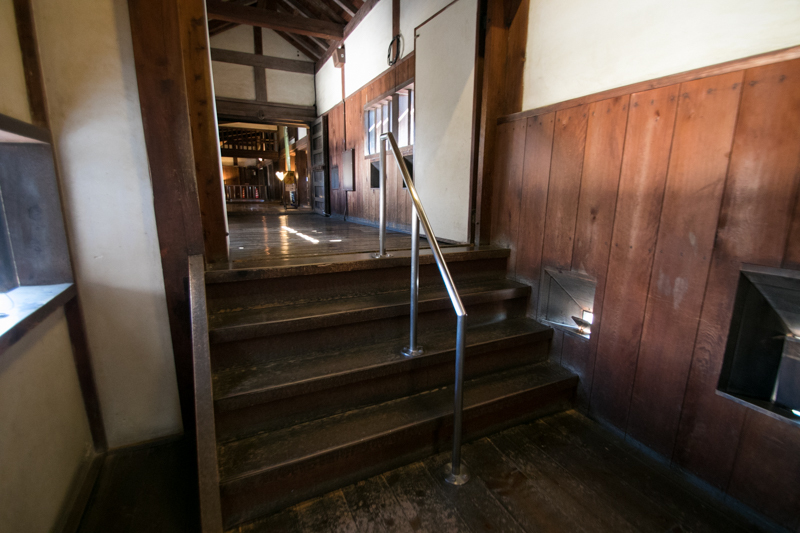 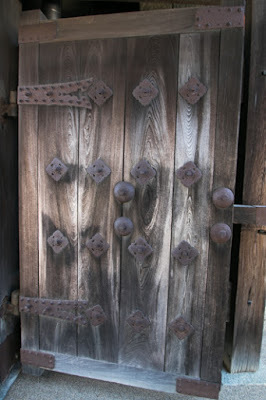 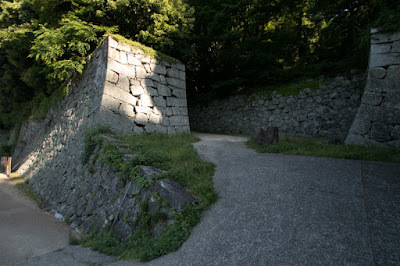 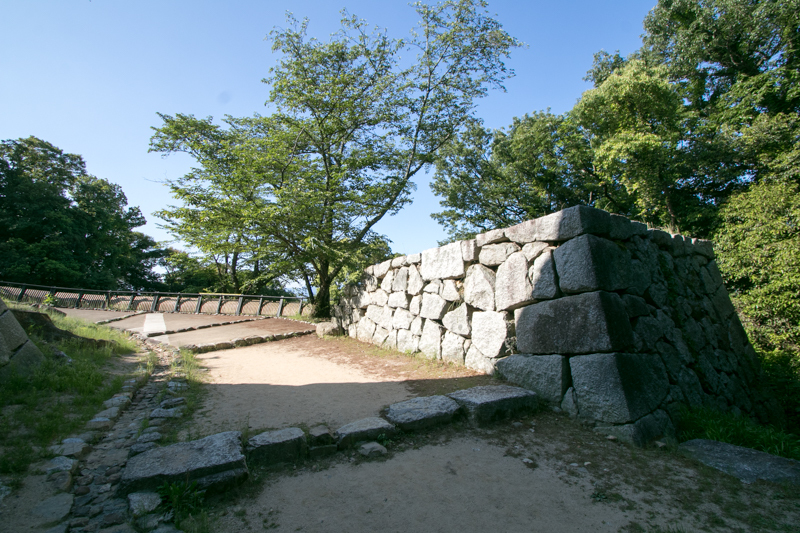 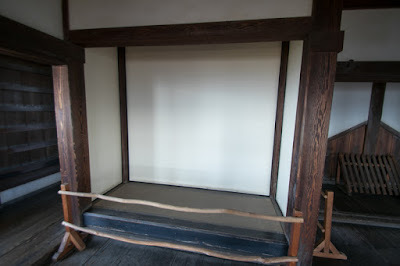 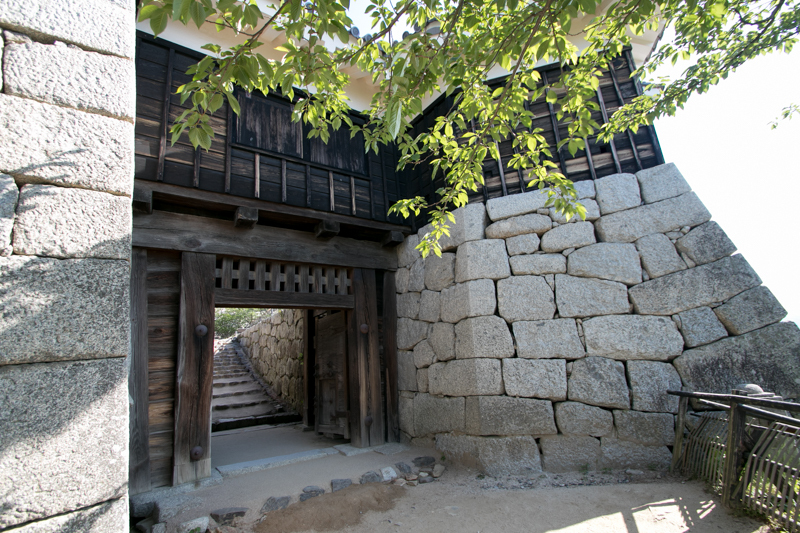 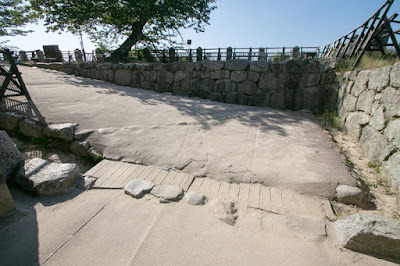 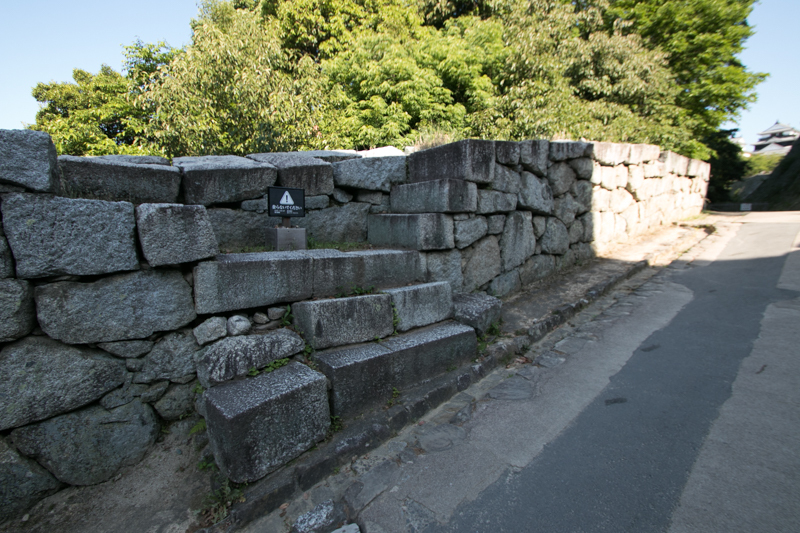 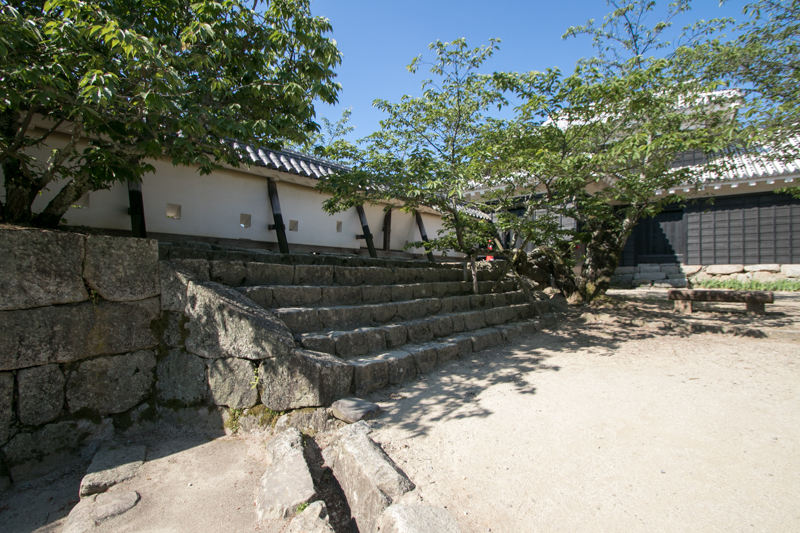 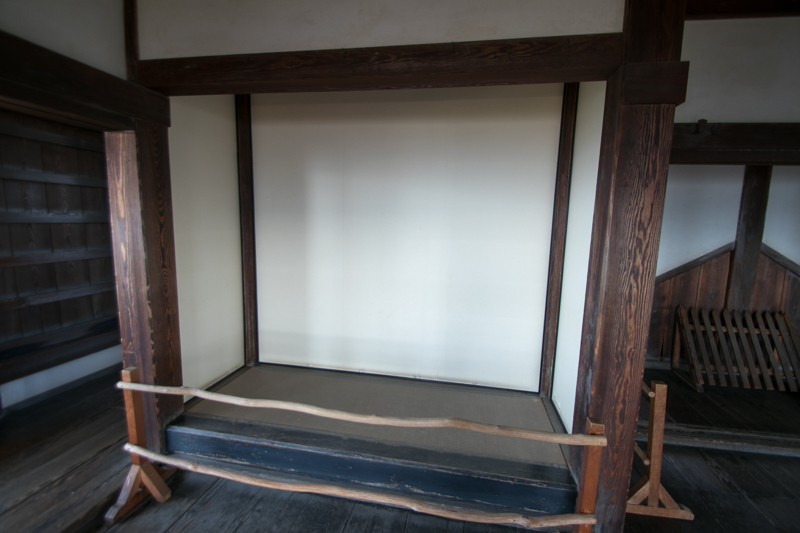 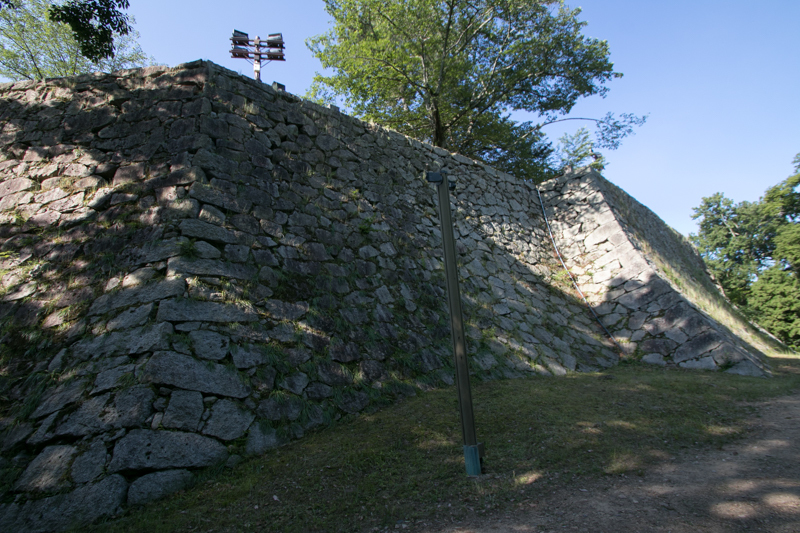 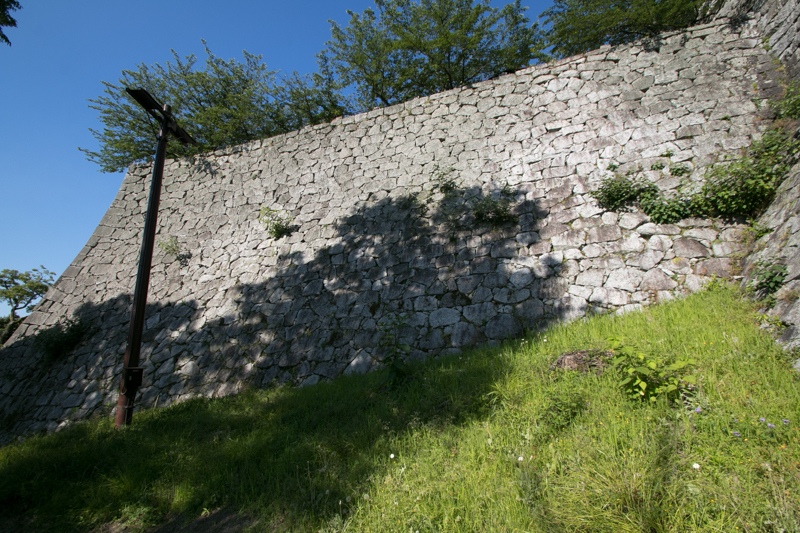 This stile is the final form of main towers of Japanese castles, also seen at Himeji castle. 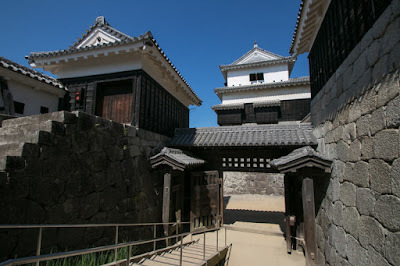 This main tower gate has also a secure front gate, which is totally surrounded by higher turrets. 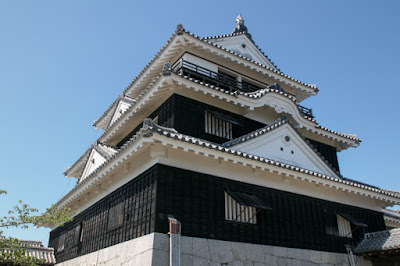 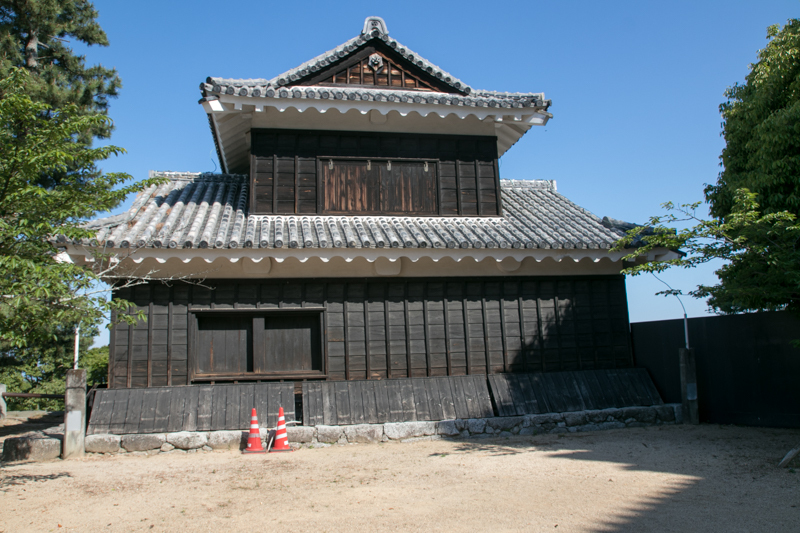 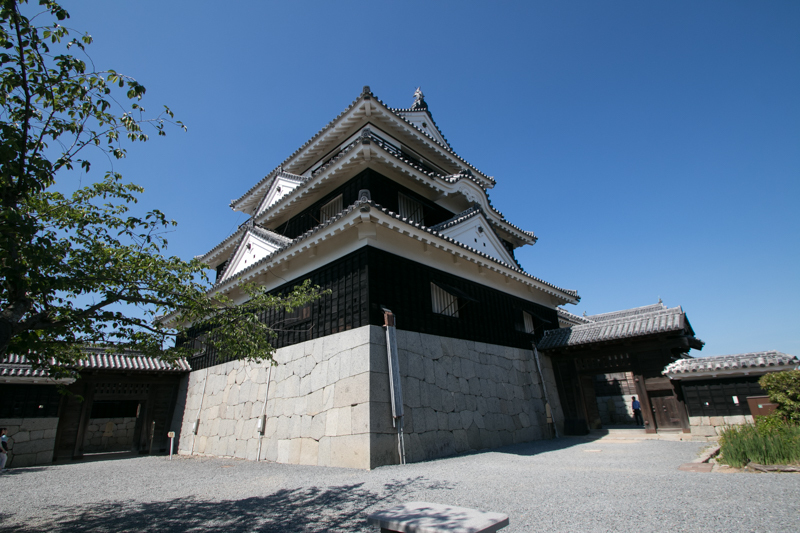 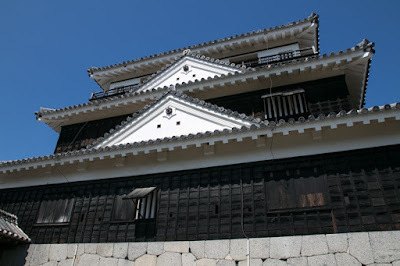 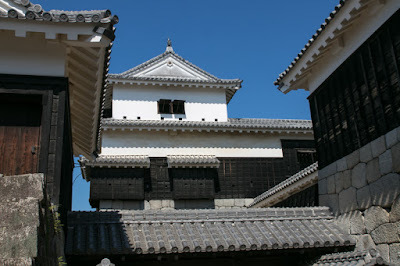 Main tower of Matsuyama castle was once lost and rebuilt in 1854, at the final period of Edo era, but kept its original style with black colored wooden wall. It has three floors and one basement, and its interior is quite simple compared with the towers built at earlier period. 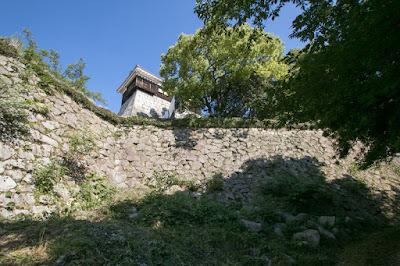 The south and west edge of central area is protected by beautifully curved stone walls built utilizing the cliff, and guarding turrets over them. 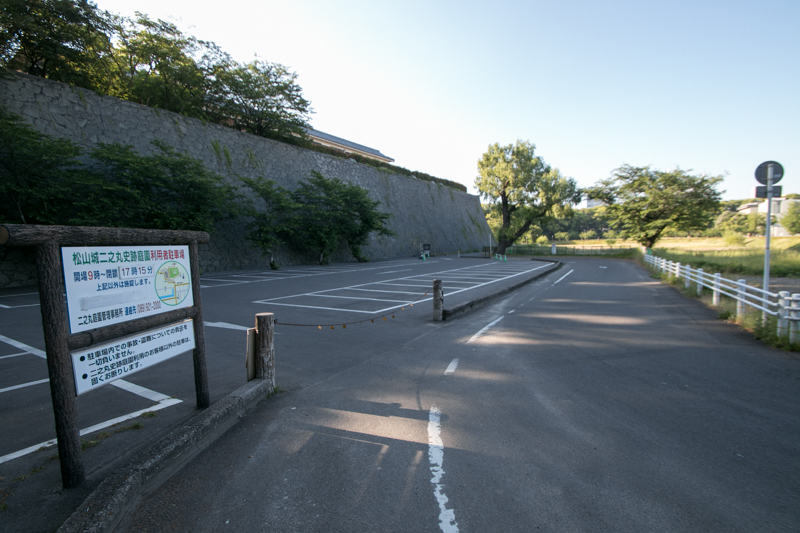 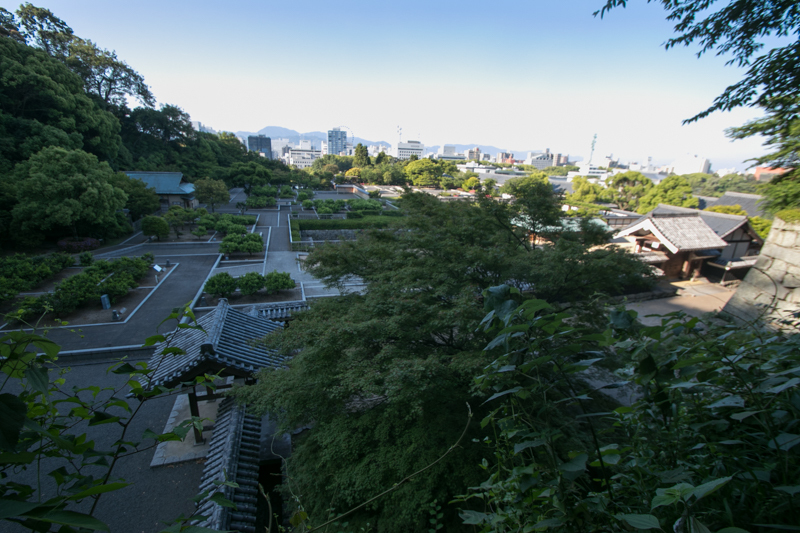 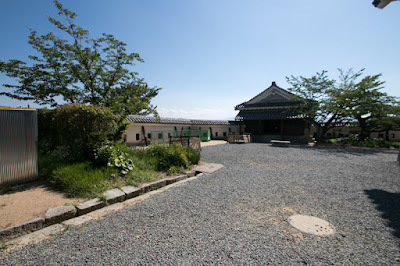 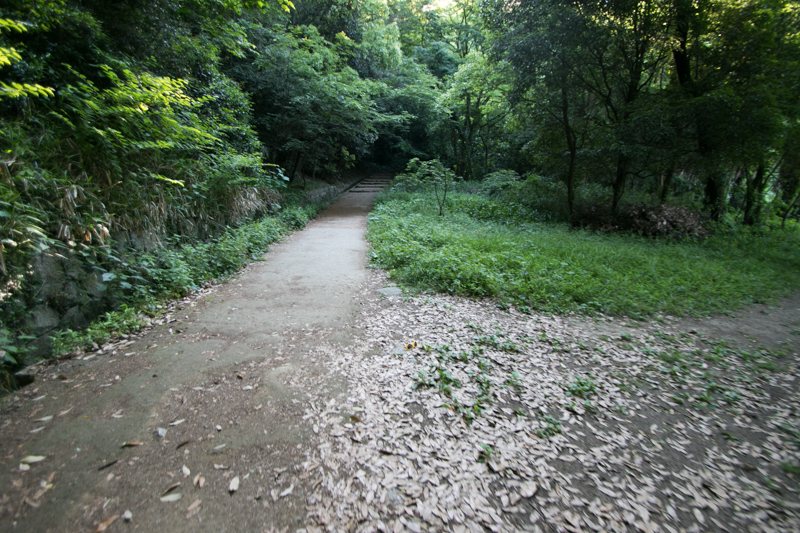 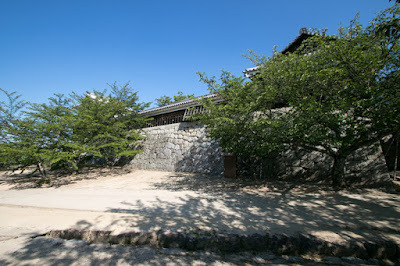 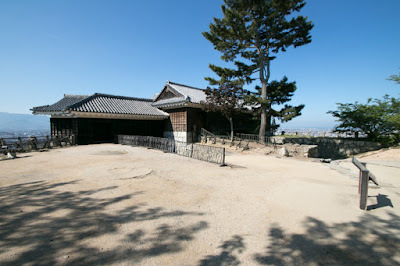 At the southwest hillside, there is secondary area of about 200 meter long square which is used as the residence of the lord and front side gate to hilltop area. 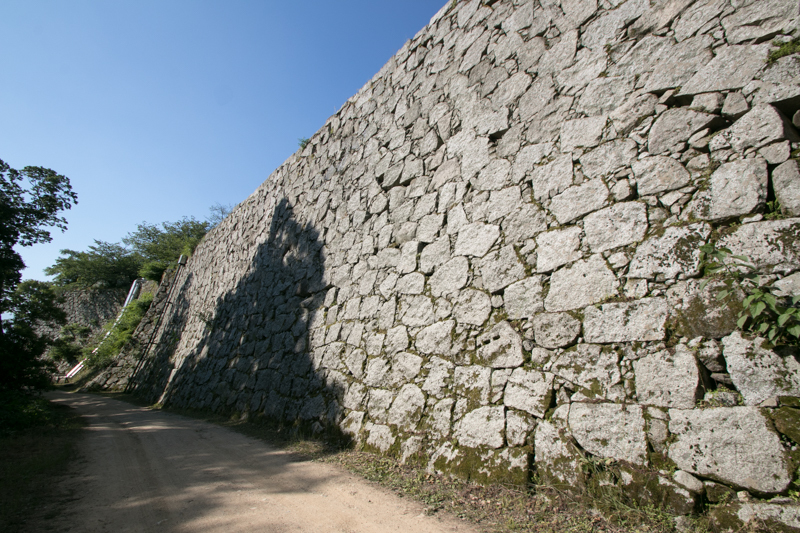 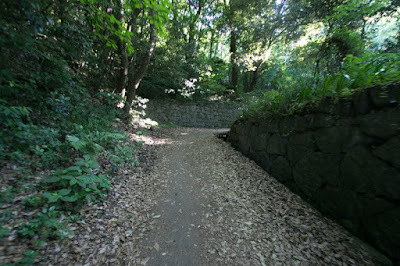 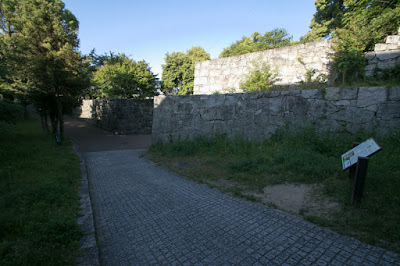 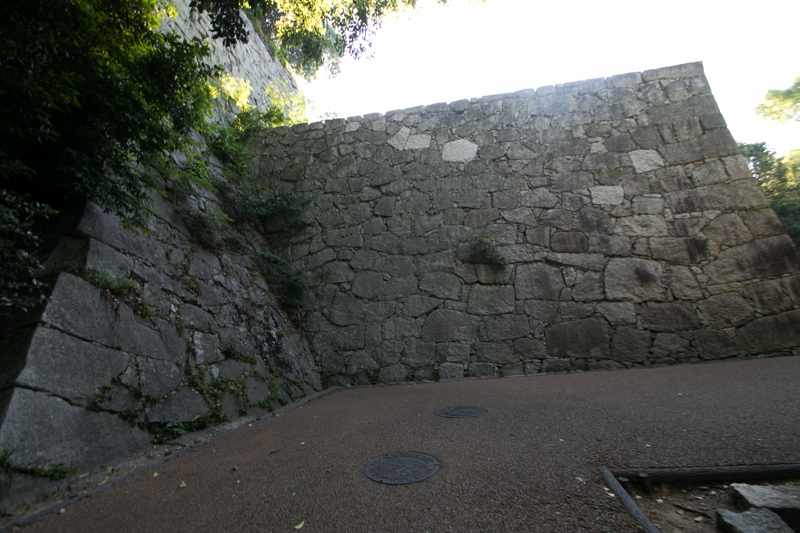 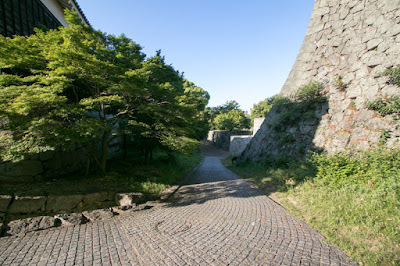 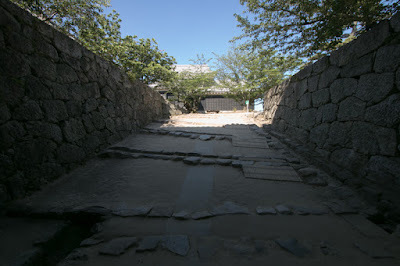 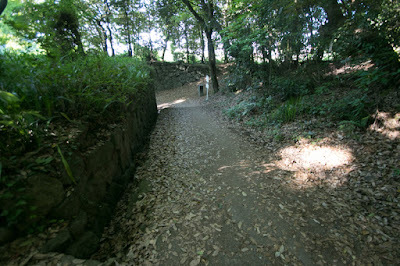 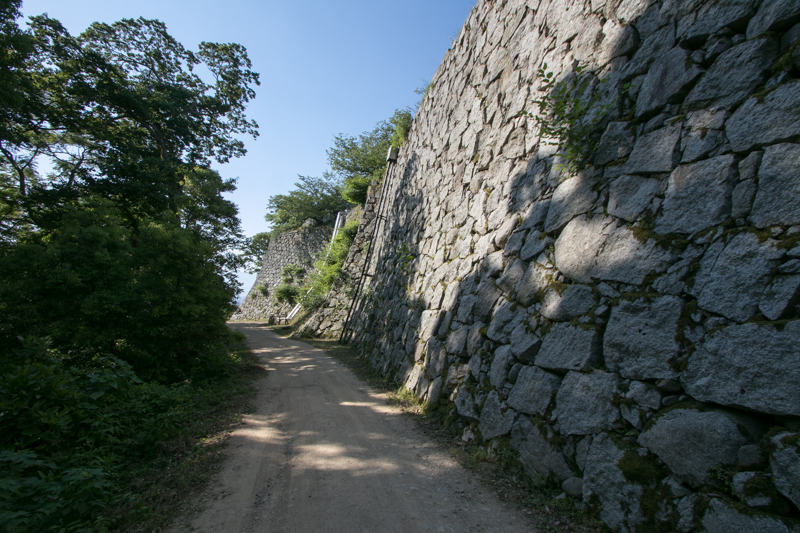 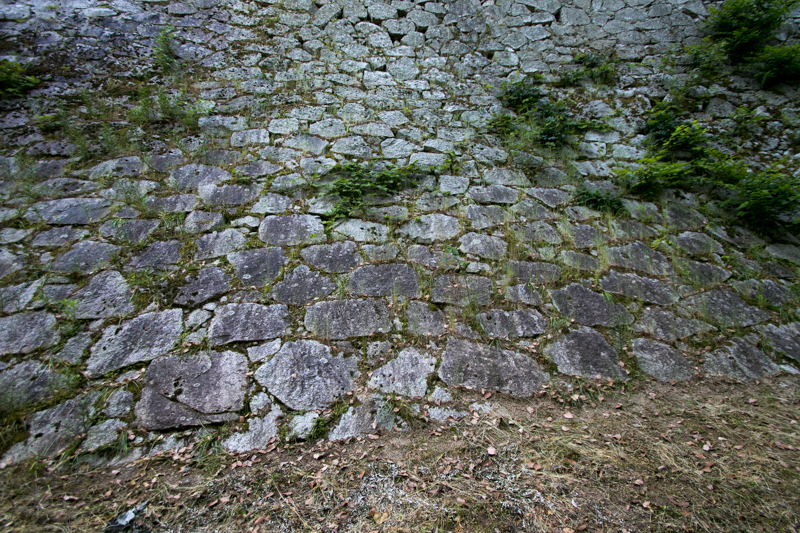 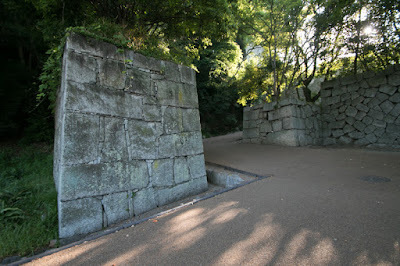 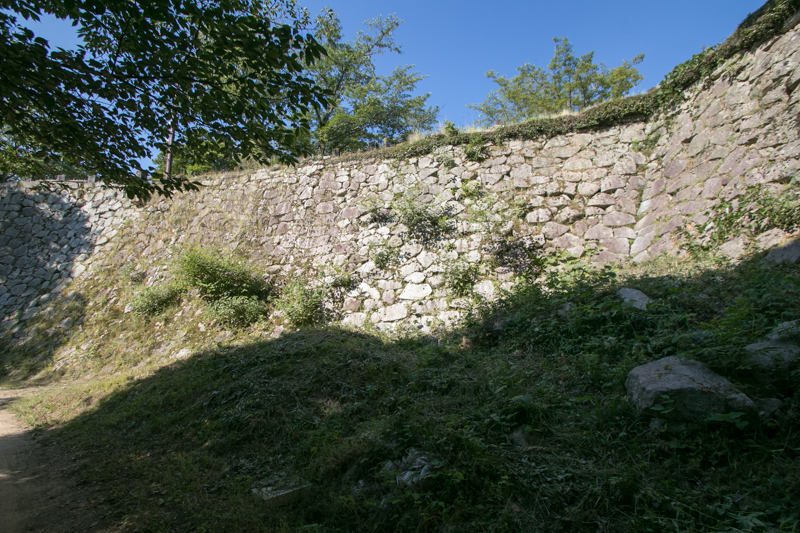 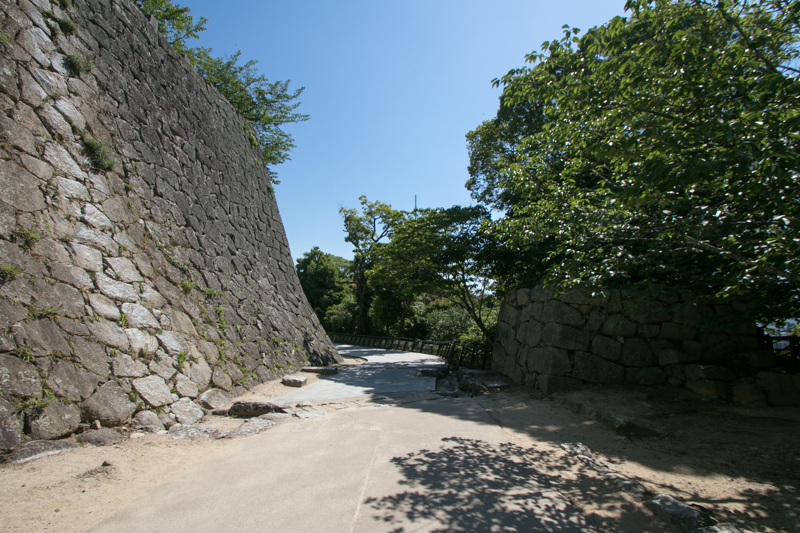 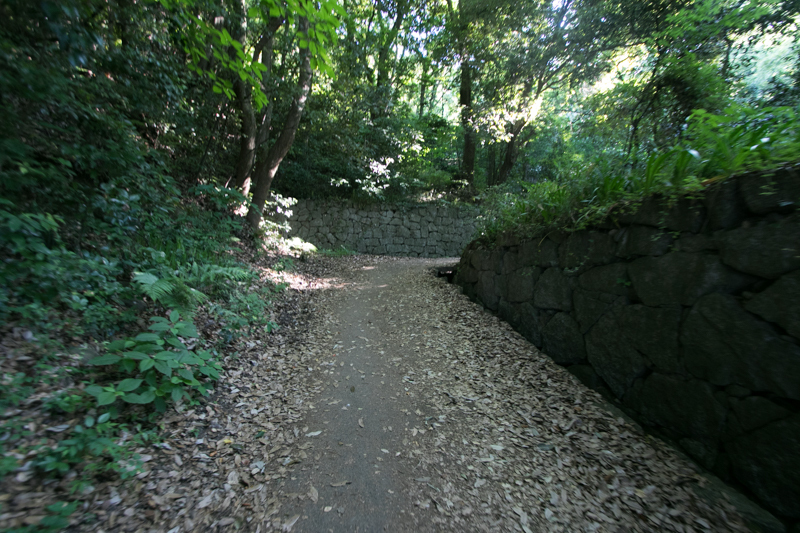 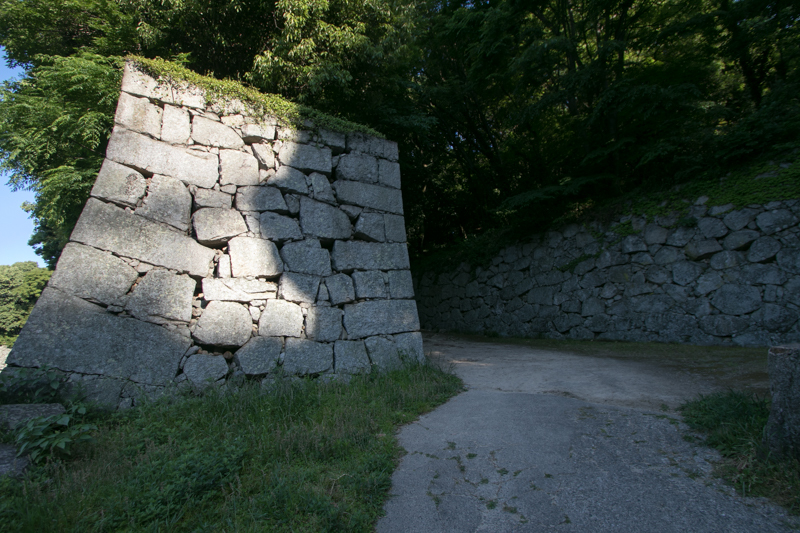 Entrance into secondary area was protected by tall stone walls and water moats. 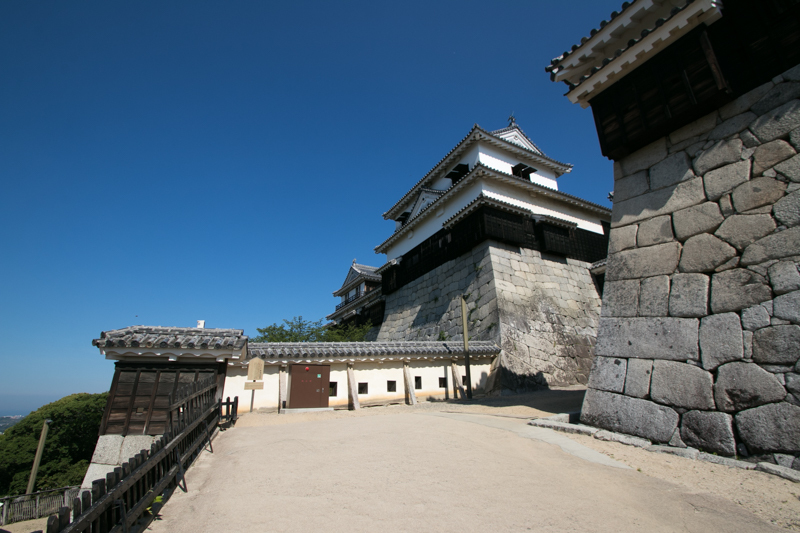 Further, there is large third area of about 500 meter long square, which has a tall clay walls and 50 meter wide water moat. 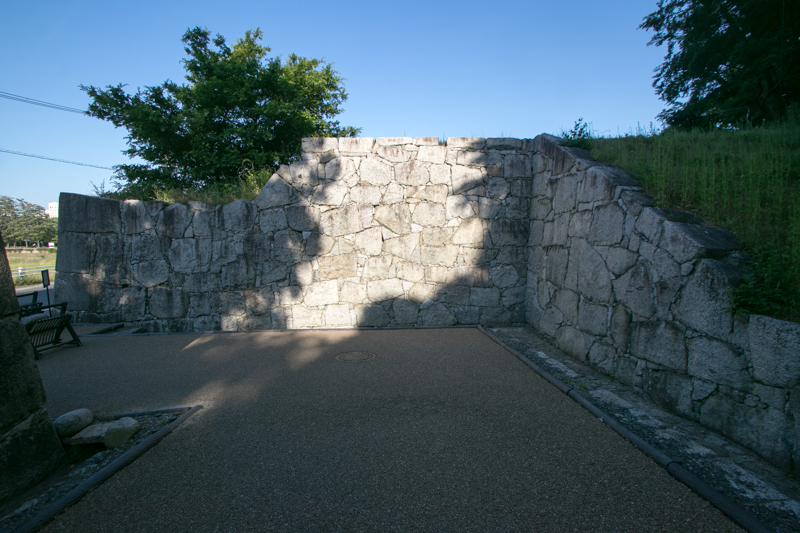 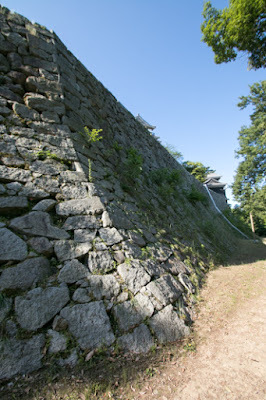 In addition to this, there are line of stone walls at several place of hillside. 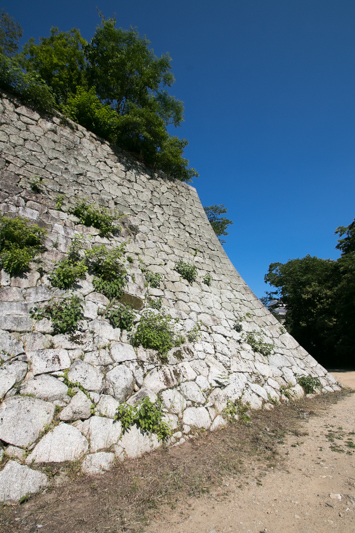 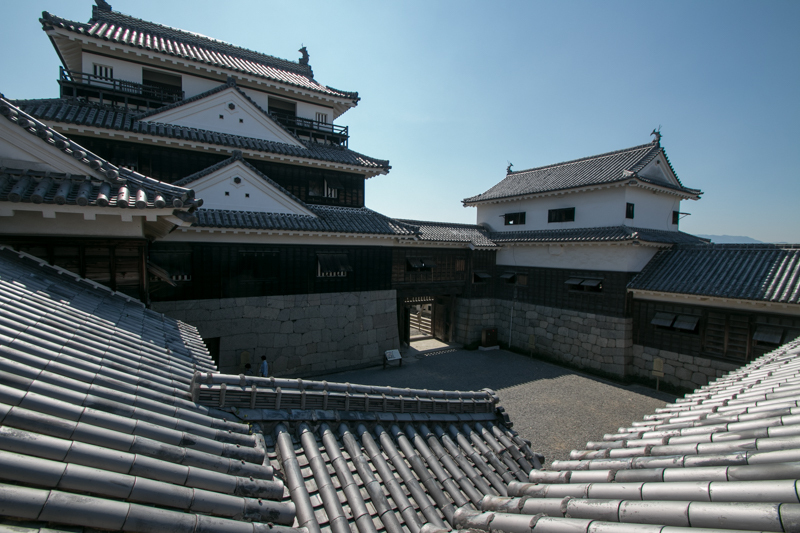 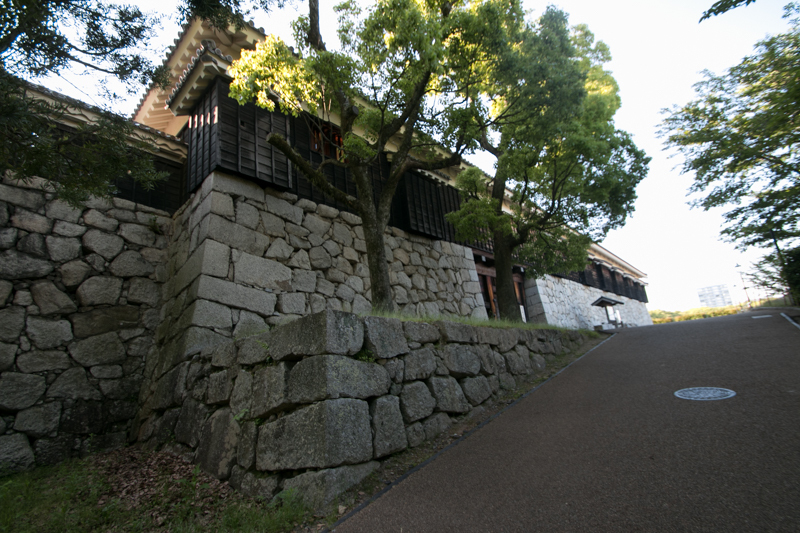 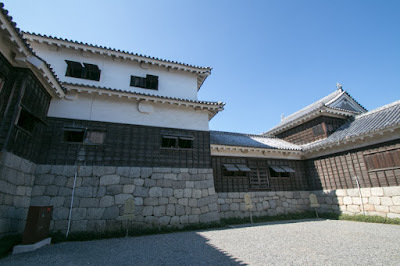 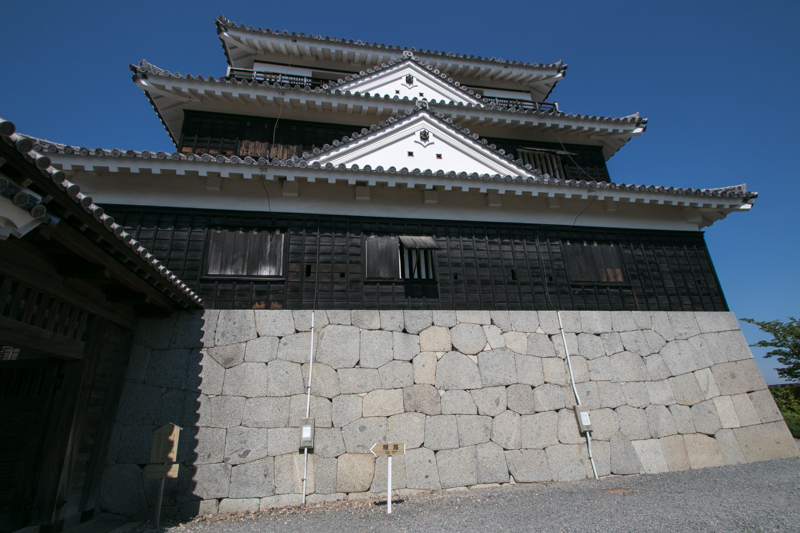 Main tower (Tenshukaku) is usually built in central area, apart from front side of castle. 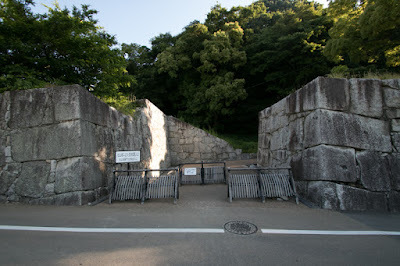 Usually being guarded securely, but in case enemy reached main tower it can only make time for the suicide of commander. 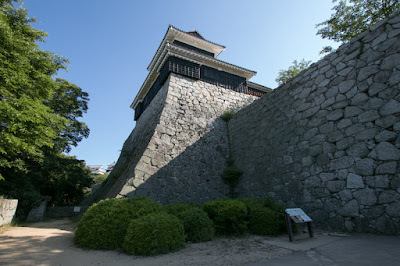 Rather, it is used to observe and control battles of distant front area, and if enemy’s detached force attacks from backside, main tower itself is used as a firing point to approaching enemies because it locates close to backside. 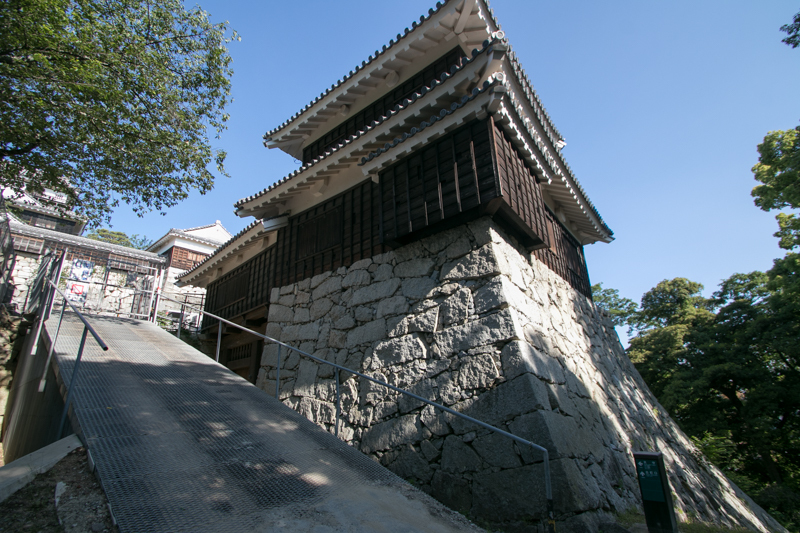 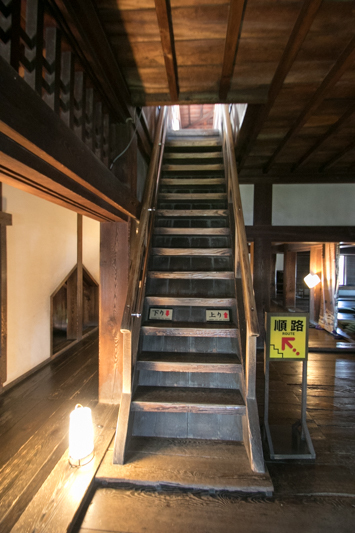 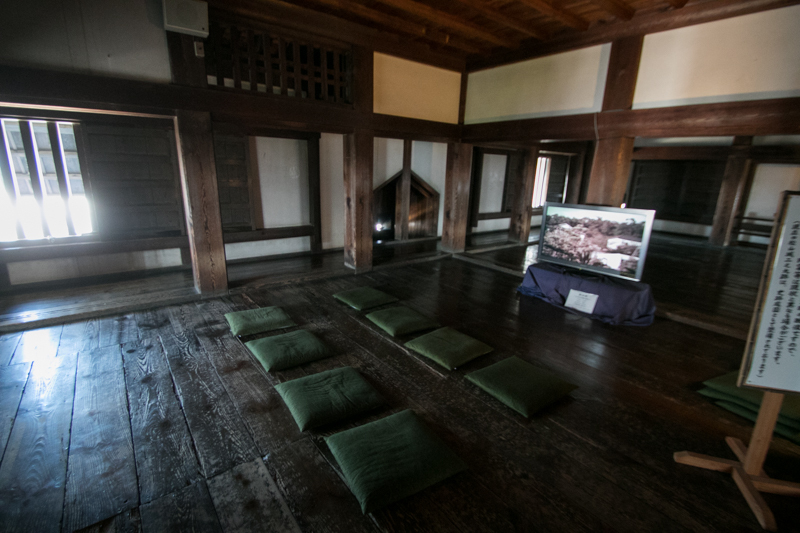 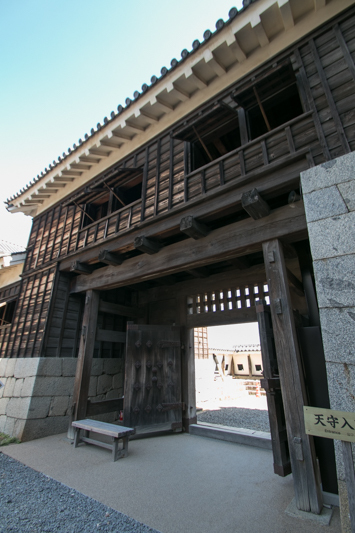 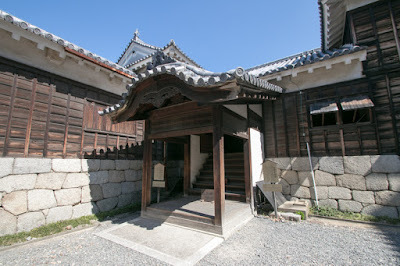 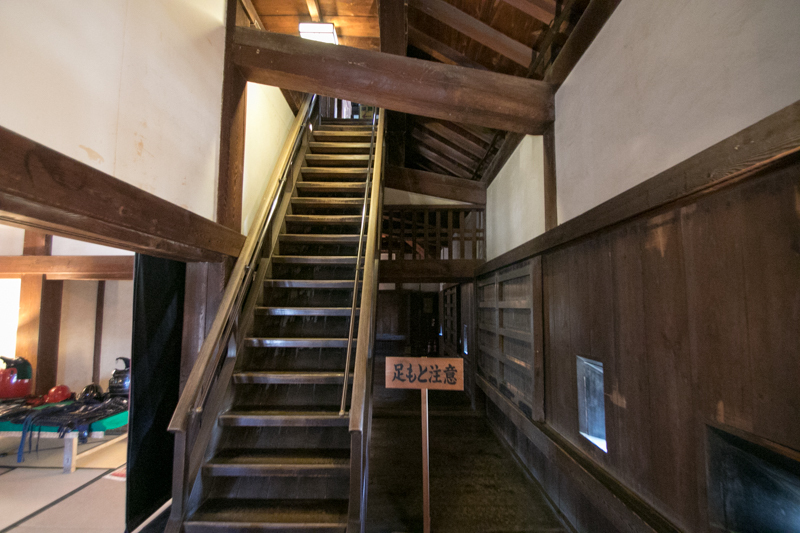 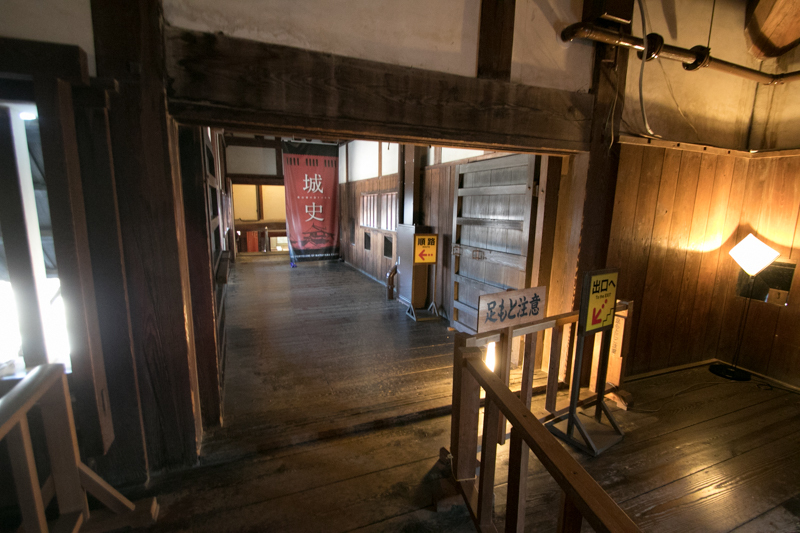 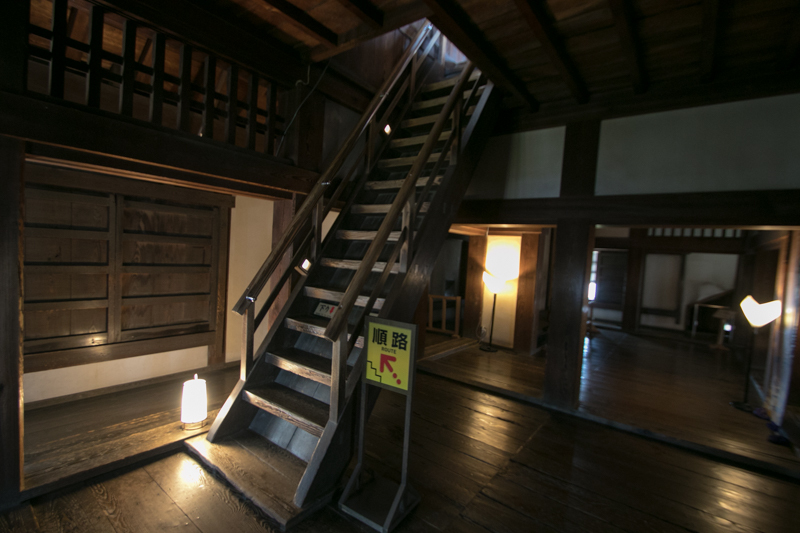 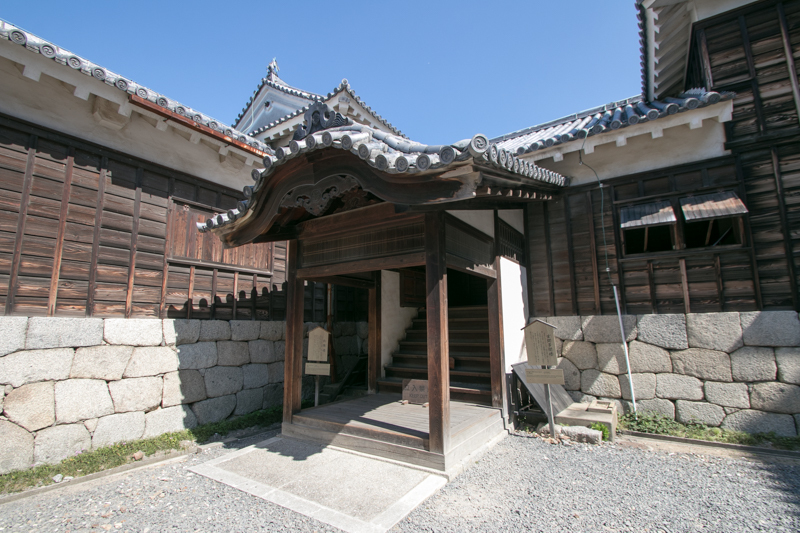 Sometimes small tower is attached to guard the entrance (Kotenshu), or main tower and attached towers formed an independent area (Tenshu Kuruwa). 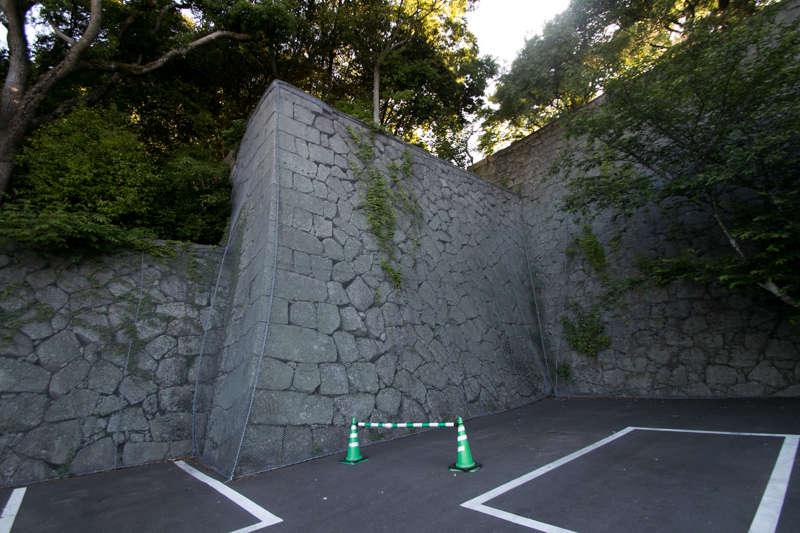 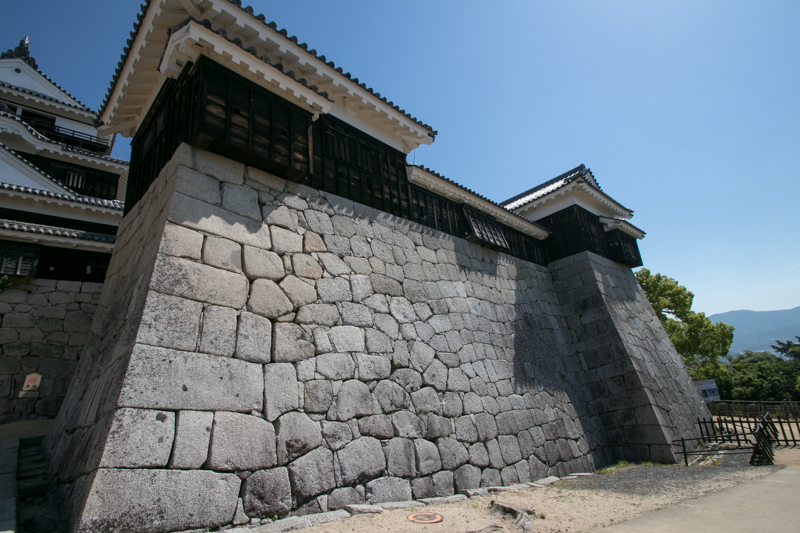 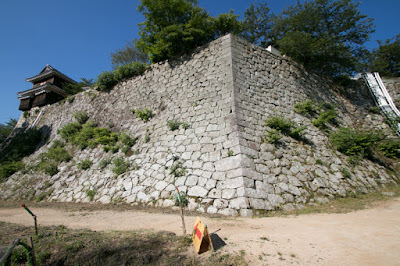 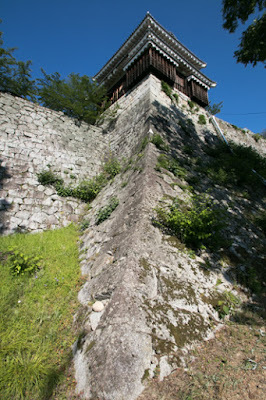 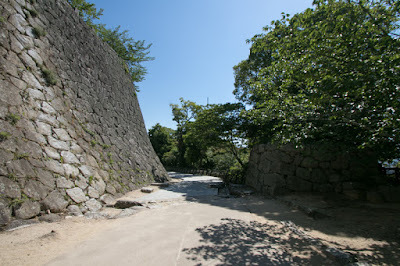 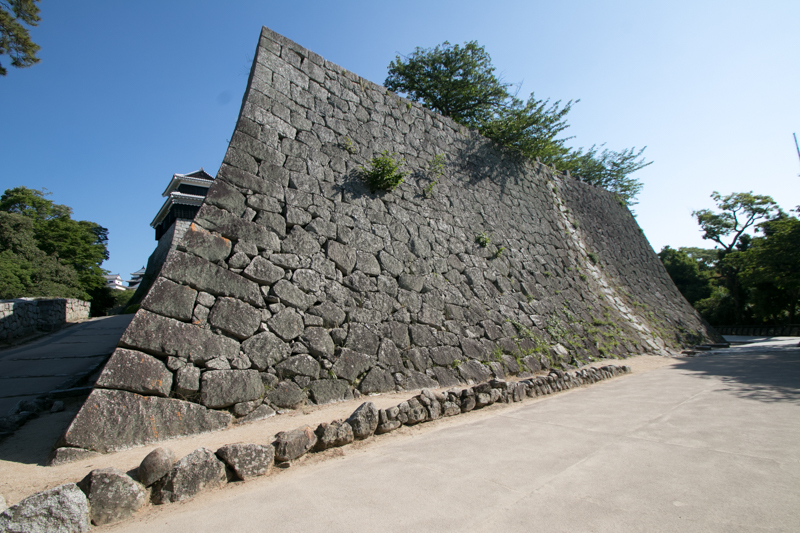 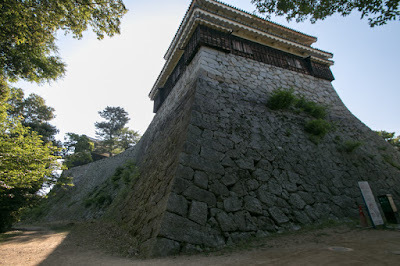 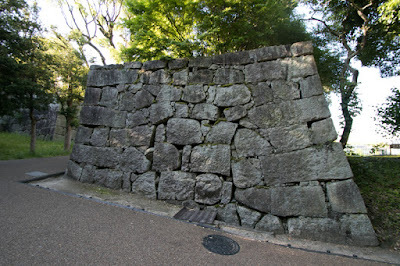 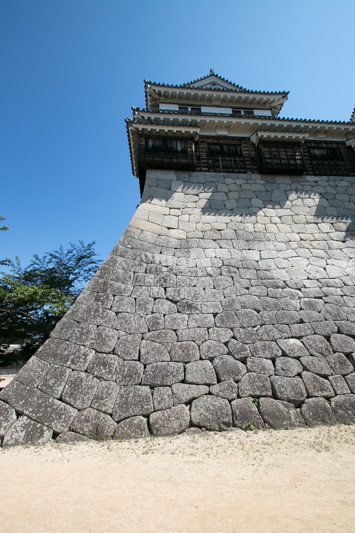 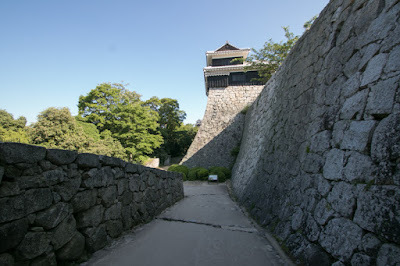 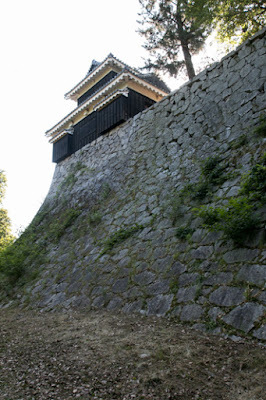 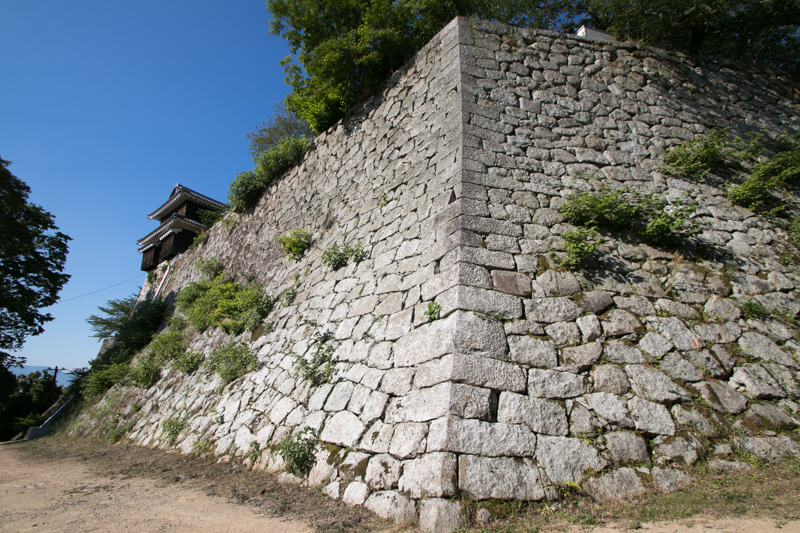 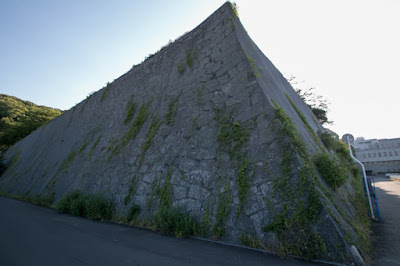 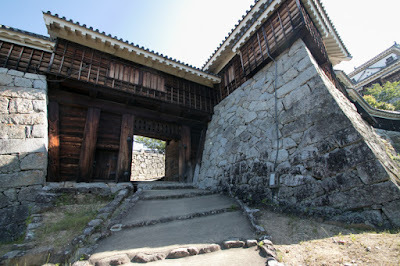 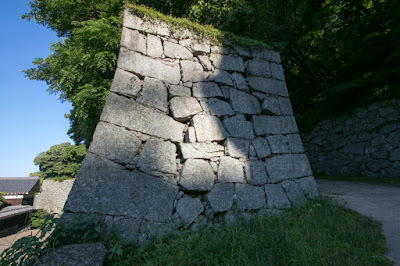 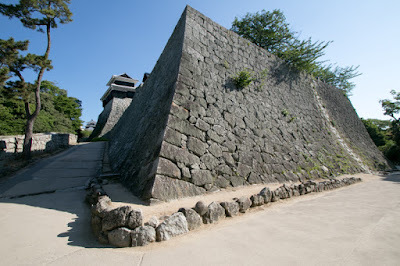 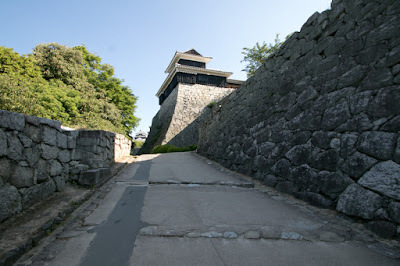 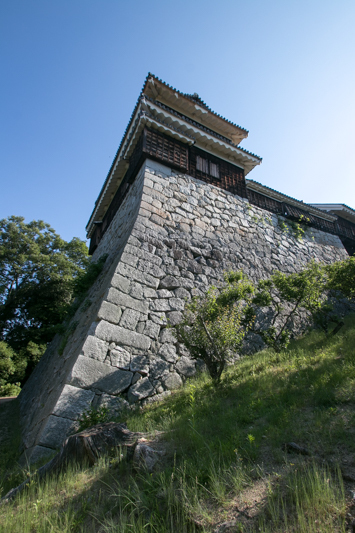 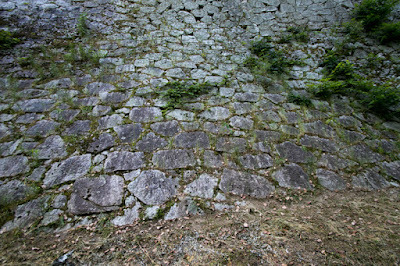 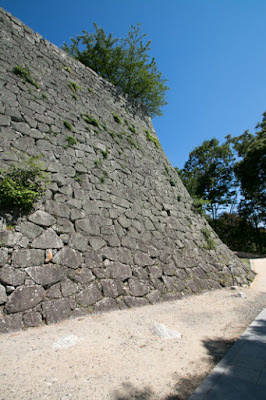 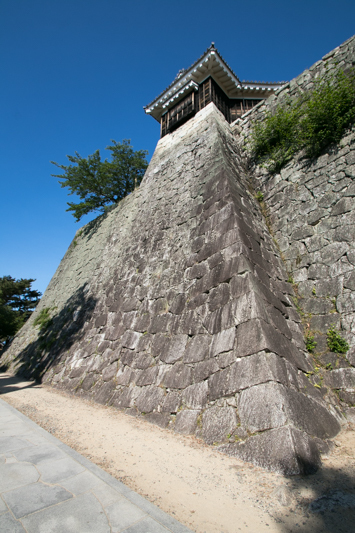 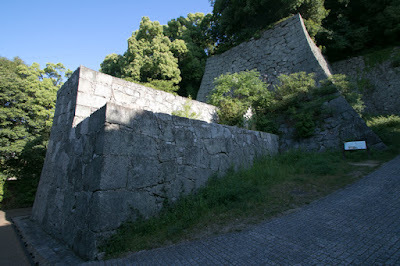 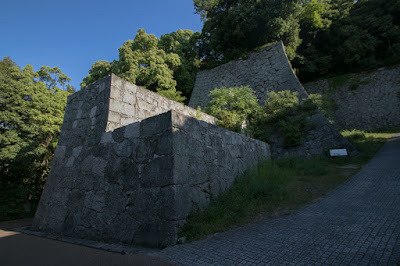 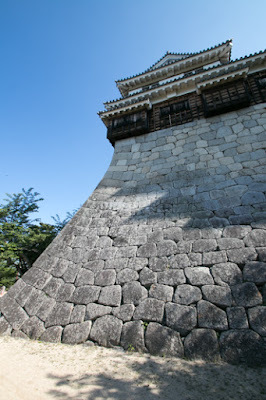 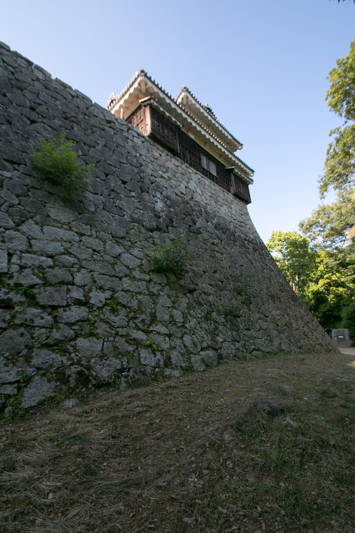 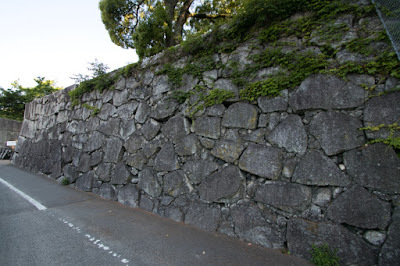 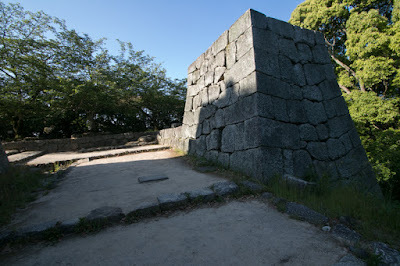 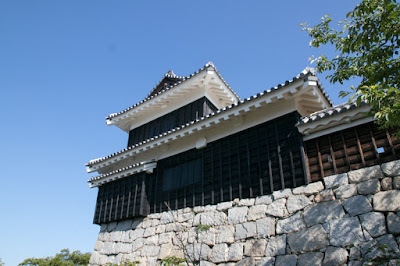 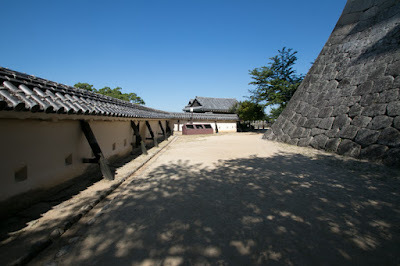 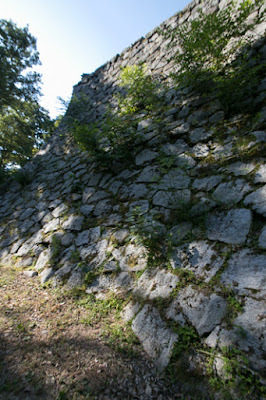 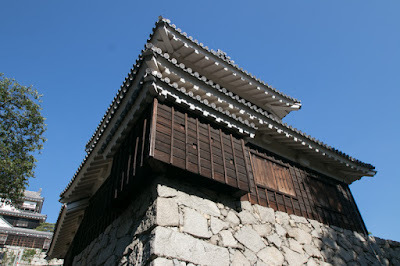 Corner turrets are built usually at the corner of areas, but if side is too long, might be built at the middle of wall. Using corner turret, defense side can minimize dead angle and can easily aim at the bottom of moat or middle of wall. 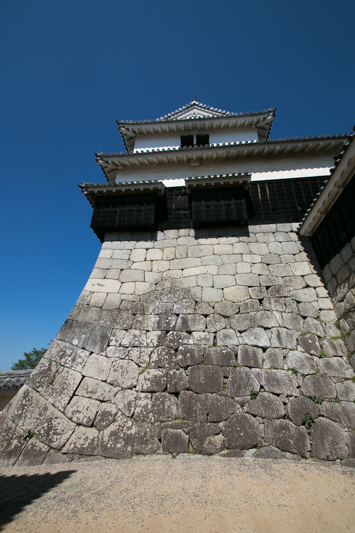 Most of corner turrets are two layers, but single layer turrets are used for small castles or outer areas. 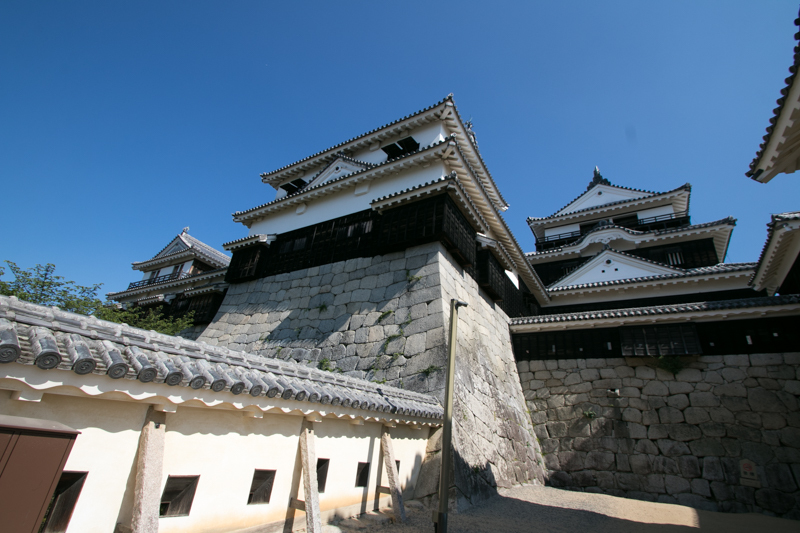 For some castle lacked main tower, three story main turrets are sometimes built as a symbolic substitute of main tower, located at front of castle where easily seen from people. 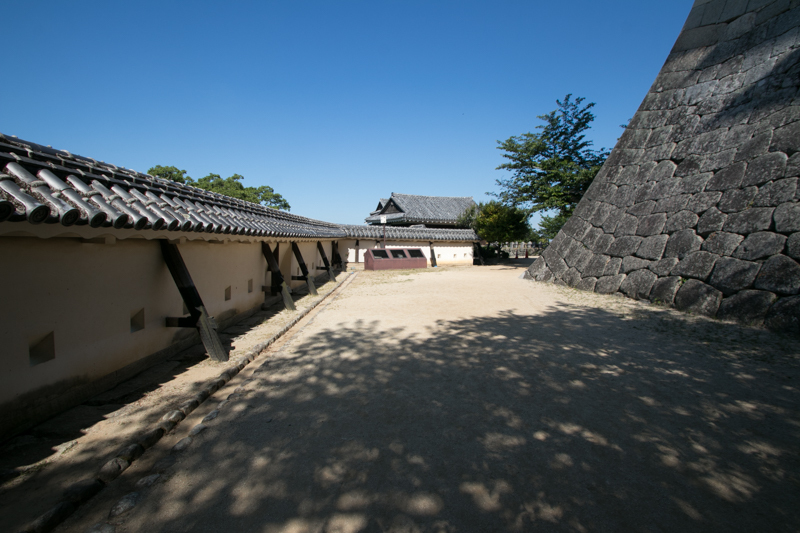 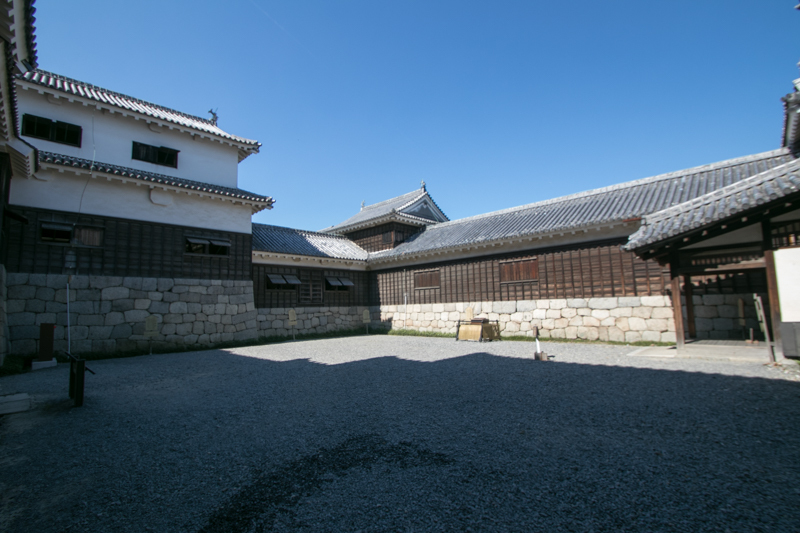 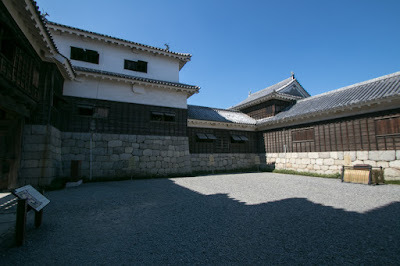 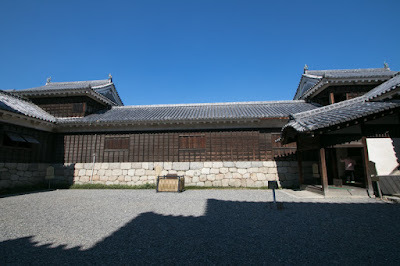 Tamon turret is a long and single layer barrack connecting corner turrets and gates. 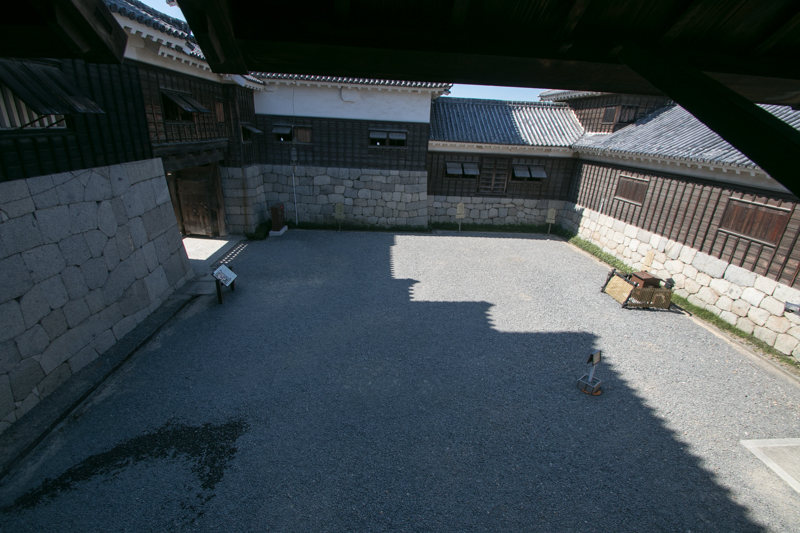 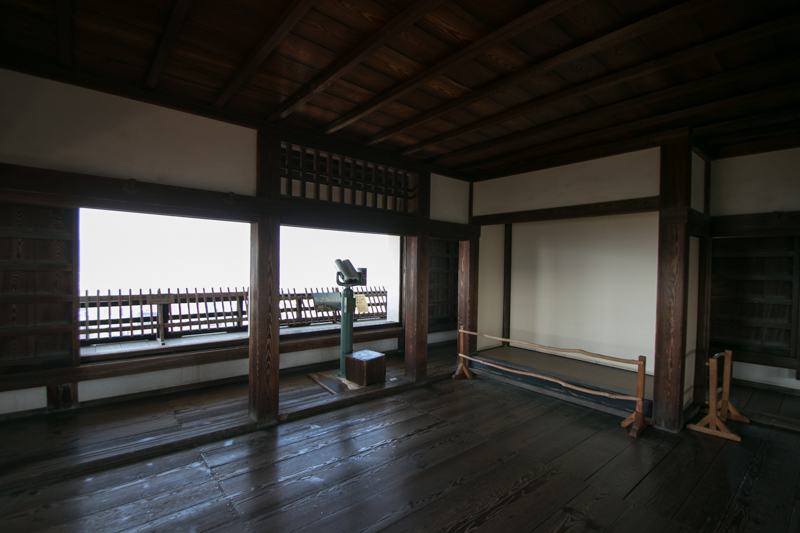 Using tamon turrets, soldiers can use matchlock guns regardless of weather inside the building. 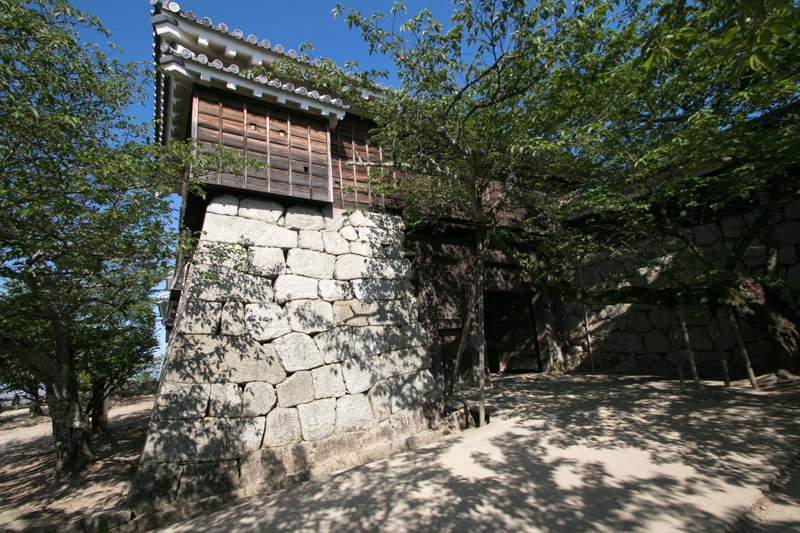 Thus tamon turrets are usually built for important places, such as front side of central area, or between main tower and attached tower. 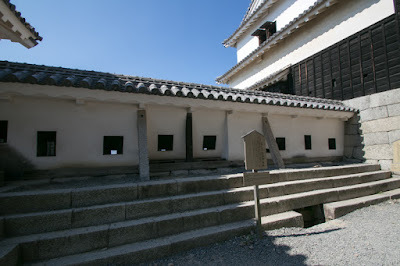 Loopholes were made in the wall for firing arms from inside. Different from western castles, the shape of hole was not cutout but round or triangle small hole. 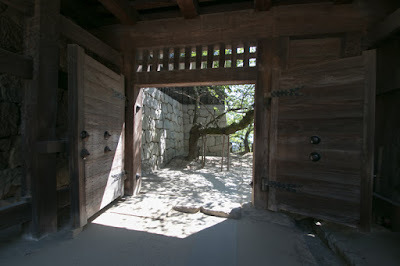 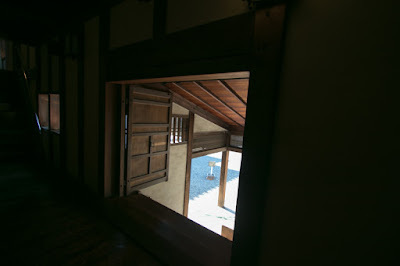 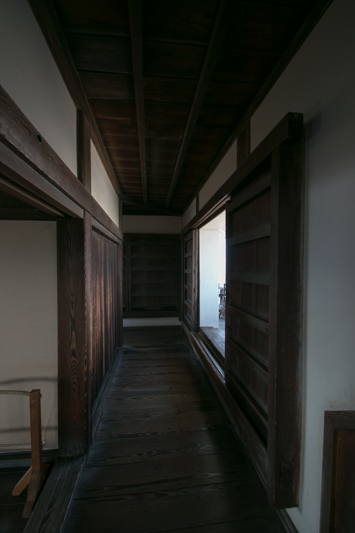 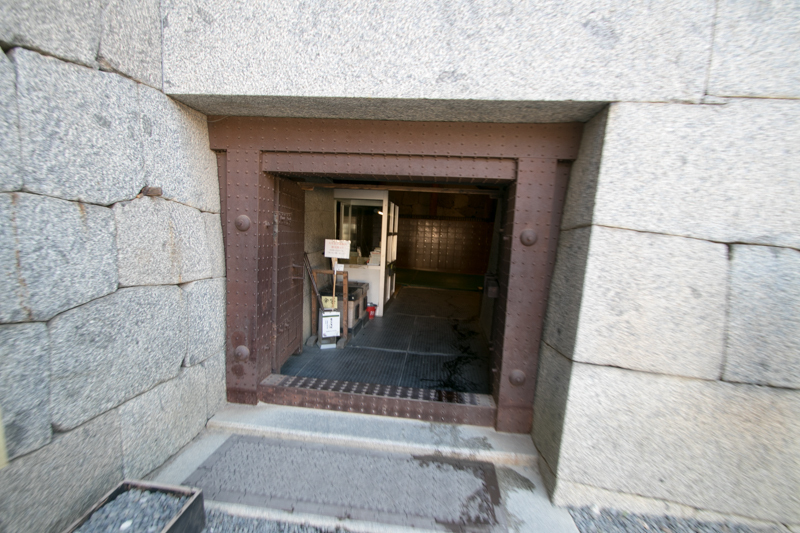 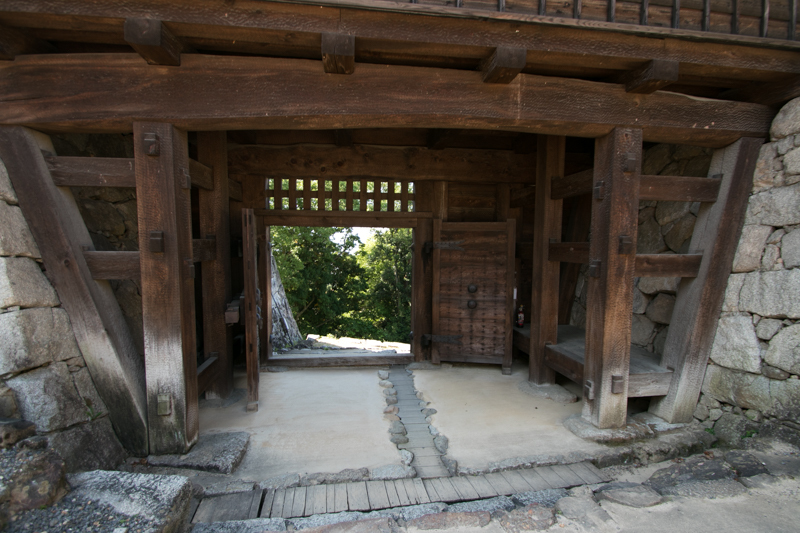 Openings made at exterior aiming at outside is called as Ishiotoshi. The name itself is stone halls, but actually assumed to fire guns or flow boiled water from the hole, to attack climbing enemy soldiers. 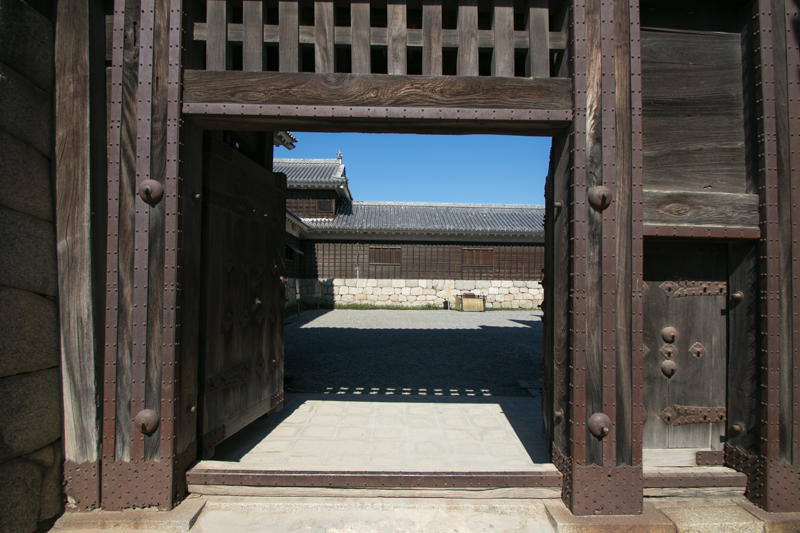 Major gates of modern castles usually consists of two gates and inner space. Inner space is surrounded by stone walls, and even if first gate is broken enemy soldiers has to stay in narrow inner space before secondary gate, and faces crossfire from surrounding walls. To avoid direct shot of cannon to secondary gate, secondary gate faces right angle from first gate. 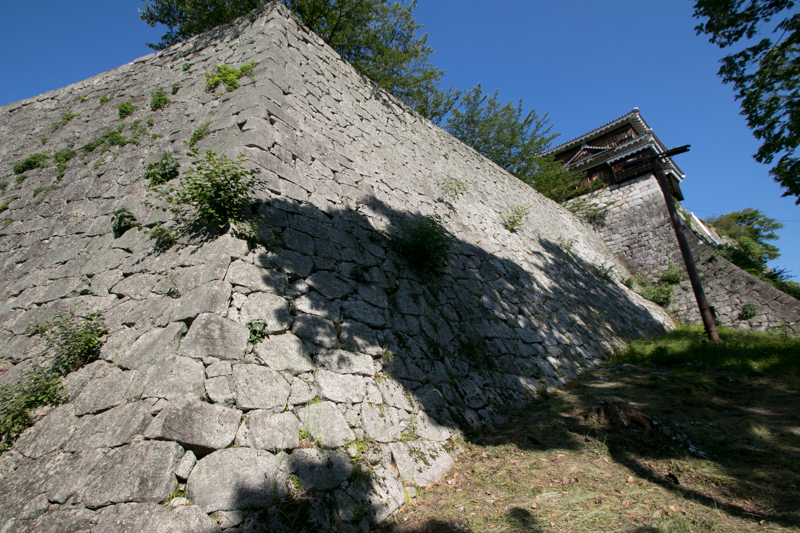 Plain castles are usually surrounded by moats, to prevent approach of enemy soldiers. 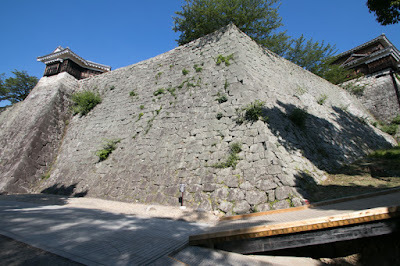 Water moat is more defensive but empty moat is also used to utilize as kill zone. For mountain castles the height difference itself is obstacle to attackers, but sometimes equipped at entrance or loose slope. 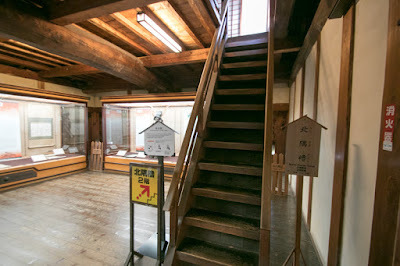 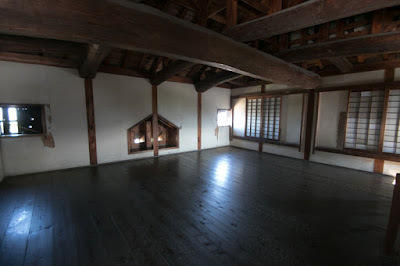 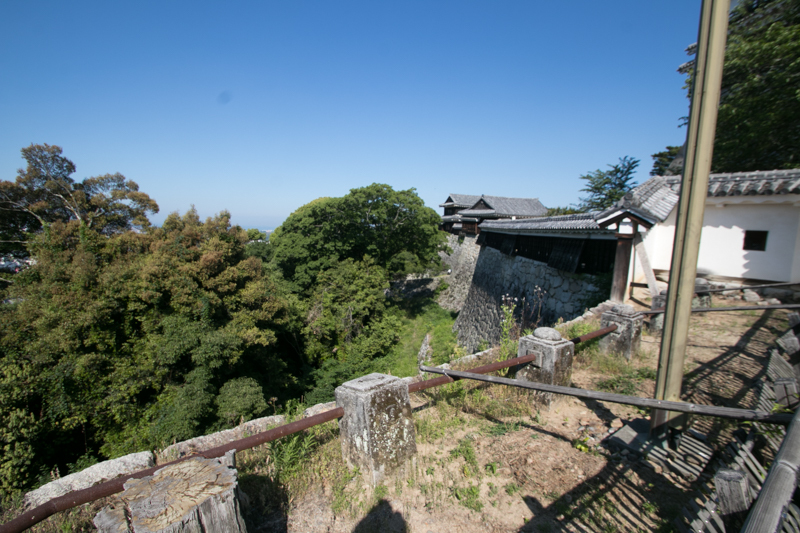 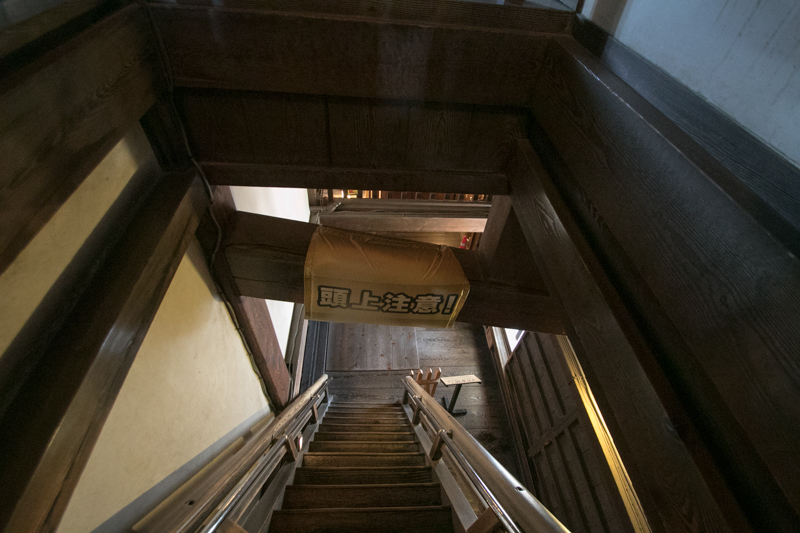 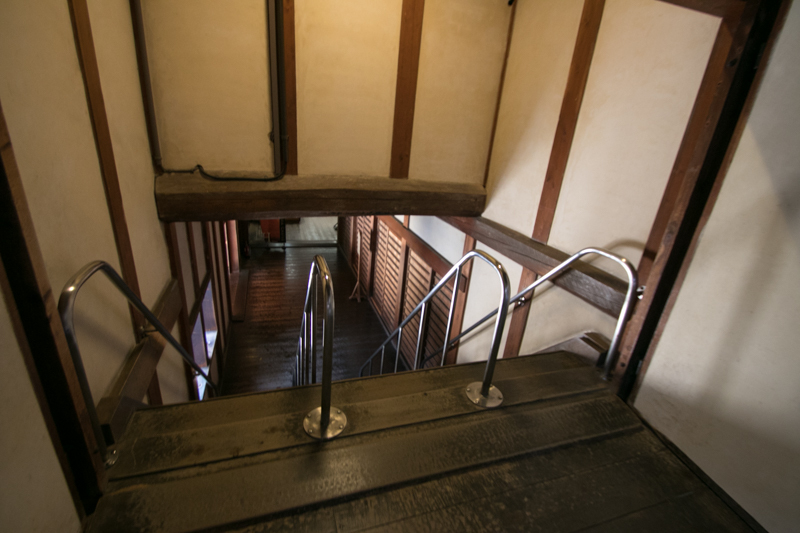 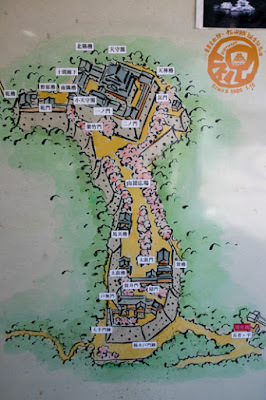 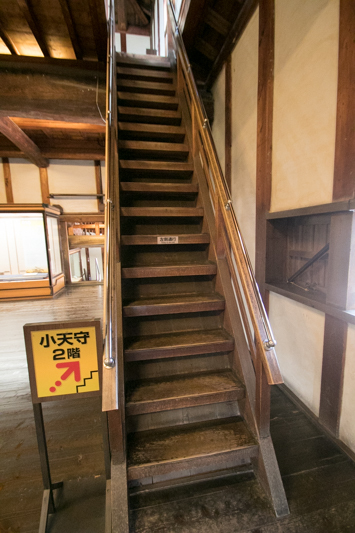 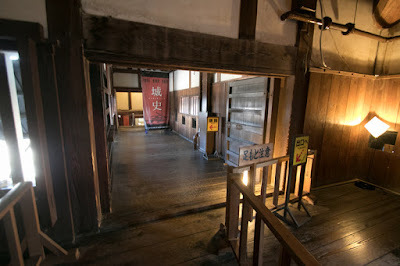 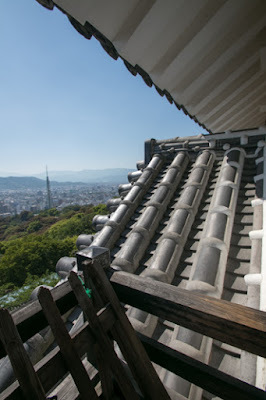 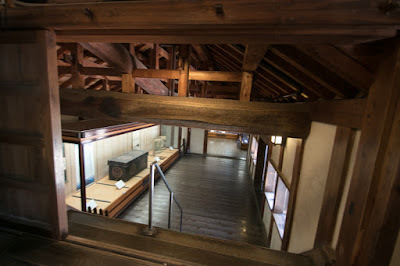 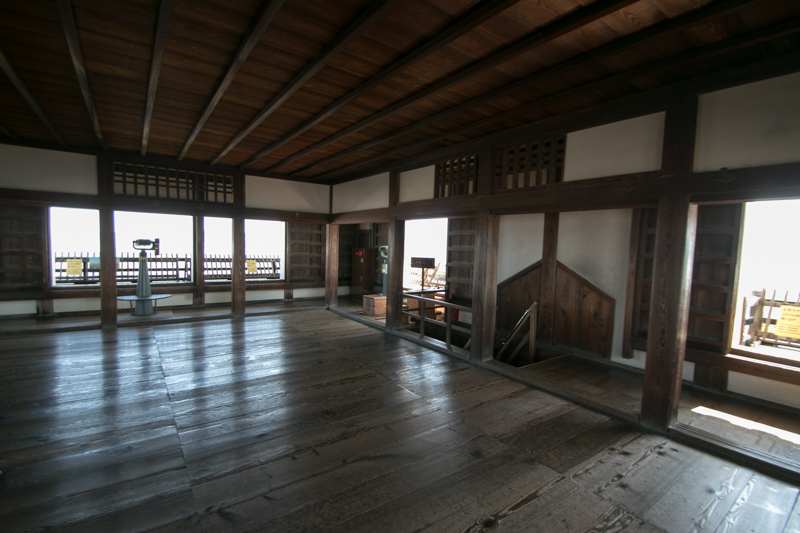 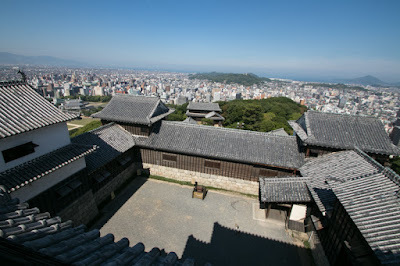 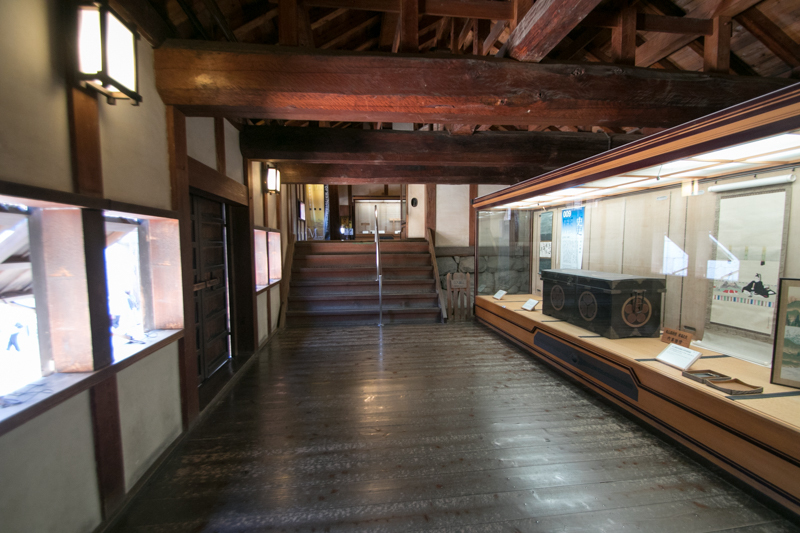 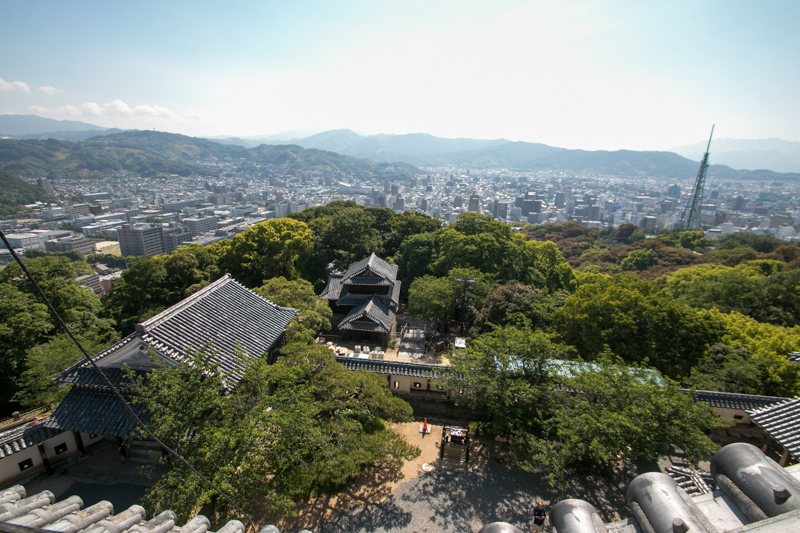 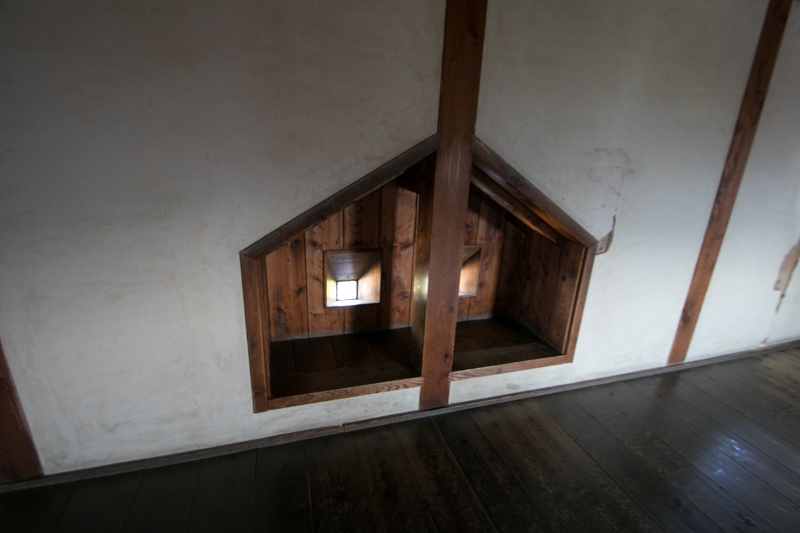 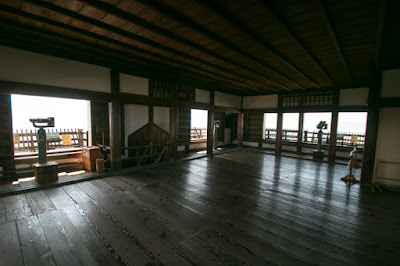 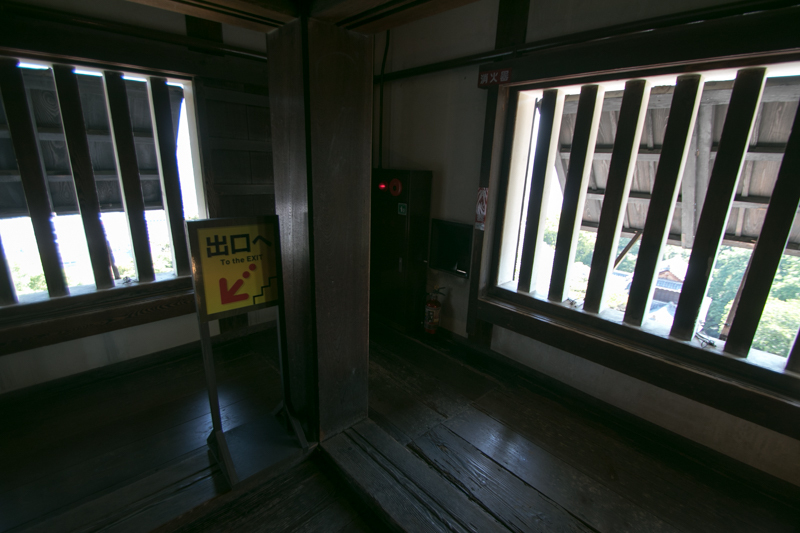 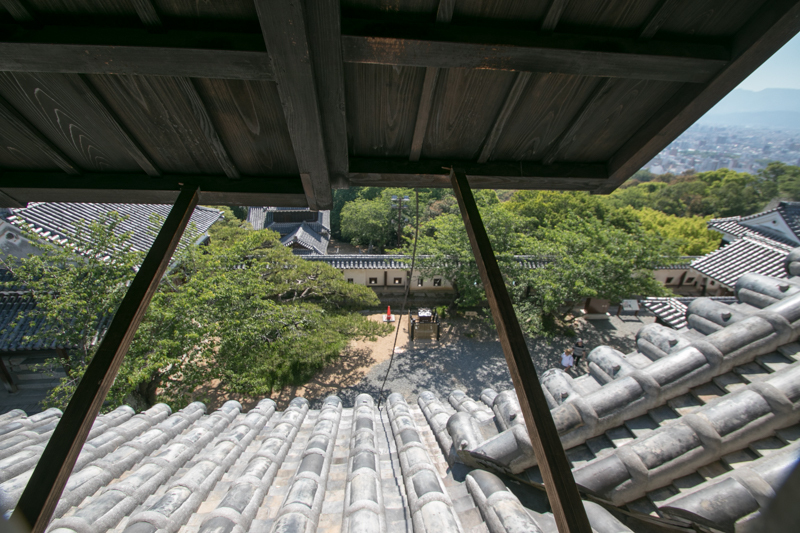 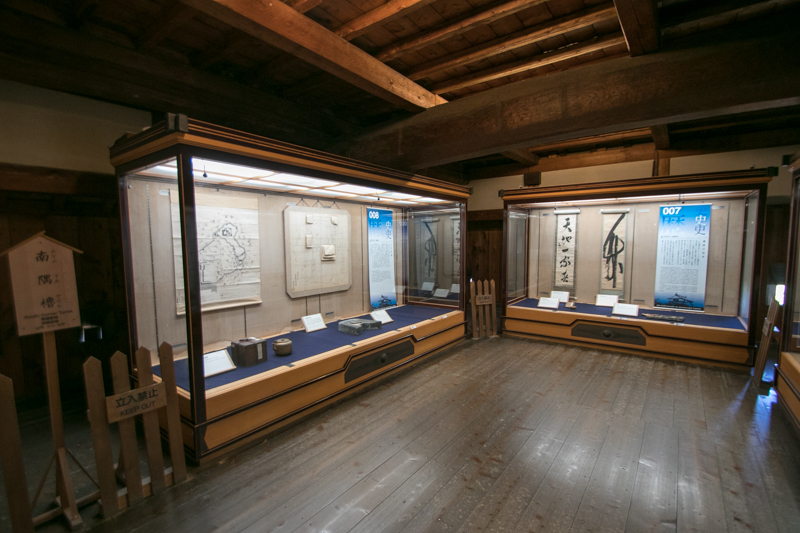 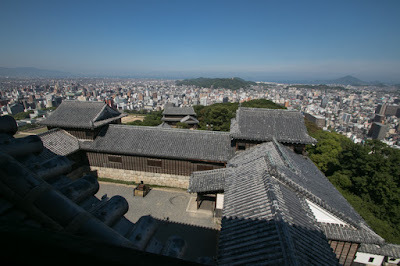 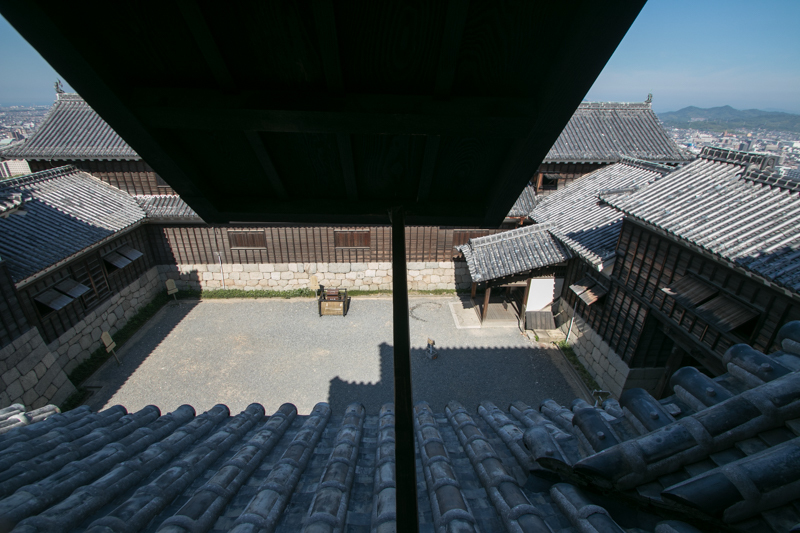 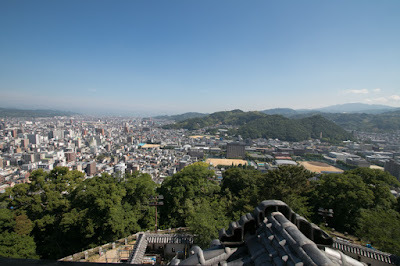 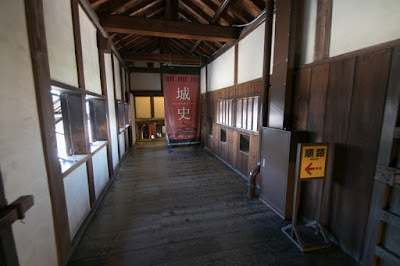 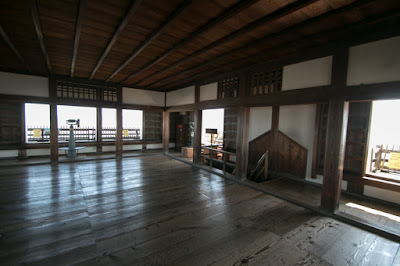 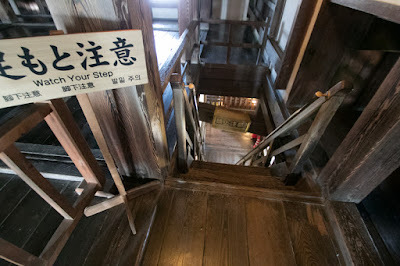 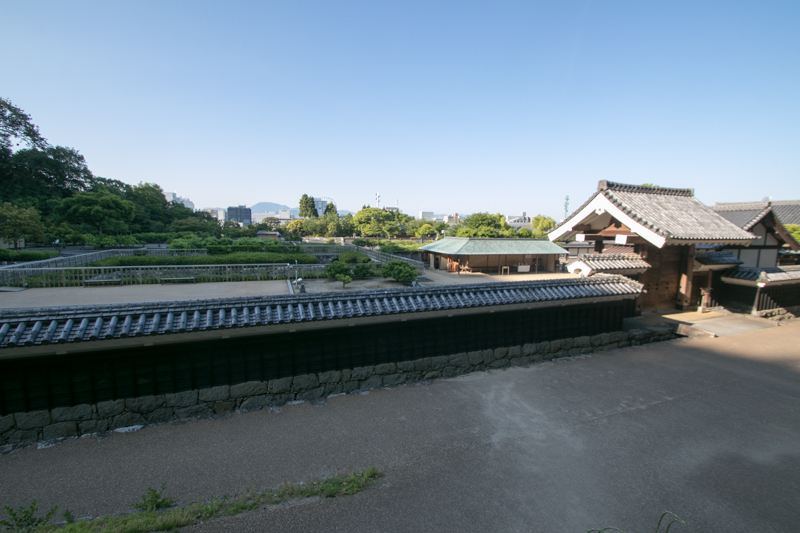 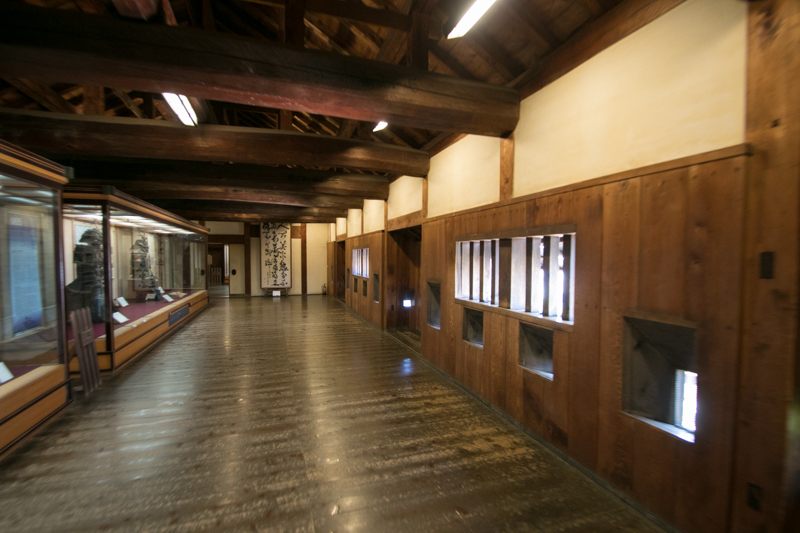 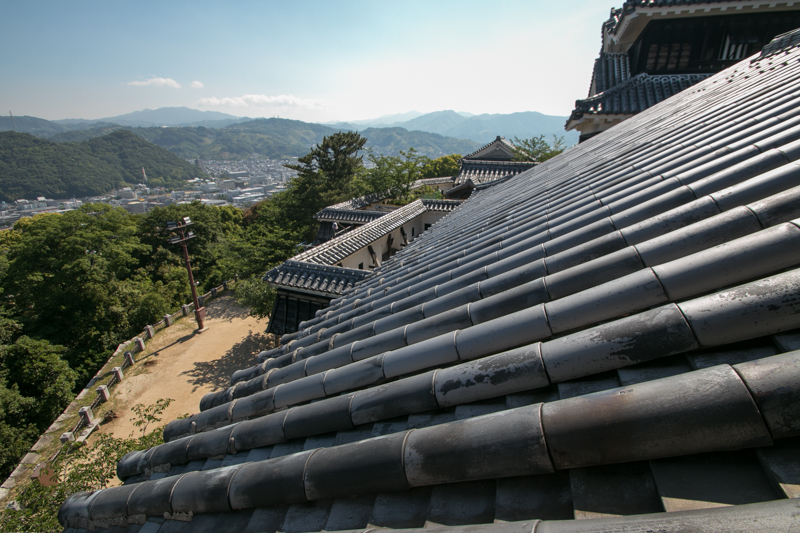 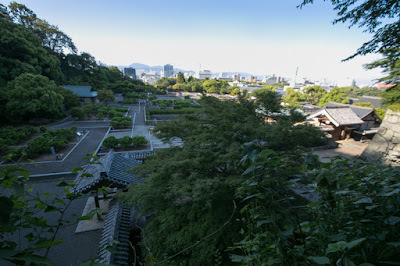 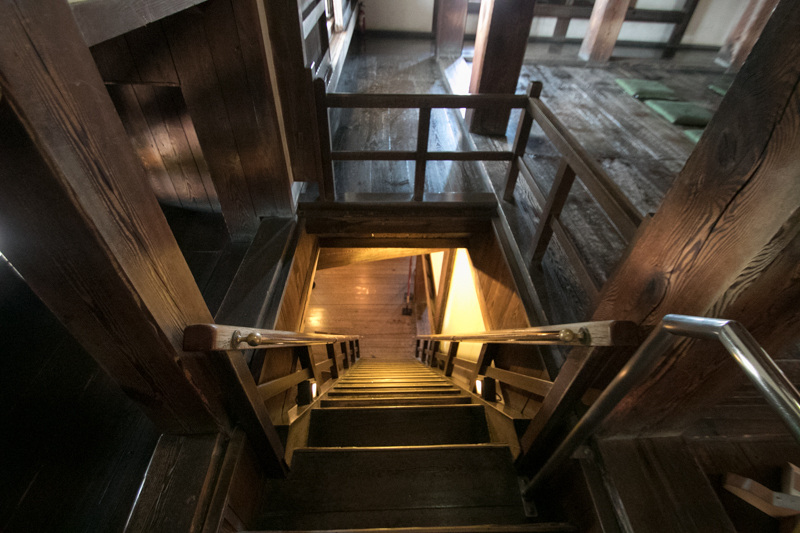 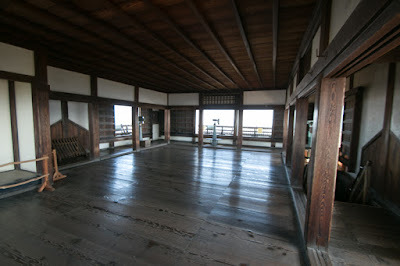 We can see all elements of above facilities in Matsuyama castle. 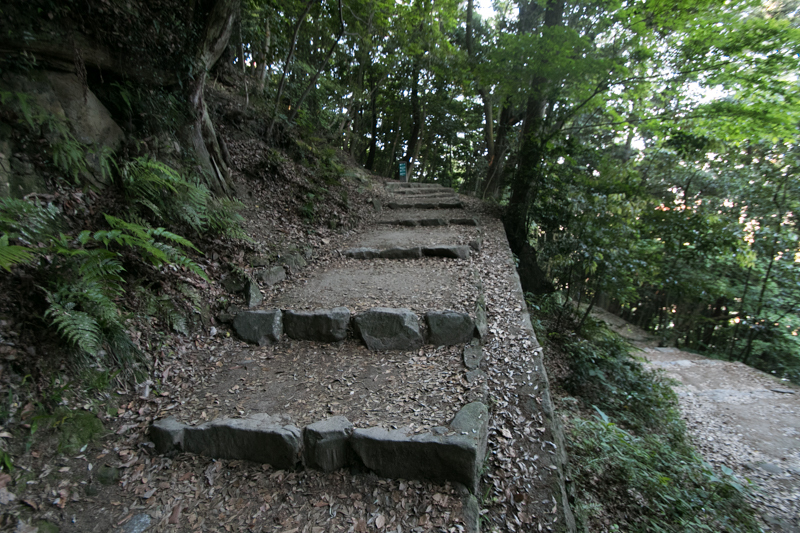 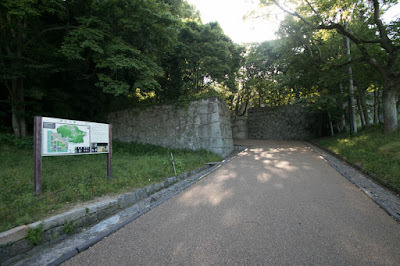 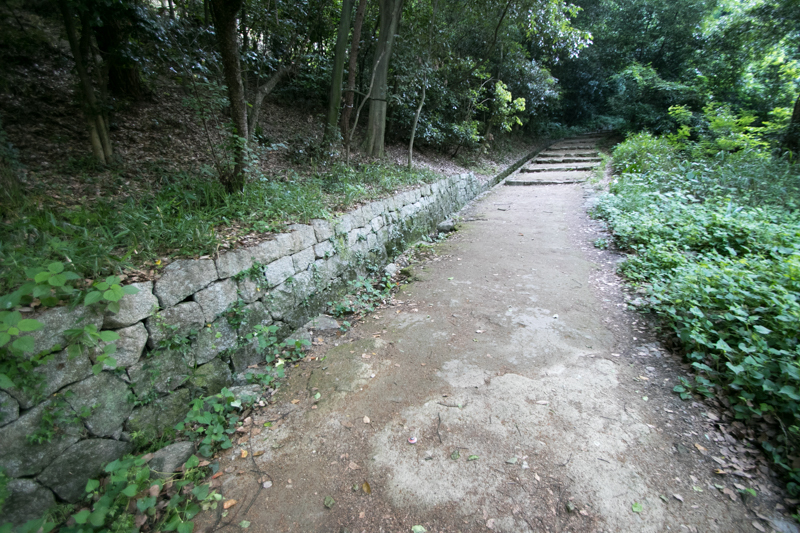 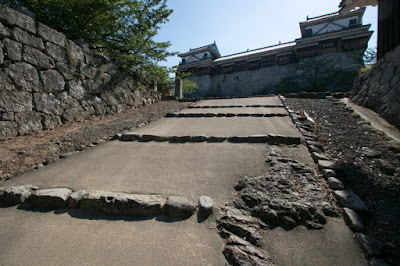 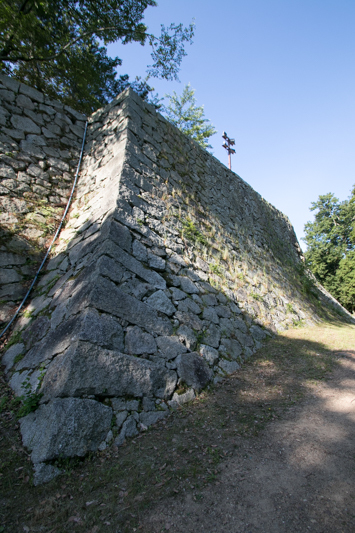 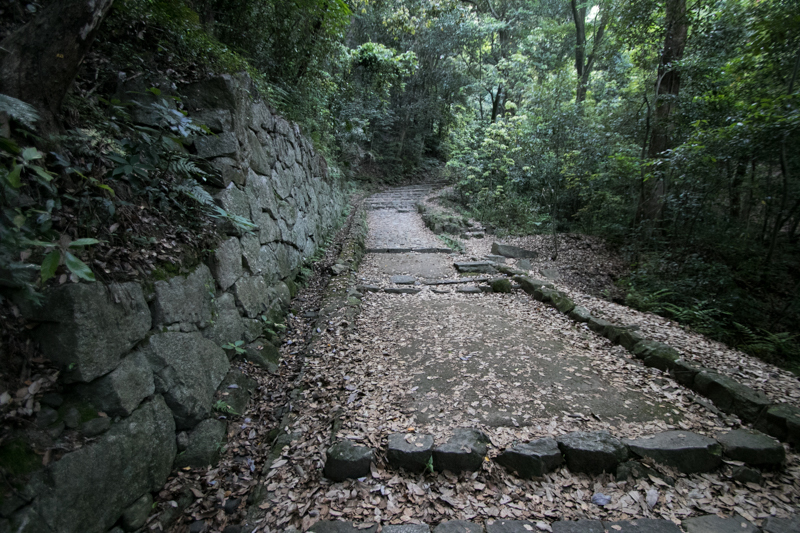 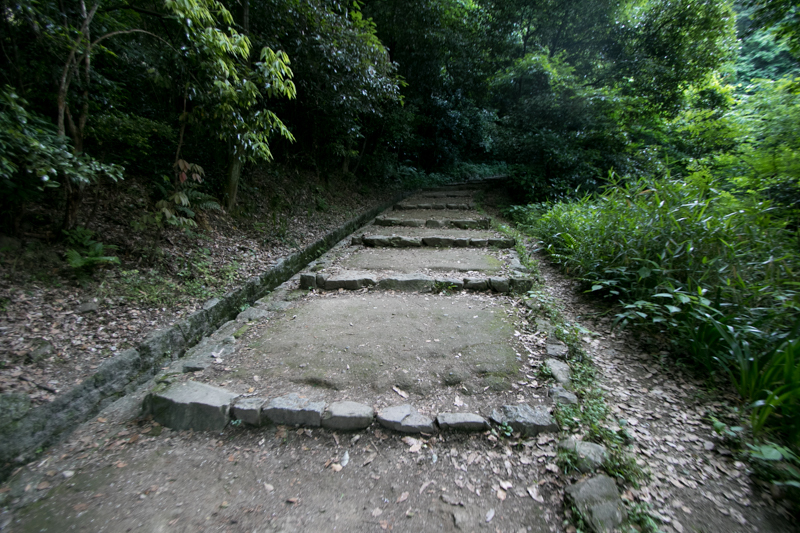 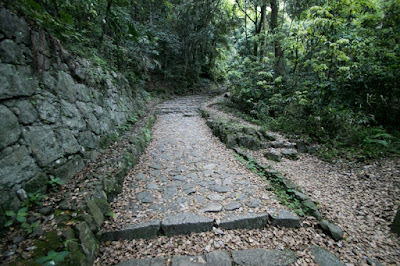 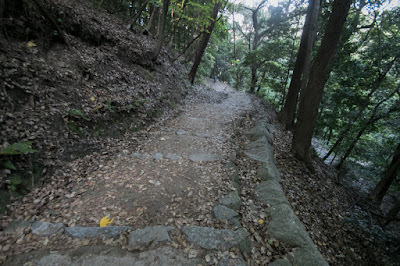 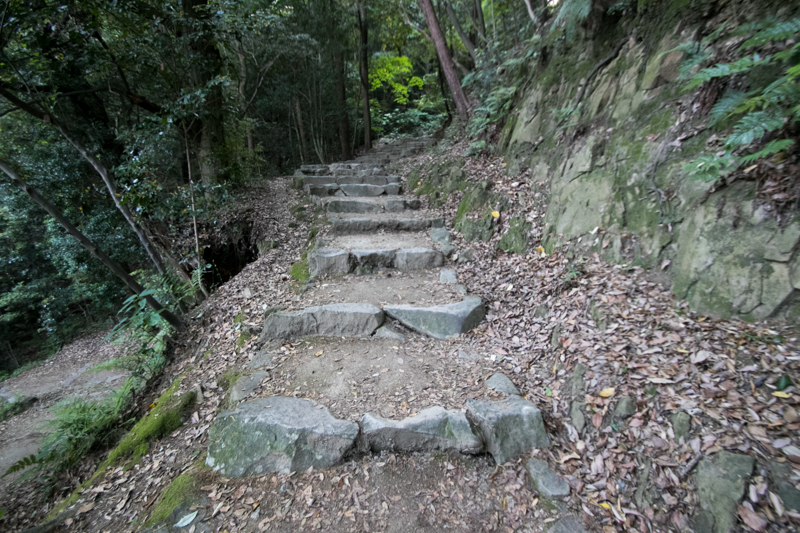 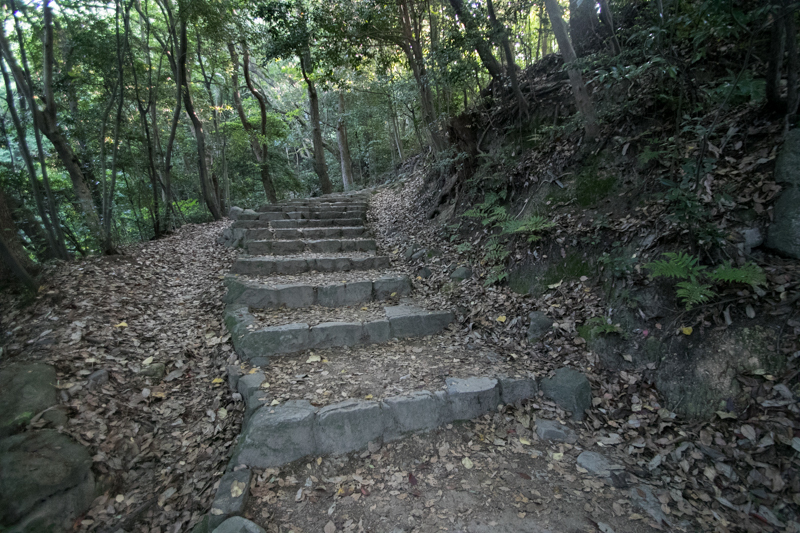 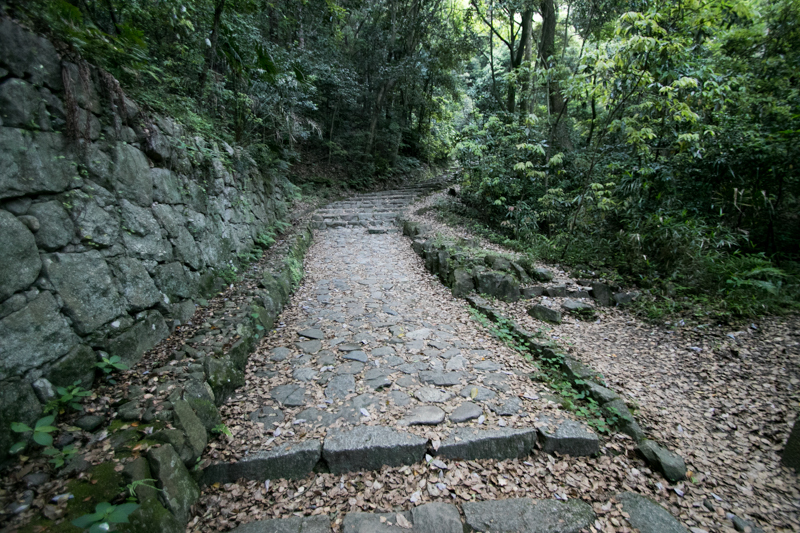 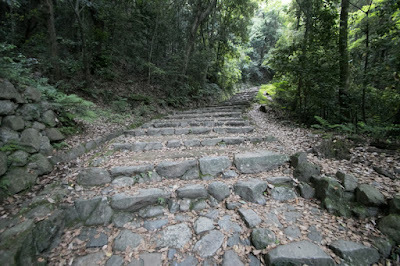 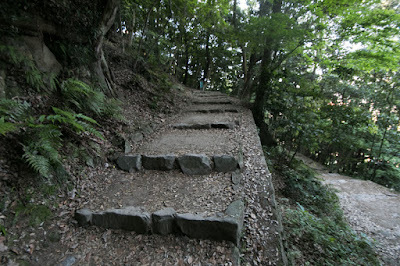 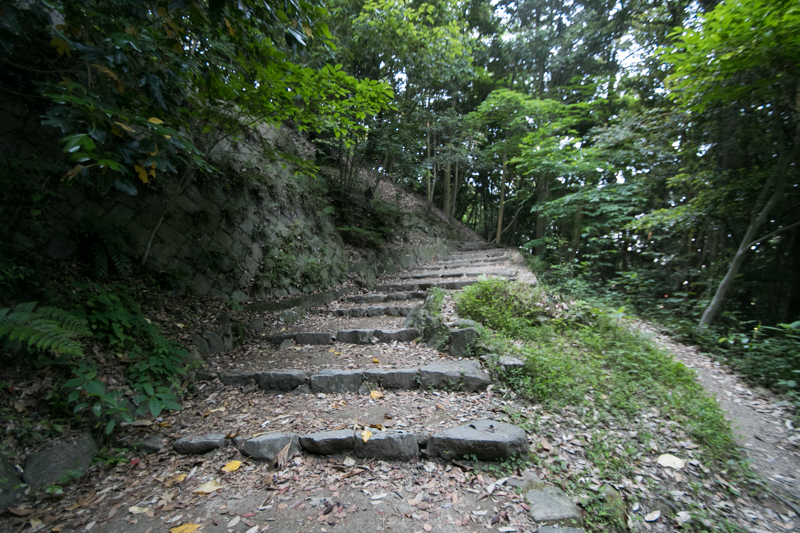 Subsequent to Meiji revolution, the site of castle was used as a base of Japanese army, and buildings on the mountain including relatively new built main tower were preserved. 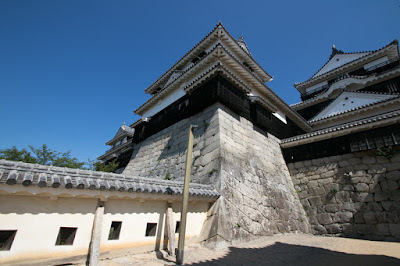 Attached tower and some turrets were lost by accident or war, but main tower, six turrets and gates still remain and show us complete structure of castle along with reconstructed buildings in old wooden style. 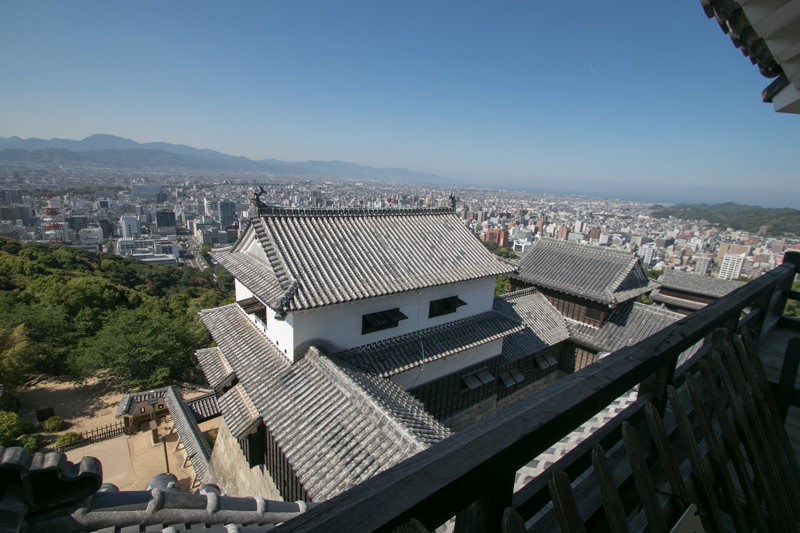 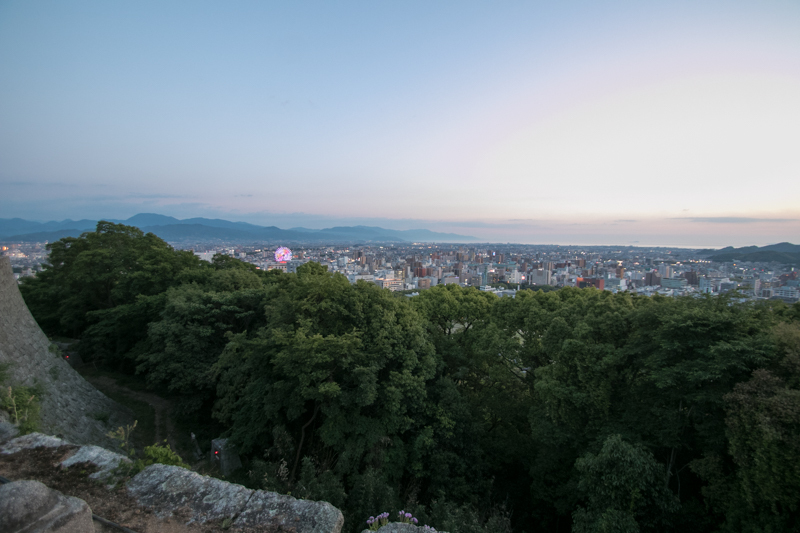 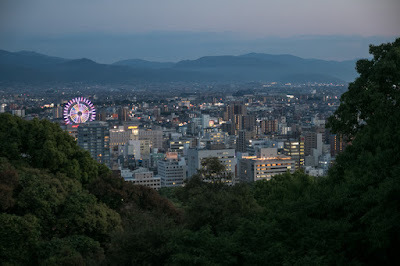 Today Matsuyama castle forms the atmosphere of Matsuyama city as a historical town and becomes major sightseeing spot, along with Dogo-Onsen spa. 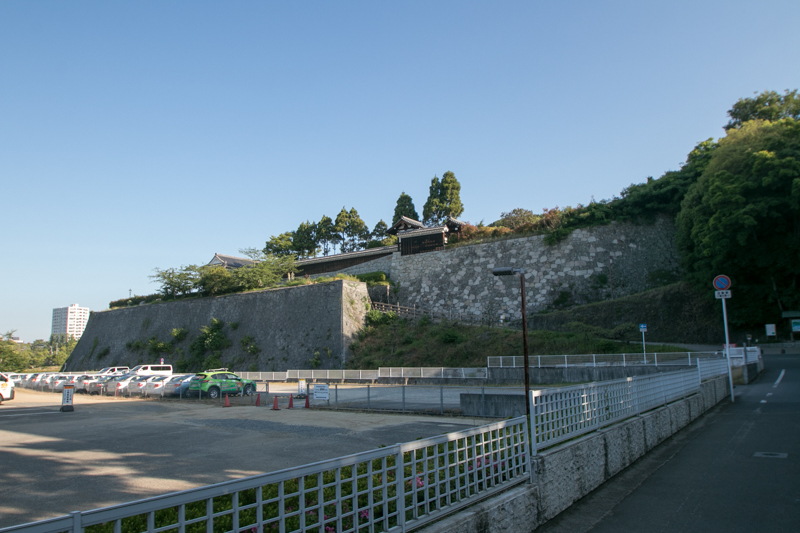 Kenchomae station of Matsuyama City tram or 20 minutes walk from JR Shikoku Yosansen line Matsuyama station. 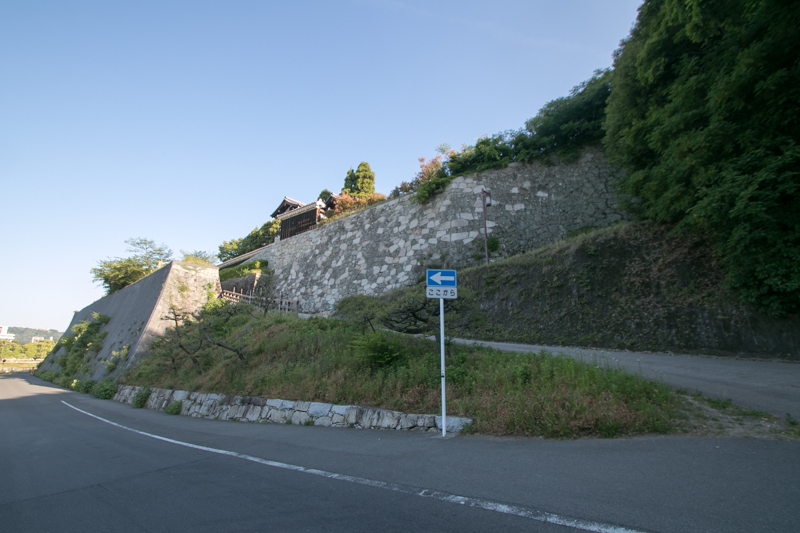 30 minutes drive from Matsuyama Jidoshado Expressway Matsuyama interchange.